Forget the hard sale local set ups and go with these guys . Honest , good value great service. We’ve had our tub for 7mths now and especially looking forward to the winter dips ! Arun has been brilliant. 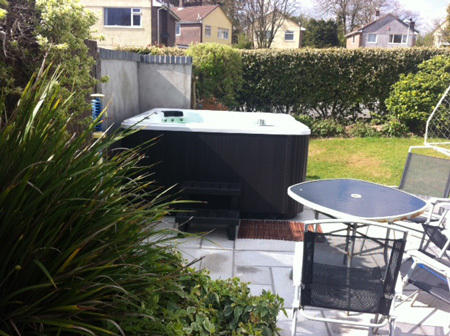 Peter ordered the Duke Deluxe Spa Touch hot tub in pebble grey with steel grey cabinet . I have been a customer with Arun and the team for 5 years now. Their level of commitment to their customers is second to none. Always a pleasure dealing with the team at hot tub suppliers. 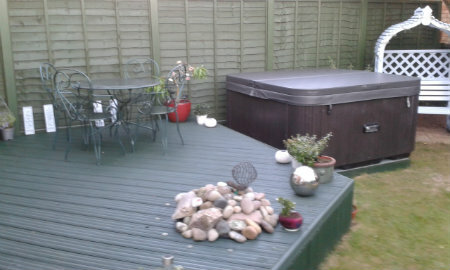 Just thought you'd like to see how the hot tub looks now we have finished landscaping. 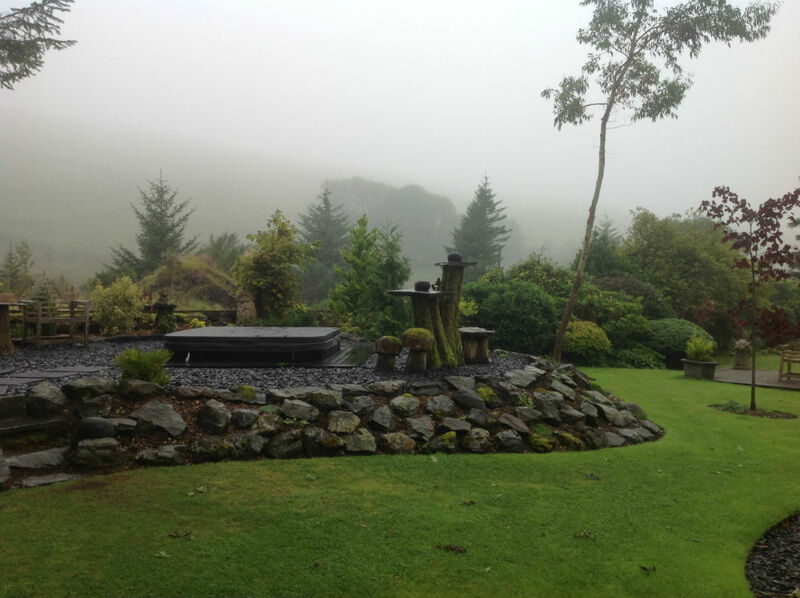 As you can see it looks amazing - even in misty drizzle, so when the sun shines(if ever in Wales) we are going to be truely blessed. 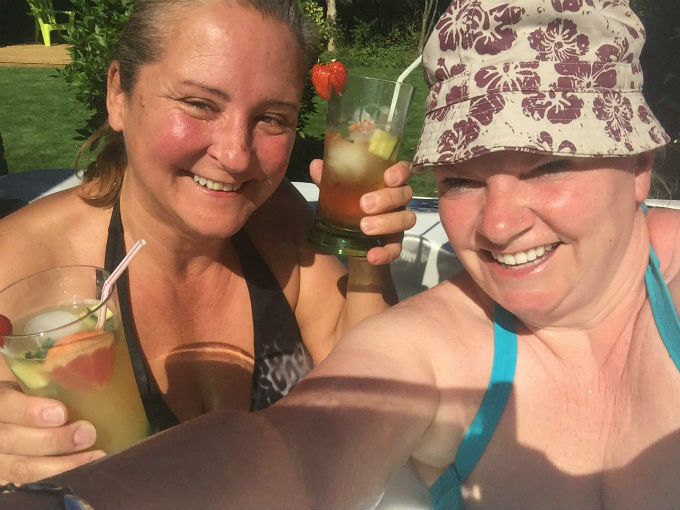 Thank you for all your cooperation over the past few weeks - as you know, there were a few problems that needed ironing out - but you dealt with them efficiently and professionally and we are now enjoying the hot tub on a daily basis. I wanted to say thank you for the hot tub and the service that you have given. 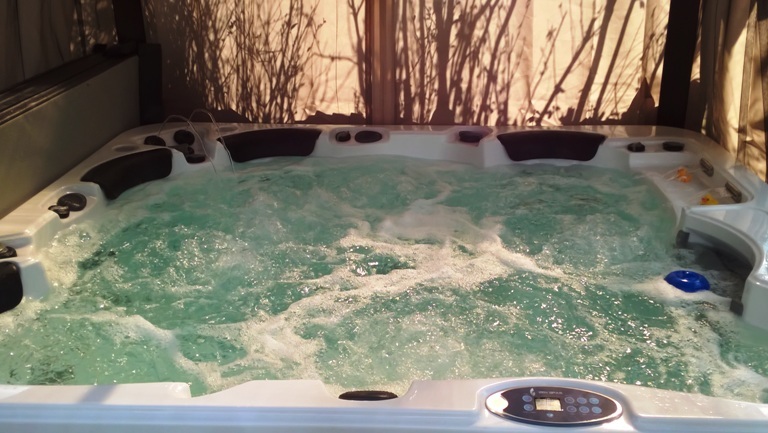 I was quite nervous about ordering a hot tub on the internet and although the website looked very professional and the videos were helpful it was a lot of money to spend without visiting a showroom. 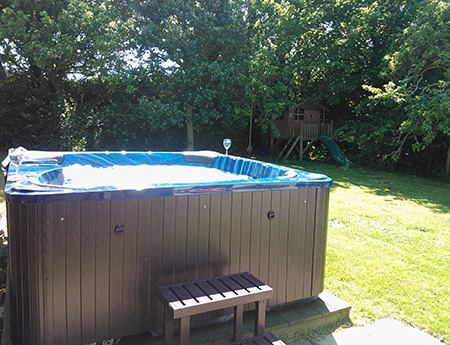 The hot tub was delivered within a few days by two very experienced couriers, they negotiated a difficult delivery within 20 minutes and were very polite about it! The next morning the installer arrived to wire up the tub and show us what to do, I was really pleased when he removed the sides and I could see that the side, base and shell insulation was all as promised along with a sturdy frame. We have been running it for a couple of weeks now and I am delighted with it. 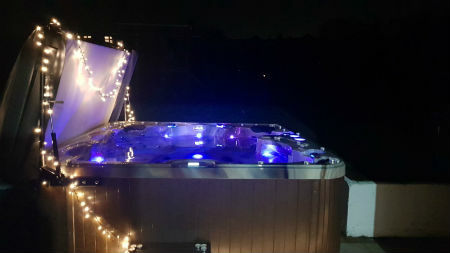 The tub is a lot quieter than I expected, the variety of jets make for a very customisable soak and my friends and family love it plus it looks great at night when all lit up. We just completed our first flush and clean out, the instructions provided meant that it was quick , easy and stress free. 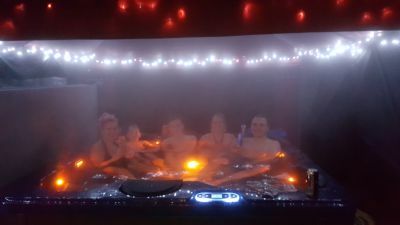 We have also been really impressed with the way the hot tub stays so warm, on the 30th of December we used it with friends from 4pm until 2am! The electric bill has stayed reasonable too. I was not expecting to use it so frequently throughout the winter. Hi Arun Many thanks James was brilliant and everything is now working. I am not able to praise the workmanship enough very professional seems trivial to describe the approach and workmanship. Effective, efficient etc etc I would also like to mention the following. Let's say you and your company are one of the best I have ever dealt with. I wrote a testimonial when we purchased the hot tub. This outlined your approach to ensuring we had what we wanted and your no pressure sales was excellent etc etc. and to be honest I did not think this could be better at any level. And I rated this as 5star plus However, the after care the level of service you have shown during the issue we had with the tub is beyond excellent. Your focus all of the time was to ensure the issue was resolved professionally and quickly. You will never know how much this means to people like me but you put me at ease kept me informed and did more than expected. I would just like to say how much Diane and I have enjoyed the Hot tub, since we bought it from your company. The quantity and finish of the product is of a very high standard. The support and back up service from you and your team , has been second to none. Always happy and full of good advice , at the end of the phone. We are glad we chose to come to you and have been well guided as some others, don't always deliver what they guarantee. 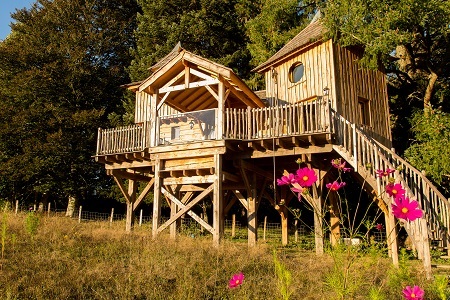 Luxury treehouse in the French Limousin with far reaching views out across the valley which can be admired from your very own sunken hot tub. 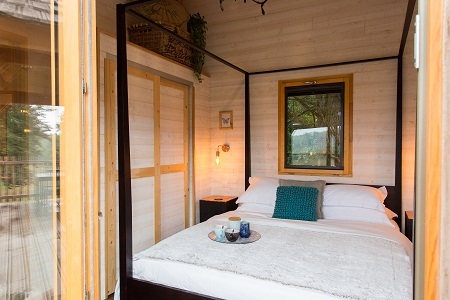 Set on a magnificent 20-hectare estate the treehouse has all the luxuries of a modern home, with the beauty and isolation that allow you to be immersed in nature. 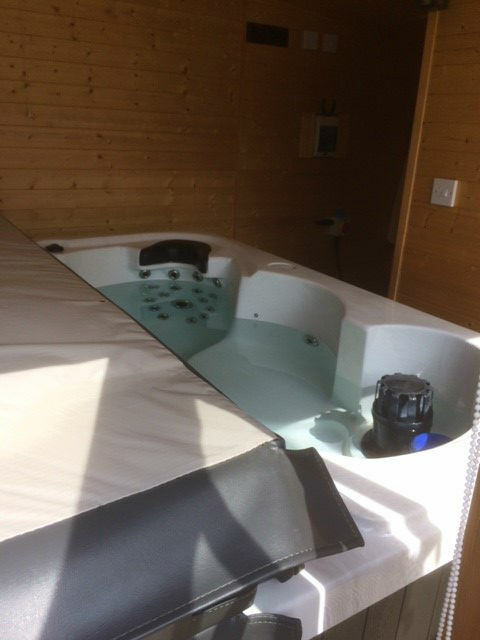 We delivered & installed the hot tub to France and communicate regularly with advice on maintenance plus sending spare filters when required! First class experience. First cover was slightly to small, sent next size up next day. Good quality excellent correspondence. Would highly recommend. 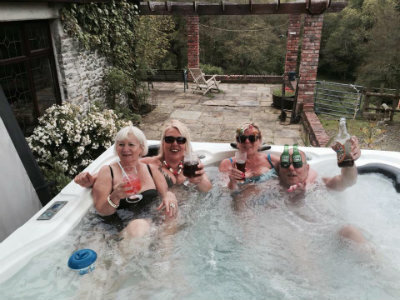 In these days of one-dimensional sales & service for almost every item we buy from homes to holidays, it was really refreshing to find hottubsuppliers.com with their friendly and “old fashioned” customer service where nothing was too much to ask. 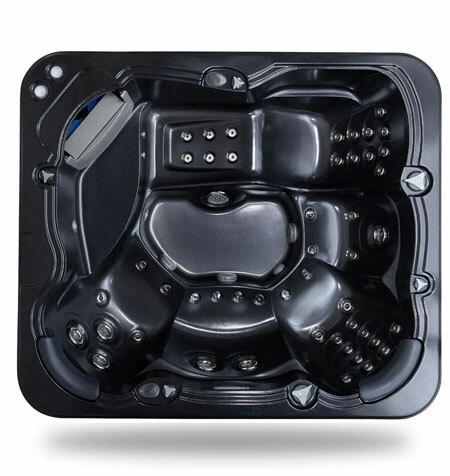 On top of the service, our Zspas Apollo model is fantastic and we highly recommend the company and the model to all of those in the market to buy a new Hot Tub. Patricia ordered an Apollo Deluxe in mosaic blue with an oak cabinet. Iv had my hot tub now 4 years although I’ve maintained the hot tub myself and never had a professional service it developed a problem. I contacted the company who came out and fixed it completed full service advised me on further maintainance and did a great job. Really happy I chose them open honest about options to repair it and service the tub and I would recommend to anyone thinking of buying. Looks good, works well and the unique customer service allows me to ask any question and receive any advice needed. Arun and his team were fantastic from start to finish - no pressure selling, happy to answer all my questions and kept me well informed all the way through. 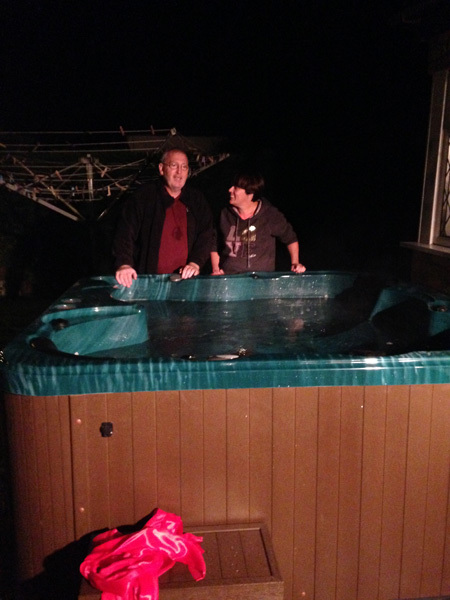 The hot tub delivery and installation were both great and we love the product. Would thoroughly recommend! Arun and the team are truly professional, attentive and informative. I really recommend their service and products! A hot tub through these guys is the future! Excellent service from start to finish the staff are very friendly and always give sound advice. They helped me with the install of the product by saving me a packet by not having to hire a Crane to install the hot tub in my garden. The product is of high quality and build. I had a few issues with the cover and a few other minor things however this was rectified immediately. Highly recommend this company they are honest and very genuine. 13 AMP Works a Treat ! 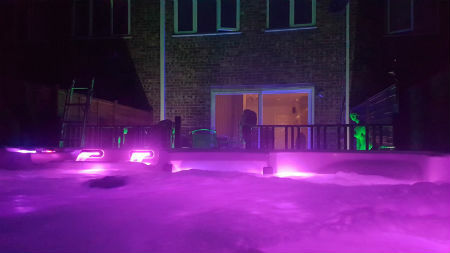 Always wondered about getting a hot tub, and I am absolutely delighted with the service HTS gave and really pleased with the Duke which even on the 13amp plug works a treat! As you can see,(picture 4 ) a very challenging but highly successful 6 month project that came to fruition last Friday so just in time for us to leave the country. The second of some friends and the 3rd picture is me and my amazing wife! After reading online about 'Hot Tub Suppliers' we decided to order the latest 'Restore' model. 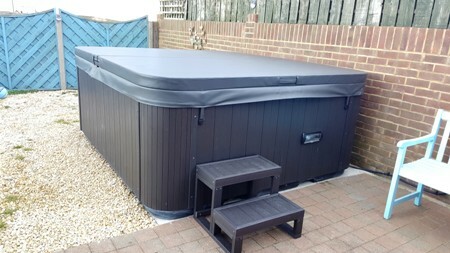 We would like to say how excellent this Hot Tub is, the build quality is superb, it has a real feeling of class, the fittings and fixtures are robust, so the whole package feels well made and ready to stand the test of time. 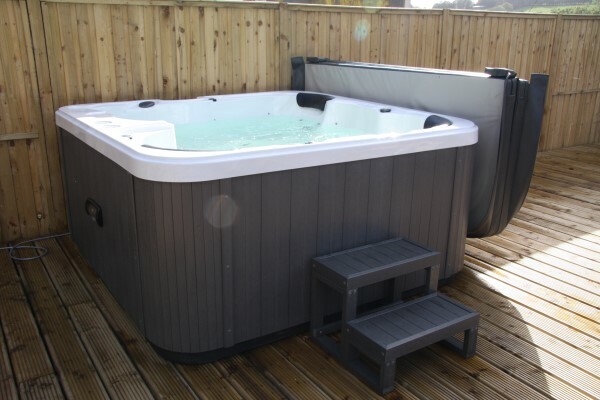 The whole order process was very easy, the 'Hot Tub Suppliers' team were very helpful and kept us well informed about the delivery schedule and were always at hand to answer any questions we had. The installation was exceptional with no problems at all. 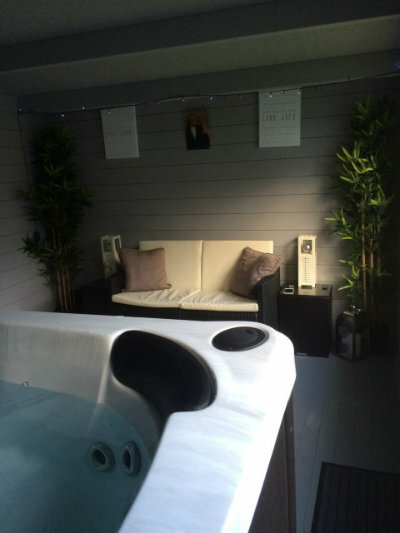 Overall our experience has been fantastic and would highly recommend 'Hot Tub Suppliers' if you are in the market for a great, high quality spa. We are really enjoying it! Thank you so much! Jorge ordered the Aspire Microsilk hot tub in pebble grey with midnight grey cabinet . Great company, a joy to shop with ! I have dealt with HTS for over 12 months & have been very happy with the service. They are always happy to help, offering advice when needed. 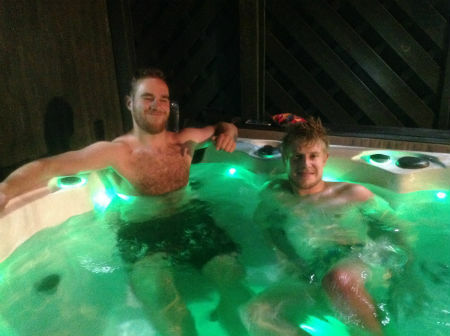 I was a hot tub novice so it’s great to have someone there who can help with any little problems or questions. I recommend this company - you won’t be disappointed. We had been thinking about getting a hot tub for a number of years. We even had the garden prepped with the foundation for one when we decked it. The time came to make our purchase. I had been looking at HTS for some time but what made us bring the purchase forward was the interest free option. This has allowed us to buy our tub a year earlier than anticipated. I had done a bit of research regarding the ‘microsilk’ option and this is what we decided upon. I wanted a tub with two loungers so we opted for the ‘Aspire Microsilk’ in Mother of Pearl shell and Midnight Grey cabinet. I also wanted a couple of extras, being an ultra violet sanitizer and a hot air blower. This meant that we had the full works to keep the water as clean as possible as this complimented the ozone generator. After speaking with Arun he confirmed this was not a problem. The tub arrived about three months later. 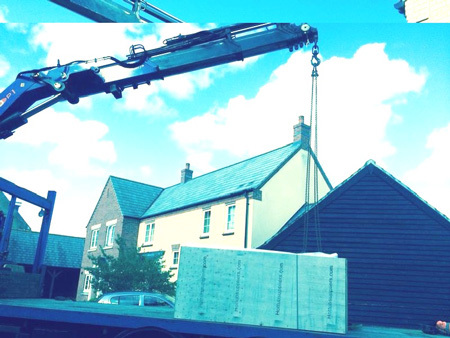 Due to the location of our house it had to be craned over three gardens to its final resting place. Again this was not a problem getting the lift organised. A few days later the engineer arrived to commission the tub and fit the extras I had ordered. A couple of days later it was up and running. Obviously it takes getting used to how everything works. Seven months later, I think I have got it worked out to how we like to use the tub. We have one of the filter cycles running every night on off peak electricity. This also keeps the water up to temperature. The tub has the Wi-Fi option so if we know we are going to use the tub that day we remotely turn the tub to ‘ready in rest’ mode a couple of hours before. Most of the time we run the microsilk option about ten minutes before entering. I suffer from dry skin on my fingers and I find using the microsilk does have benefits. Then we use the other functions as and when. 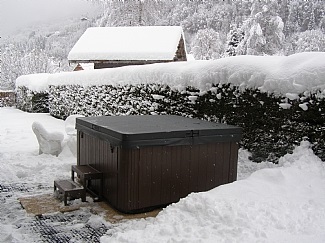 One of the reasons for getting a tub was after a skiing holiday some years ago. The chalet we stayed in had a hot tub outside. It was surreal sitting in a lovely warm pool during snowfall and an air temperature of freezing point!. We thought we would have a long wait to do the same with ours. 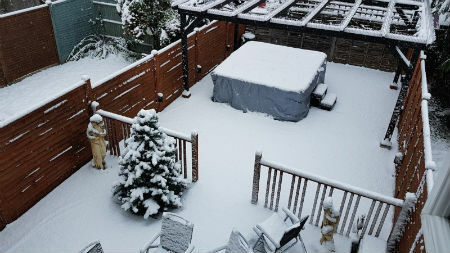 However in December we had a good deal of snowfall. It was the ideal opportunity to try our tub. It did not disappoint us. 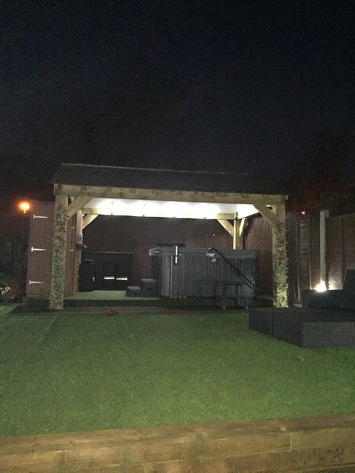 After the tub was fitted we have since installed artificial grass and a pergola complete with a lighting system which we like, and so do our neighbours! We are now looking forward to the summer months. Since I first bought a hot tub from HTS 2 years ago I've been more than happy. Whenever I've had a question or needed advice the response has been quickly forthcoming and when I accidentally damaged the tub they were able to send new parts out the same day. We needed our hot tub by a specific date, Hot Tub Suppliers went out of their way to ensure it was delivered on time and to give us all the information . 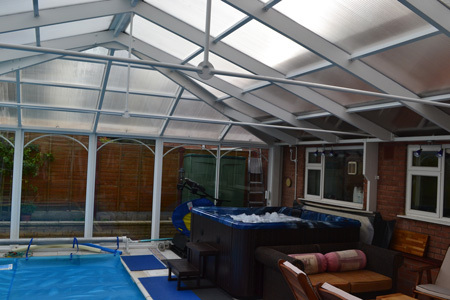 they were always happy to help with any concerns or questions and put us in touch with fitters. 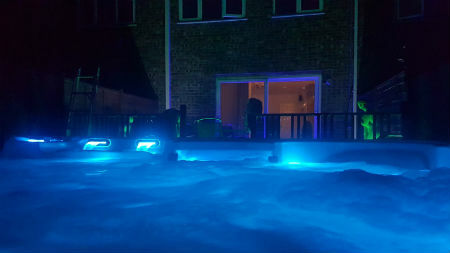 Anyone buying a hot tub should be aware that you need to put in the correct electricity supply to your tub and not expect the regular house system to do the job. We had our electricity supplied before delivery and have a separate fuse box and outdoor on/off switch. All this was explained to us at the time so we were able to set up quickly. 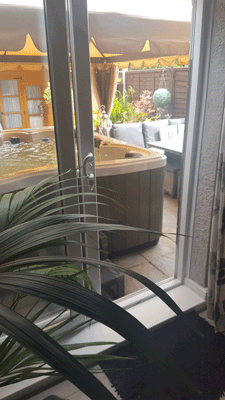 We then put a small conservatory around the hot tub and have been able to use it most days throughout the year. 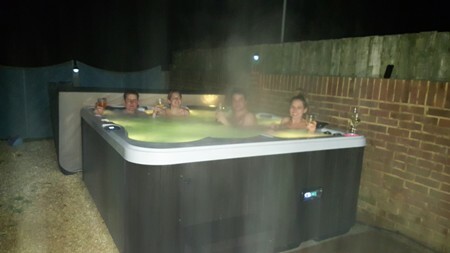 On reflection the service, information and friendly staff made the experience of purchasing our first hot tub hassle free. I spent some time checking what exactly we wanted, prices and services before purchase and feel we made the best choice . Just to let you know that the two engineers you sent out and fixed the panels were brilliant. 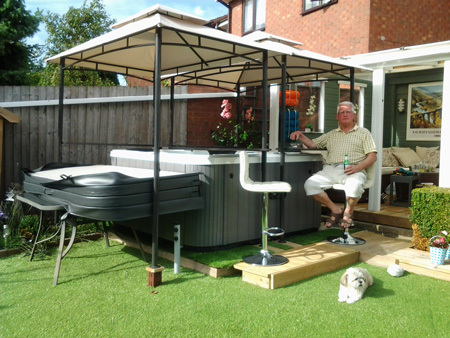 Bill ordered the Countesa hot tub in pebble grey with steel grey cabinet. Just like to say that the hot tub is doing everything it should. 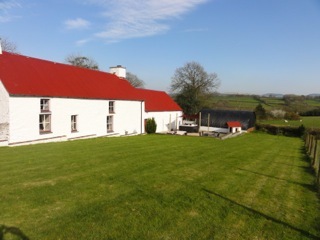 Really happy with the purchase and recommended you to a holiday let who are looking for HT. Thanks again for your advice and help throughout. I searched the internet for months before purchasing our hot tub from Hottubsuppliers. It was a relatively big purchase and I really wanted to get it right. The company was highly competitive on price and very helpful regarding any queries. We are chuffed with our purchase as are our children! 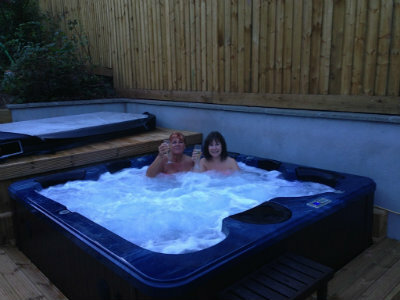 just to let you know, the hot tub was worth waiting for, up at 6 am this morning which is very rare on a day off! We were very pleased with the service we received and the communication we had with your team. Used in all weathers & with 100% backup & support even over little things. Les in Essex ordered the Princess in Midnight Grey with Midnight Grey cabinet. 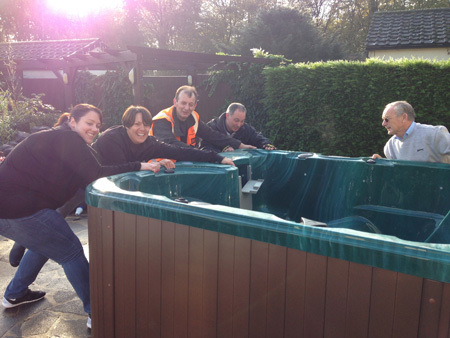 Thank you so much Hot Tub Suppliers with all your help this week. Ian the engineer was so lovely and has fixed the tub for us but we couldn't have got to this point without your excellent customer service so thank you. Anna in Cheshire ordered the Zeus Deluxe in Atlantis Green with Oak Brown cabinet. 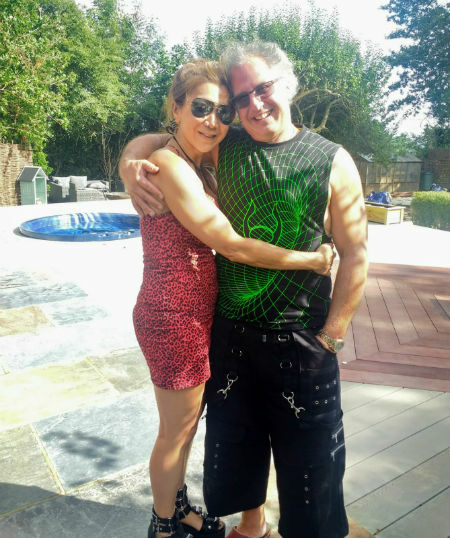 My wife Carole and I have very much enjoyed using the hot tub throughout the Summer. It has proven to be as good as we had hoped and our Grandson Harry who is 10 years old has been a keen user, particularly during the school holidays. Everything is working perfectly so far and the additional chemicals and accessories we ordered arrived in good time. 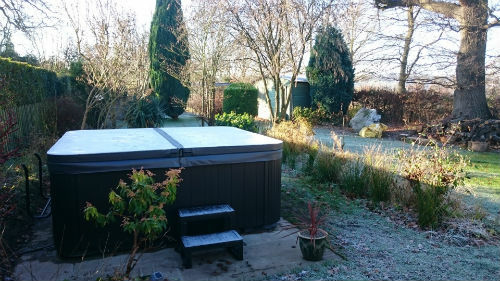 The hot tub is currently on tic-over in low range for the winter and the insulation has worked well particularly during the frost and snow of the last few weeks. 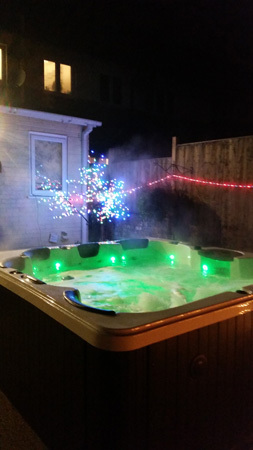 Wishing you all at Hot Tub Suppliers a Merry Christmas and a happy new year. Regards David and Carole. The overall quality of the tub is good and am pleased with the way it works and especially great having the facility to control it via WiFi. You definitely get a lot of tub for your money when you compare it to other brands and it's nice to know it's packed with good quality serviceable components, so good value for money. 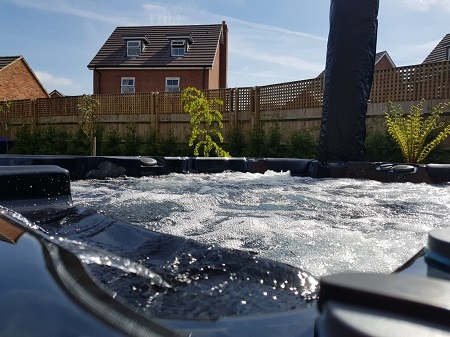 I couldn't be any happier with the service I've received from Hot Tub Suppliers as they've always responded to any communication quickly (even on a weekends) and have always dealt with any issues or queries. This being carried through from conception to delivery and including aftercare. 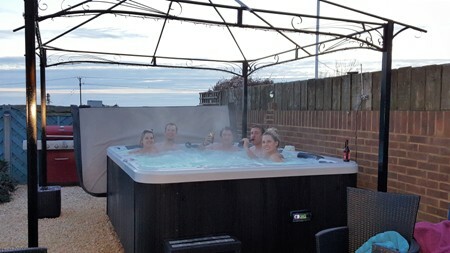 I would like to personally thank Hot Tub Suppliers Leicester for going above and beyond when I bought a massive 6 seater hot tub just 4 days before my husband’s birthday. 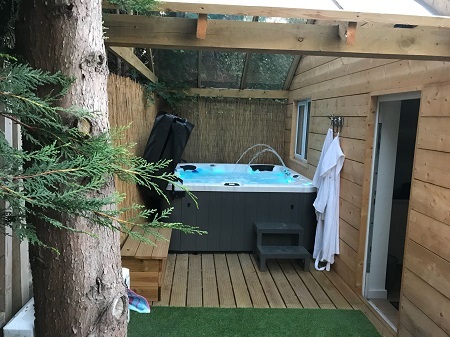 I had organised the hot tub as a surprise for him, but Arun was brilliant and helped me to set up all the other aspects of the installation as well working out of hours just to get it all in place for me. 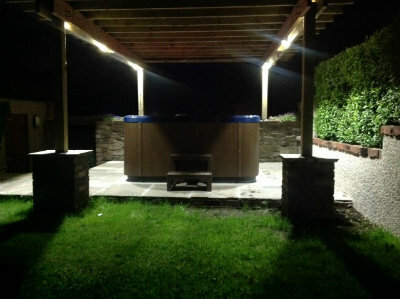 It all came together brilliantly and I would recommend Hot Tub Suppliers no end to anyone looking to get a hot tub! 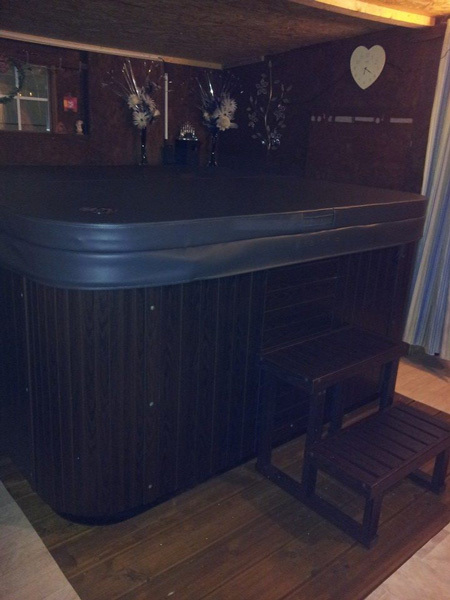 Amy in Leicester ordered the Duchess Spa Touch Hot Tub in Champagne with Oak Brown cabinet. Excellent service and great hot tub. You can buy a bit cheaper but you get what you pay for and this is top drawer! Covered In Snow & Still 40 Degrees Inside - Impressive Insulation! 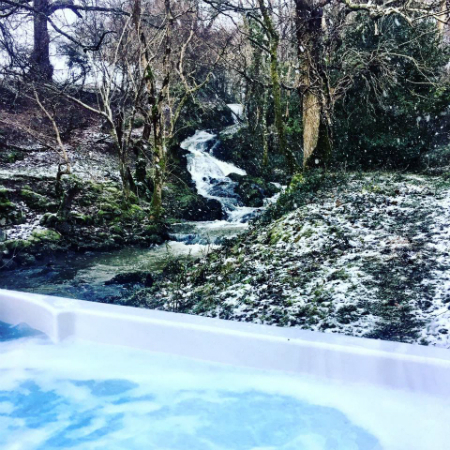 Our hot tub in deepest Wales- we had about 15 inches of snow this week - I'm happy to tell you that the tub was covered in snow and 40 degrees inside - impressive insulation! 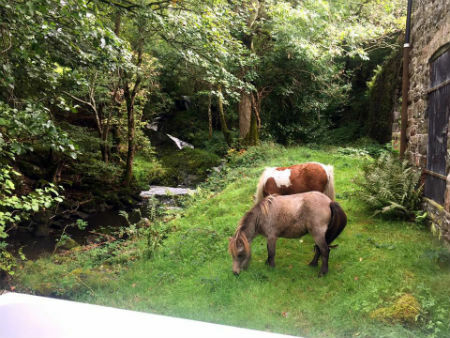 We run a holiday let called Argoed Mill- this is me having a very swift photo opportunity between guests - since installing the hot tub we've been pretty much fully booked. 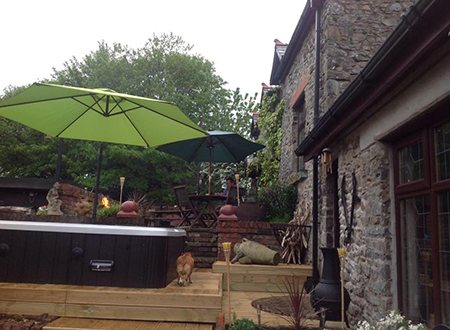 A romantic holiday cottage for two in mid Wales with a Hot-Tub and its own Pool table! 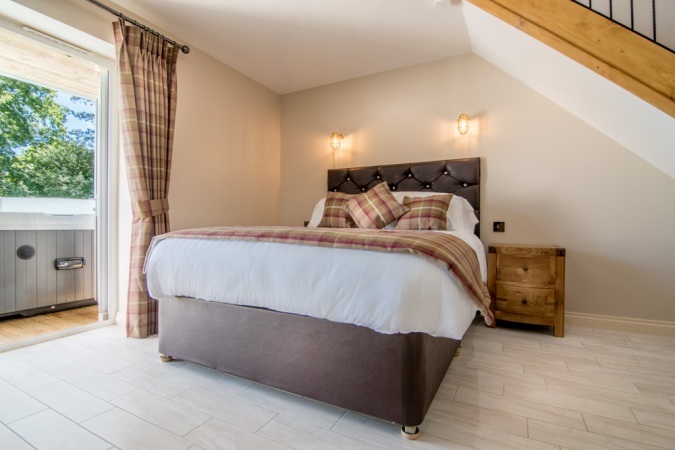 Housed in a converted historic water-mill this traditional Welsh holiday cottage has a charming interior and makes a great base for a holiday. Deb at Argoed Mill ordered the Hera Deluxe in Pebble Grey with Steel Grey cabinet. Great value for money, straight forward and friendly company. I wouldn't have made a high value purchase like this through an unknown internet company and I had been looking around at local showrooms for my hottub. But we had a recommendation from a friend, and she was correct, this is a good value and trustworthy company. They also recognised the person who made the recommendation when I first called them, which was nice. Follow up service and query resolution also good. We have had experience in hot tubs so we had an idea of what we were initially looking for when we decided to surf the net to find a hot tub because we were interested, but even we were shocked at how reasonable the prices of hot tubs at hottubsuppliers.com were, enough to cause suspicion on our side meaning we had to do a little background research, and we were very pleasantly surprised when we saw it for ourselves. 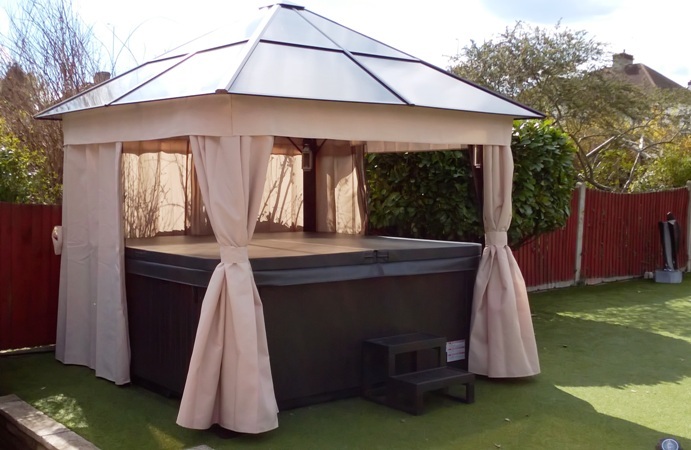 When I saw that they had a few of their hot tubs on display in a garden centre in Leicester and the quality was amazing, we finally decided to purchase the Emperor Deluxe, and it was delivered and craned in after 2 weeks. We then, after filling it in, were relaxing in it. But perhaps the most shocking news was the hot tub we thought we would have to purchase at £13,000 actually being an extremely low £6,500. To top it off, the team at HTS were amazing and sorted everything out, and not once was he pushy but gave us the benefit of their abundant knowledge, also reassuring us totally that we made the right decision. We have not looked back at the decision which we can now say is just amazing. Nick & Ian ordered the Emperor Deluxe in Pebble Grey with a Midnight Grey Cabinet. 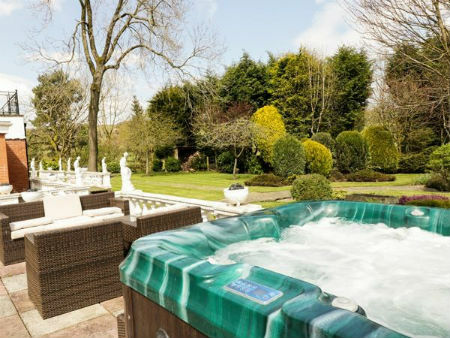 You have found your new hot tub! 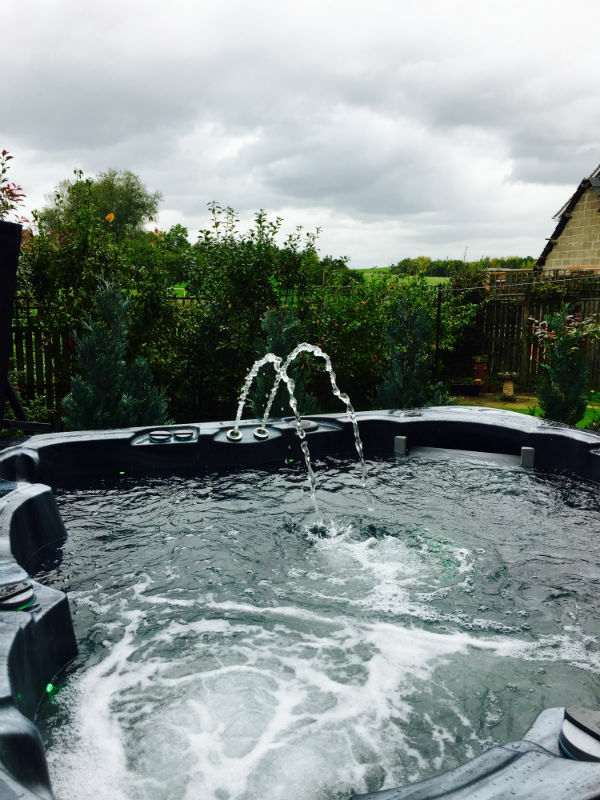 We looked around and did a lot of research before deciding to go with Hot Tub Suppliers and we are so very glad we bought from them. The whole experience from the first phone call has been fantastic. The service is amazing - nothing is too much trouble (even 'silly' questions were met with a lovely response with lots of information that was reassuring) and I have no trouble in recommending them to anyone. We have already done so to all our friends and family and have 2 friends who are looking to buy from them. 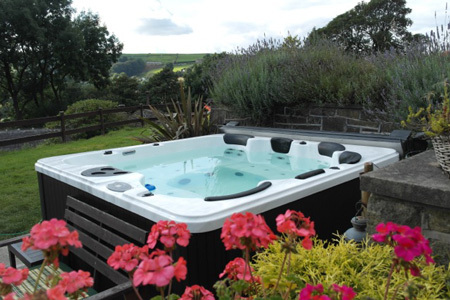 Don't waste another minute looking around - buy from Hot Tub Suppliers - you won't regret it! 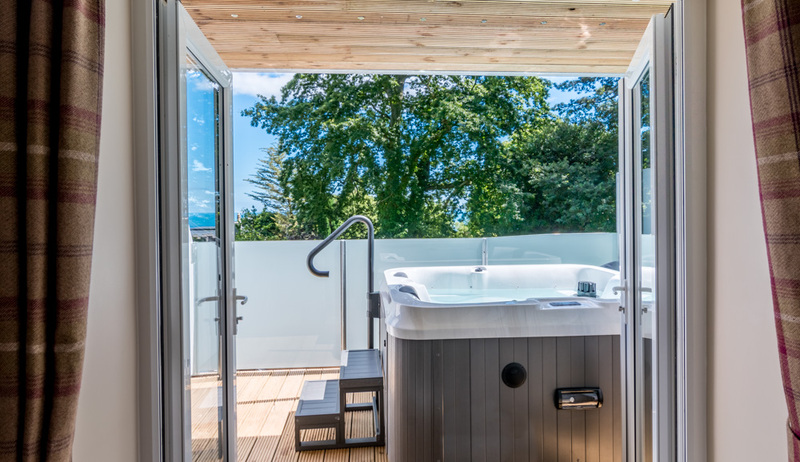 The Otters Leap Hot Tub Cottage development was designed by Tony & Karen Davies in 2017. 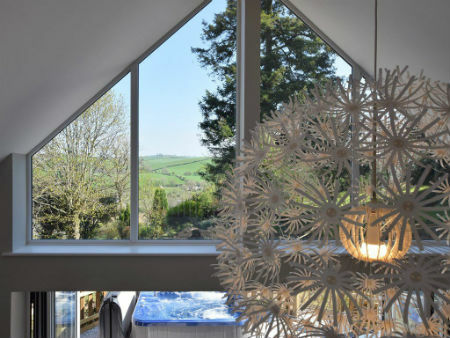 Their design ethic was for a modern style holiday home, but in keeping with the tradition of Bideford, an historic coastal town embedded in the heart of the North Devon. 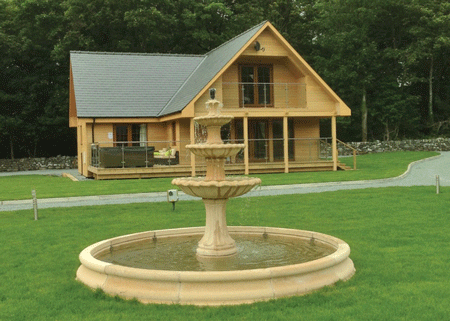 Traditional white brickwork with Grey Welsh slate roofing provided the template for Otters Leap. The interior furniture & fittings included wood burning stoves and full width bi-fold doors to enable the ‘outside to be brought inside’ and at the same time offer extensive views across the river valley to the green hills beyond. 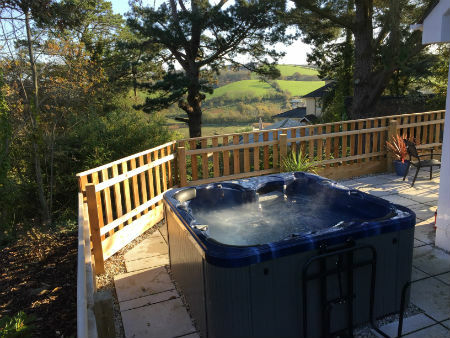 Key to the vacation experience, with privacy being of paramount importance, was the provision of a quality private hot tub on the patio directly outside offering stunning panoramic views across the river valley and to the rolling hills of the North Devon countryside. 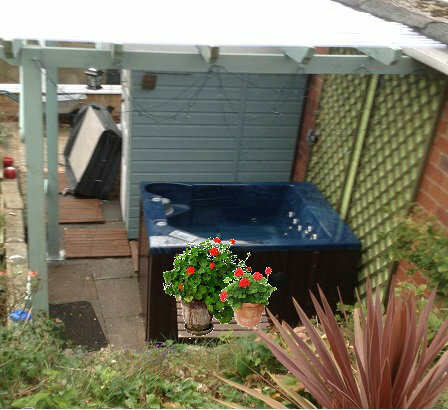 The hot tub was commissioned, photographed and sent over to the letting agents for advertising the property for summer 2017. From launch until now, Otters Leap has generated an incredible utilisation rate of 93% which for a first season of work is incredible. 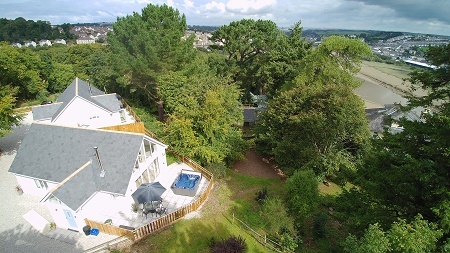 The agency who deal with many properties in the North Devon area have attributed this success down to the introduction of the hot tub. 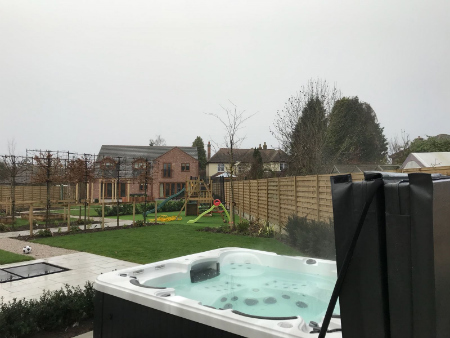 From the outset, guests have been given a personal introduction to the use and safety aspects of the hot tub with guidance notes provided to ensure a safe and enjoyable experience for all. Conveniently located in the grounds of Tony and Karen's home, makes regular water testing easy as Tony can test and record water balance levels 3 to 4 times each day without disturbing the guests. The hot tub is also flushed & emptied after each guest and refilled with clean water. Water is regularly tested and monthly samples are analysed by Oakwater Laboratories in Devon to test for bacteria and quarterly for Legionella. Tony & karen ordered the Countesa in Mosaic Blue with a Steel Grey Cabinet. 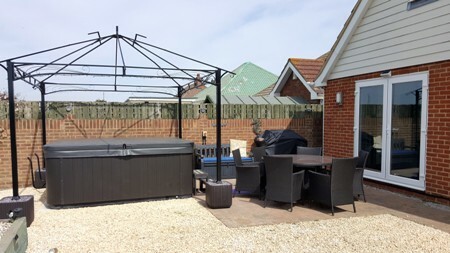 The service from HTS has been excellent from start to finish and we would certainly recommend using them to other people wanting to purchase a hot tub. 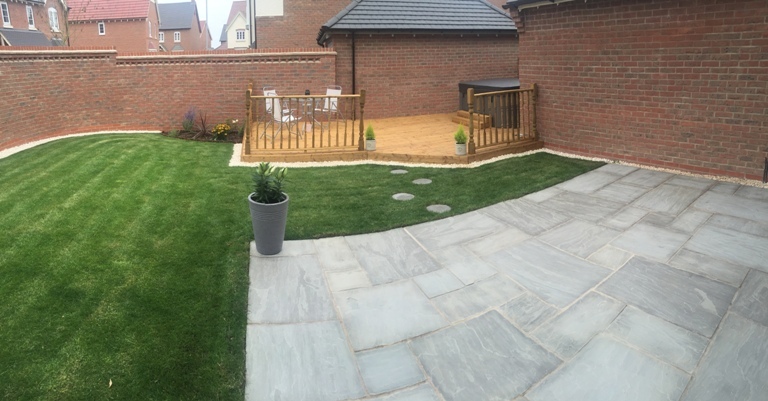 Arun and his team have worked very hard to answer all our queries and make the whole process including the installation a good experience. After sales service is also brilliant. 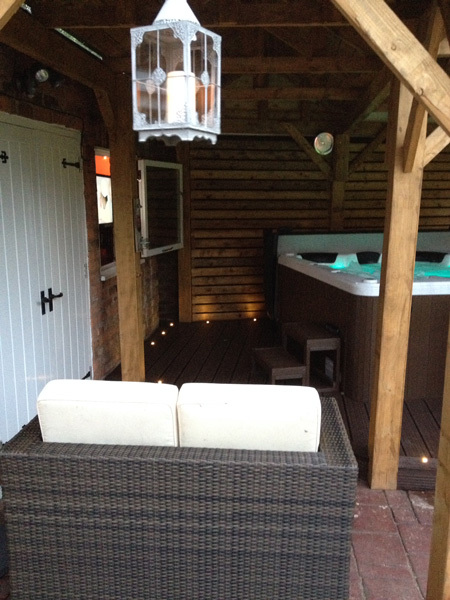 We are really pleased with the hot tub on our new patio, the quality is spot on and value for money excellent! Well done HTS!! Ian ordered the Emperor Deluxe in Midnight Grey with a Midnight Grey Cabinet. 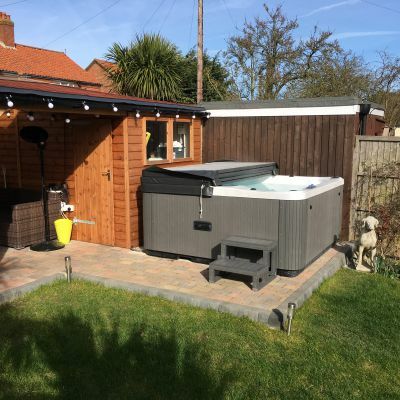 Totally satisfied with the service provided...good communication and delivery was spot on...would recommend to anyone thinking of buying a hot tub. It’s been an absolute joy to deal with Hottubsuppliers.com. From initial viewing through to aftersales we have been delighted with the honesty, integrity and helpfulness of the company. Throughout the purchasing process and we wouldn’t hesitate to recommend them to a discerning customer looking to buy a top quality product at an amazing price. Thank you so much. Wishing you all the very best. Dan & Craig ordered the Allure Microsilk in Pebble Grey with a Midnight Grey Cabinet. 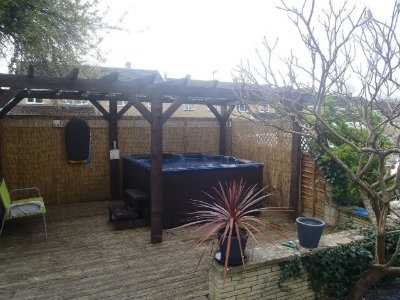 I'm really glad to have been supplied with my hot tub from "Hot Tub Suppliers". They kept me informed as well as could be expected, right from the beginning and guided me through to delivery really well. Other companies I investigated prior to making my choice I'm sorry to say, only left me feeling uncomfortable and so steered clear. The tub I purchased from them was of my own choice as in, "Hot Tub Suppliers" helped me but didn't try pushing me one way or another. 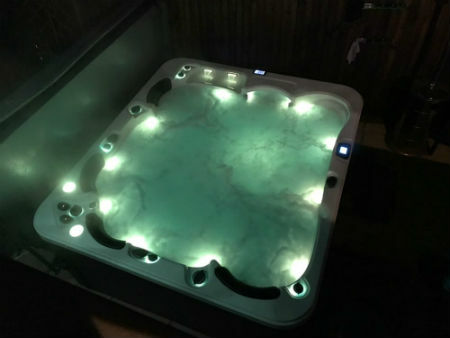 Since purchase I have had an issue with the failure of the control panel but "Hot Tub Suppliers" had a replacement sent out and with no quibble. 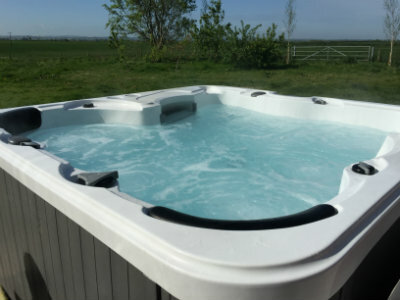 One interesting point is I have discovered is that, if you do have a query or problem with your tub, you are ale to contact "Hot Tub Suppliers" out of normal office hours and they do respond very quickly and get you the help you need. Obviously this is my own experience which overall to date, I have found to be a pleasant one and so, long may it continue. 1. Firstly a hole of 8 inches was dug out, and concrete was added to form the base. 2. 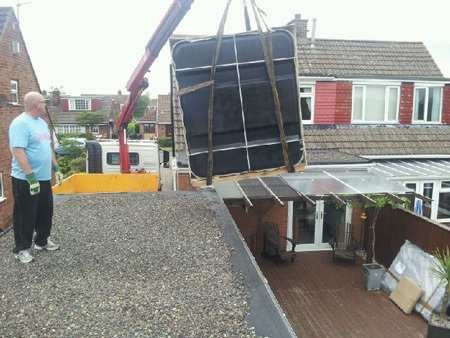 A crane was used to lift the hot tub because of the limited access. 3. A wooden platform was then built around the tub and decked over. 4. 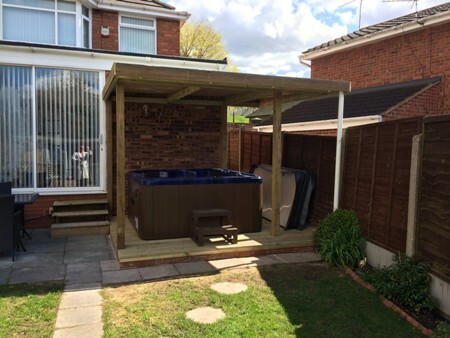 Hinged decking boards were added to this gap which can be lifted to acces the space around the tub. 5. 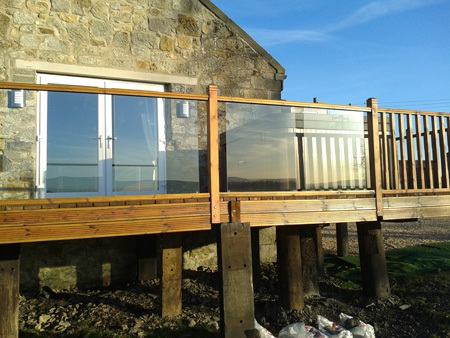 A glass fence was then installed around the edge of the platform, finished by a set of steps into the garden. Laura ordered the Perseus BP Deluxe in Midnight Grey with a Midnight Grey Cabinet. I've waited 5 months to review the product and the company so it's a fair and honest review. Having made the decision to get a hot tub, the next question was "where do I get one at a good price with excellent customer services". After looking through dozens of suppliers, HTS kept coming up as a top option so I explored the duchess model with Arun. The emails started late one evening and Arun was answering quite a lot of my queries after 9pm. I must have cheesed him off with the number of questions but as a result of his patient answers I decided this company was right. I gave him A deposit the next day and the duchess was ordered. Throughout the next few months, arun kept me updated and even put me in touch with a crane hire company they use which was reasonably priced. The tub came at the end of November and it was as described. Brook from HTS has been brilliant due to a minor problem with the cover but she sorted it in no time. I fully recommend this company for your hot tub needs. The Children Love It ! The picture was last month for my birthday! It's had lots of use apart from that night. We had a very good experience with Hot Tub Suppliers and still do, whenever I get stuck with something ie cleaning, bubbles etc they always help me out. I am so happy with our tub that I have recommended my cousin, she is going to go the shop to see them, I bought it online which was also a success. It's a real pleasure to write this review. 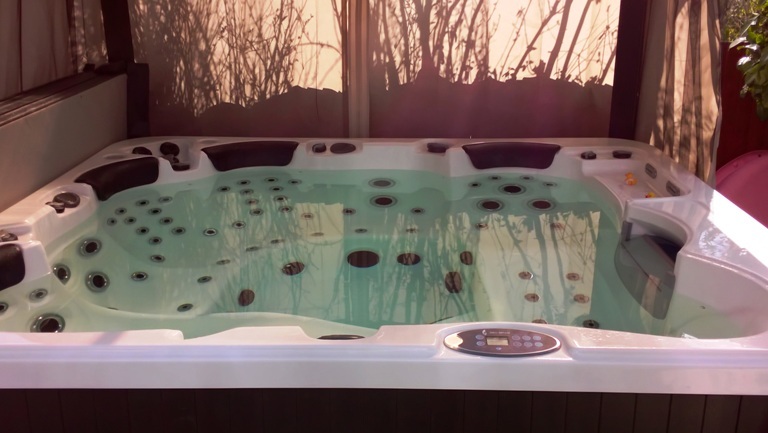 The customer service from HotTubSuppliers has been absolutely exceptional from the first phone call for some advice through the buying, install and after care Arun's advice, guidance and help has been been absolutely brilliant. Quite frankly and with no hyperbole it's the best customer service we have received across any product or service over the last few years. We bought an Apollo Deluxe in pebble grey and steel and we are absolutely delighted with it. Delivery took a few weeks as we were at the point of the model year when waiting enabled us to get an upgraded system. 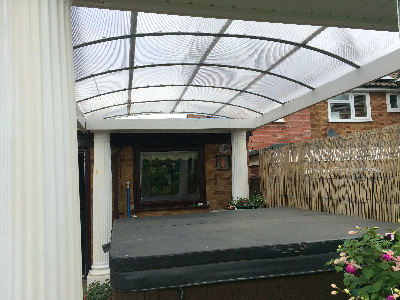 The price was extremely competitive, in fact far cheaper than many we looked at and the quality and performance has been absolutely top rate. We had a couple of minor snags and they both were dealt with quickly by Arun and his team. 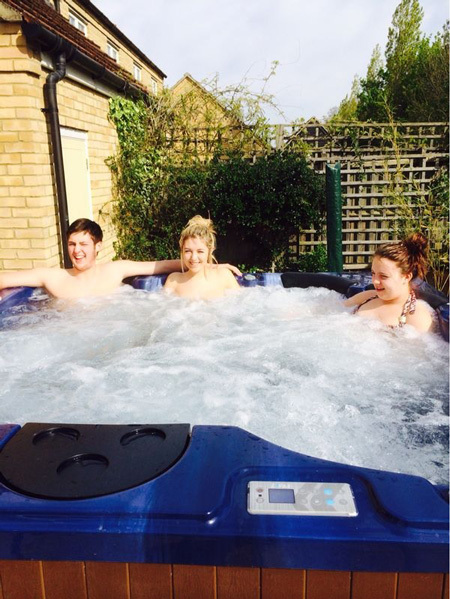 Great service should be rewarded and we can unhesitatingly recommend HotTubSuppliers. (we could write far more) Regards Mike & Cindy. Hot tub is working perfectly and everyone loves it. Great job mate ! Thanks for all your help. I’ve only missed one day since it was up & running in July! 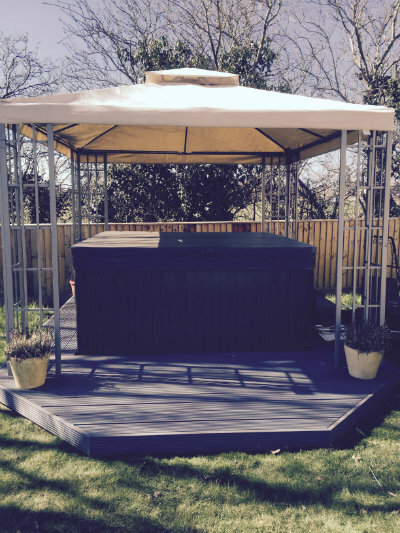 The hot tub is absolutely awesome and we are so delighted with it and the customer care we received was excellent. Many thanks for an excellent service and I would highly recommend you to anyone. Made me feel really relaxed and the service was good with it. I bought this hot tub just over one year ago and it has been the best purchases i have made in a long time. 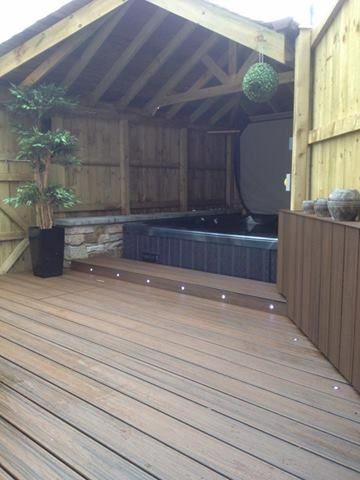 the support and advice has been fantastic from the hot tub suppliers, many thanks to a great and professional team. 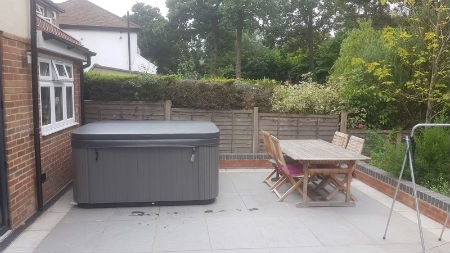 Richard & Rachel ordered the Pontus Deluxe hot tub in pebble grey with midnight grey cabinet using the design your own section of the website. We love the hot tub, wouldn't be without it now. 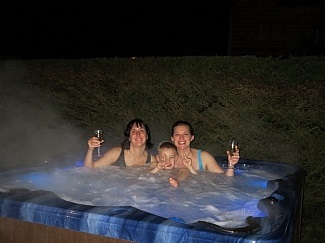 We have had our hot tub now for over a year and we love it! 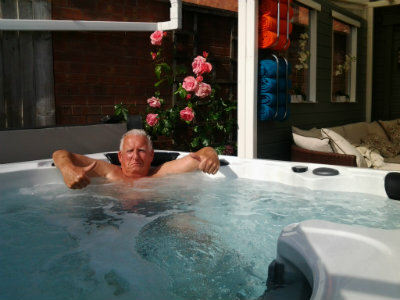 The service we have received from Arun at hottubsuppliers has been exceptional, no matter what the query is, he has always on hand to help and offer advise. 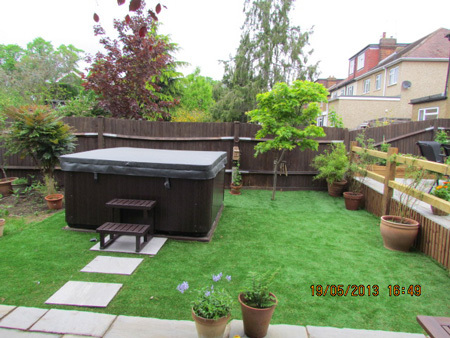 I thought I'd send you a couple of pictures of the hot tub and how the garden is coming on - slowly! Still lots to do but we are having a great time using the hot tub & entertaining friends and family outside now. I've given some friends your details so they may be in touch! Justine ordered the Emperor Deluxe in pebble grey with midnight grey cabinet. 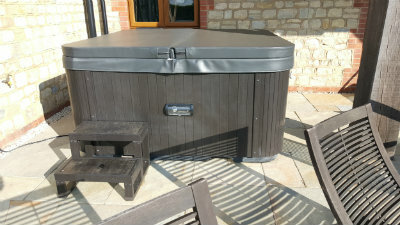 Ordering was easy.was kept informed and given an approx delivery date.which was regularly updated.delivery was great even though the final resting place for the hottub was a little difficult.but no complaints from the two delivery guys.all in all a very satisfying purchase.if you can afford one then get one you will love it! 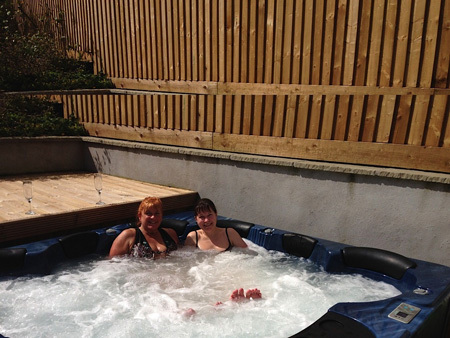 Thank you both for your help with the purchase of the Duchess Hot Tub, we are delighted with it. 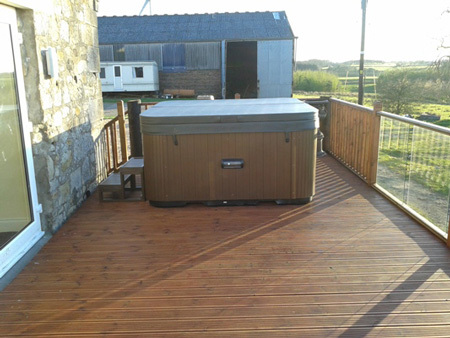 Following our visit, when we spoke to you personally, we had the confidence that Hot Tub Suppliers could deliver what we wanted. You both have been very professional, friendly and kept us informed. 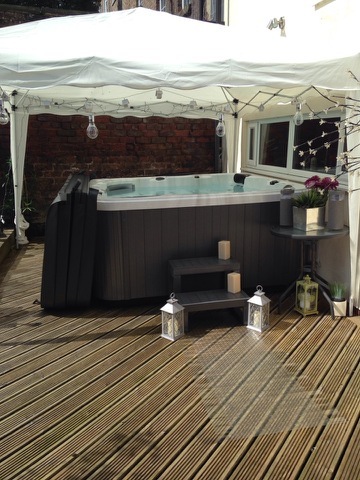 The delivery was made on Thursday and the installation consultation was completed on Friday, ready for a lovely weekend in our new hot tub. Thank you so much for all your help, we felt we got a really personal customer service and nothing was too much trouble. 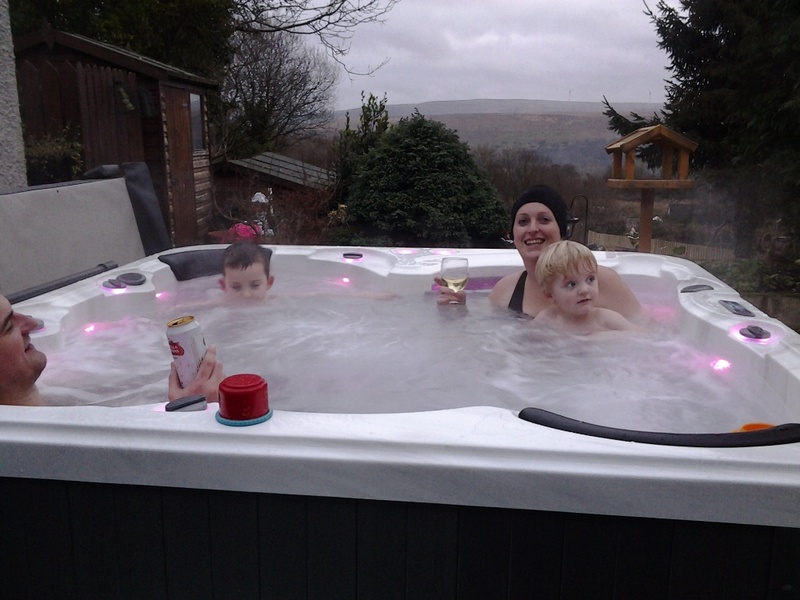 Hot tub is fantastic, the kids are enjoying it as much as we are! It's a real pleasure to write this review. 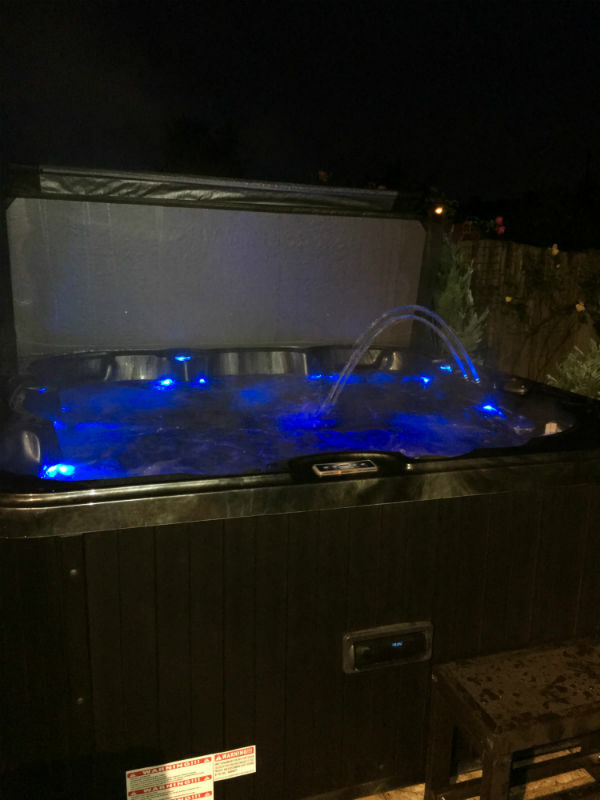 The customer service from HotTubSuppliers has been absolutely exceptional from the first phone call for some advice through the buying, install and after care Arun's advice, guidance and help has been been absolutely brilliant. Quite frankly and with no hyperbole it's the best customer service we have received across any product or service over the last few years. Following Arun's advice and our own research we bought an Apollo Deluxe in pebble grey and steel and we are absolutely delighted with it. Delivery took a few weeks as we were at the point of the model year when waiting enabled us to get an upgraded system. 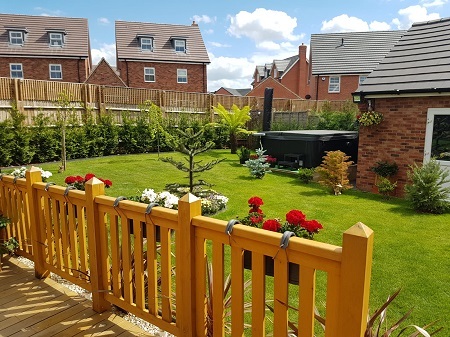 The price was extremely competitive in fact far cheaper than many we looked at and the quality and performance has been absolutely top rate.We had a couple of minor snags and they both were dealt with quickly by Arun and his team. For anyone who has had and enjoyed a Lay Z Spa and is wondering if stepping up to a fully featured tub justifies the considerable extra outlay then the answer is an unqualified yes. 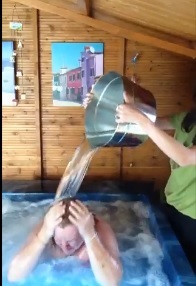 We loved our Lay Z Spa and got a lot of use out of the two (and three pumps) we had over three year period. 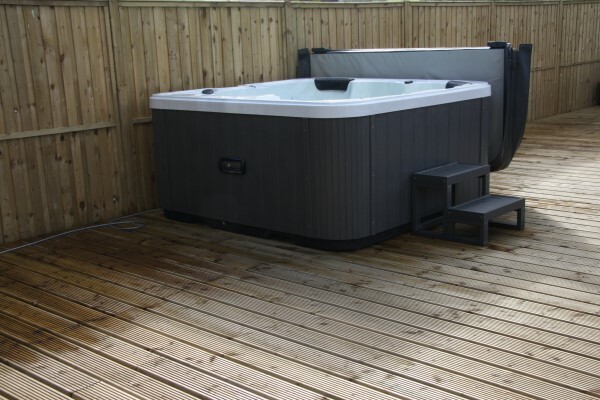 They are a great fun product but as you would expect at their price point considerably compromised in some aspects of their design, performance and longevity; our considerable use convinced us though that we would get value from going to a full hot tub. The Apollo is extremely efficient and empirically we would judge our electricity use actually going down despite the Apollo Deluxe being considerably more powerful. Our Apollo Deluxe is fitted with the optional Wifi module and we highly recommend it. We have read about some people having trouble with it but it has been trouble free for us (we have a wifi extender close to the tub) the app isn't great and the initial setup is fiddly but it definitely adds flexibility to running the tub. So in summary, great company, great product, great service and nice people. 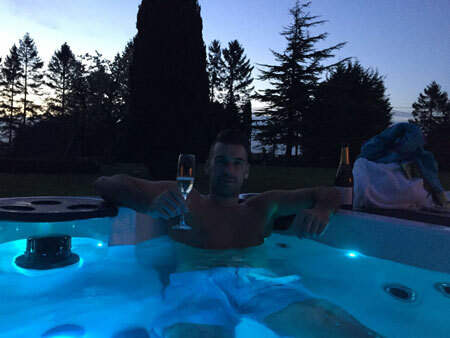 Great service should be rewarded and we can unhesitatingly recommend HotTubSuppliers. Mike & Cindy ordered the Apollo BP Deluxe with upgrade WIFI adapter . 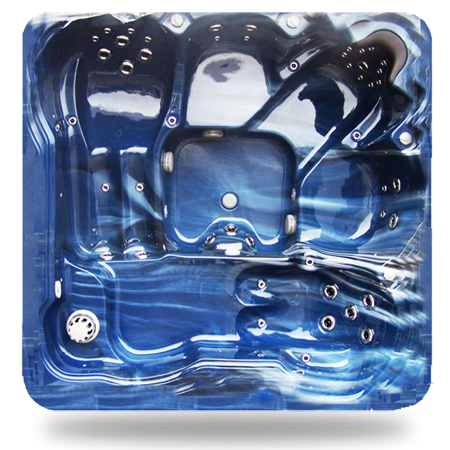 Can you find another Microsilk hot tub price online apart from hottubsuppliers? 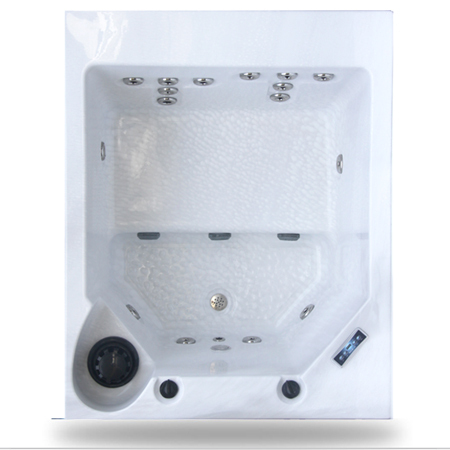 This is a Microsilk upgrade on the BISHTA award winning Emperor Hot Tub. After ringing many retailers, comparable products were 30% more! I ordered through their "design your own" options, to get the bespoke spec. and colours I wanted. I was not disappointed. A couple of minor issues did come up. The Balboa wifi control did not appear to work and at the time of delivery the spa cover lifter I wanted was not available for a tub this big. Time to test customer service. Arun and his team have been fantastic! Very helpful and genuinely interested, a lesson that could be learnt by many car showrooms, where the sales person doesn't even want to even talk to after you have paid their company many £££'s! Hot Tub Suppliers have been a veritable oasis in the desert of my recent retail experiences. Quick, efficient delivery and easy installation. 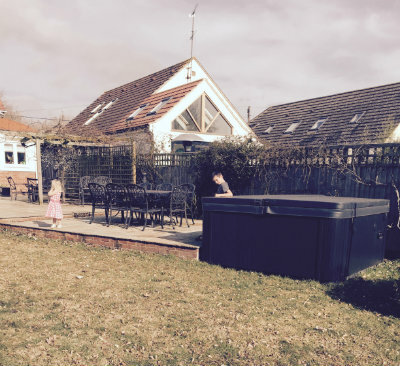 The hot tub is the best thing we have purchased in years, and I've told so many people who could not believe the price we paid and the service we received being second to none. 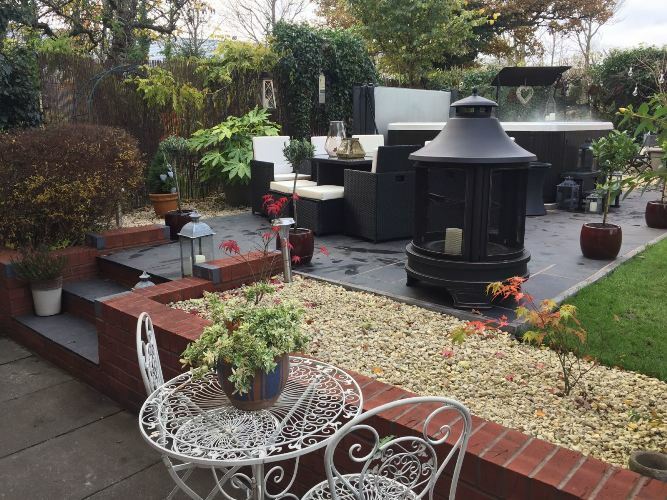 There is a garden centre near us with a hot tub company supplying there, and it was the same size as the one we bought from your company, apart from it being £29,995.00 on their site (also only 2kw heater). The sales man tried to sell me one but I stated no thank you, as I found one we liked. Believe me, he tried but I had all the information I needed from your website to question him, and he was clearly not happy. Great support and after sales advice. A good reliable firm that really delivers a top end product. “The hot tub has been first class! Arun is always on hand to give advice on chemical balance and cleaning. 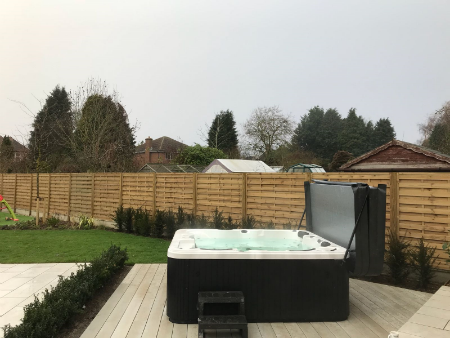 Very pleased and would highly recommend"
It is a real maze out there when it comes to sourcing and choosing the perfect Hot Tub - both on design and price. 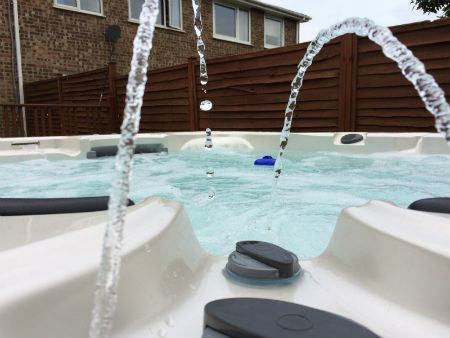 What drew me to Hot Tub Suppliers was the amount of genuine positive reviews online and their competitive prices, compared to other suppliers. The communication was fantastic and every little question was answered promptly and expertly from the start to the finish. The delivery was prompt, timely and friendly. 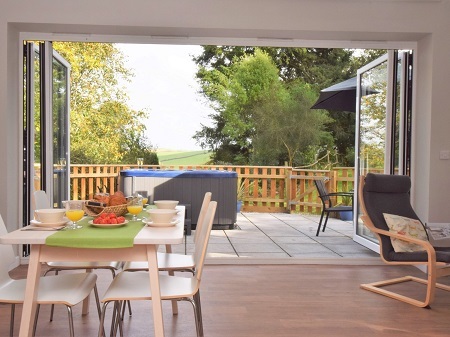 The Emperor has been a great addition to the family and has been a hit with the kids, parents and grandparents alike - it gives a real feel of owning your very own holiday home. 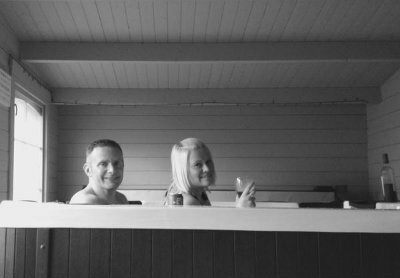 Once you are sitting in the tub you can be a million miles away from anywhere... A big thank you to Hot Tub Suppliers from The Quirkes! Excellent service; friendly and helpful. After many years of my children and I attempting to convince my wife we needed a Hot Tub, she finally gave in. 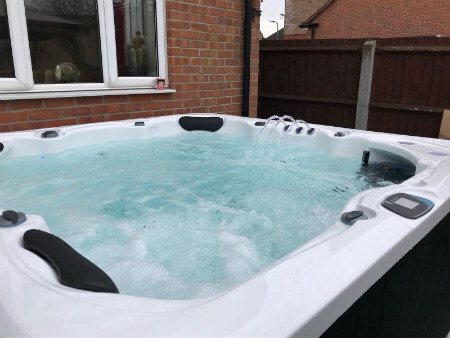 We then spent what seemed like weeks researching Hot Tub vendors, where we got to the point of nearly purchasing one from a vendor showing at the Ideal Home Exhibition recently. However something stopped me, after all these years and a new found eagerness from my wife we chose not to purchase and the reason why! 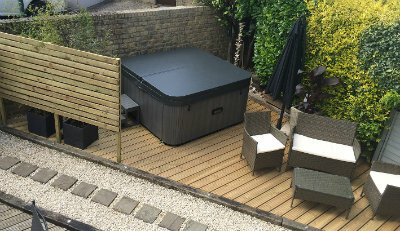 All this, with the added value of excellent customer service from Arun, was the main reason we finally brought our long awaited Hot Tub. It seemed like Arun was always there for me whenever I asked a question, nothing was too much. Everything was done by email or online which suited me. We were able to select the most suitable Tub, accessories, preparation and arrange delivery without any fuss or concern. The delivery was stress free, completed by Kenny and his helper. 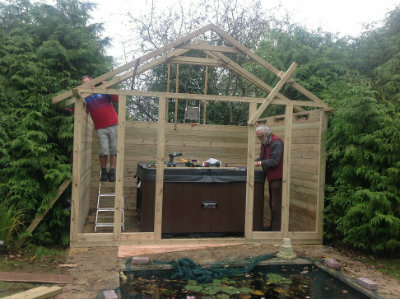 We removed one fence panel and the two guys unloaded the Tub through the gap, lowered it down a small drop to the garden and into position in minutes. Setup and commissioning all went as planned and we were up and running within 24hrs from delivery. Like all new toys, the tub is in constant use with someone in it at least 4 days per week, bringing us all so much pleasure. What’s great is all of the free information and guidance Hot Tub Suppliers provide via their internet site and you tube clips. 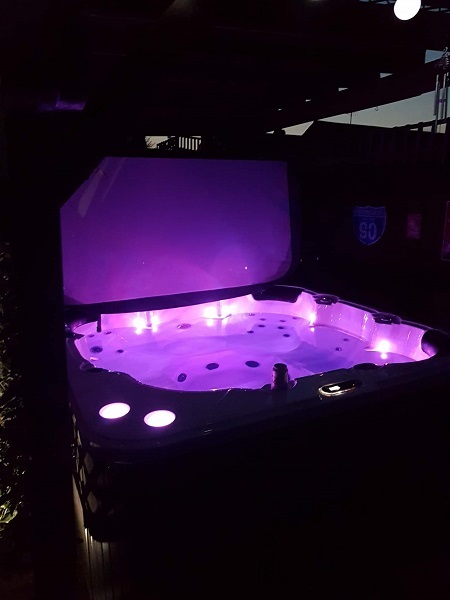 I have no hesitation with regards to recommending Hot Tub Suppliers to any of my friends, family or any other interested party who are looking to buy a Hot Tub. 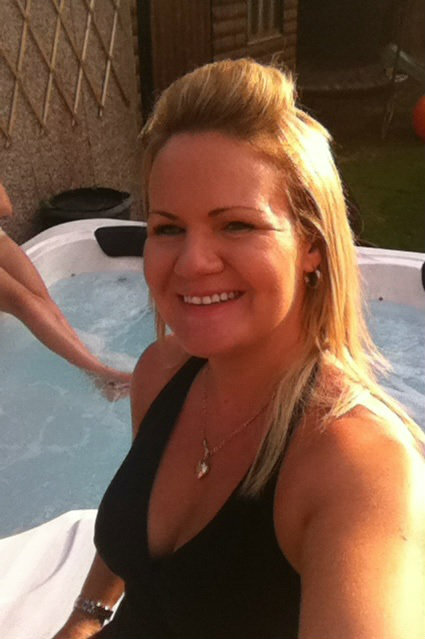 I just wanted to say a big thank you for so kindly organising and delivering the hot tub to Alesha last week. I heard back from Alesha's mum to say how much she is enjoying it and said 'I've never seen her as calm and relaxed'. With Give as you Live you can turn every pound you spend online into funds for Starlight. Starlight Children's Foundation ordered a Countesa Deluxe in midnight grey with a midnight grey cabinet. Very good service from beginning to end. Always at the end of the phone for any questions that I had. 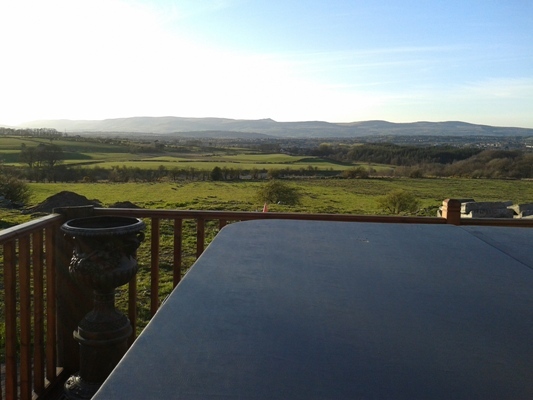 Arun went out of his way too arrange a local visit for me to see one of their hot tubs in situ. The whole process was very easy. One satisfied customer. Many thanks for all your help. 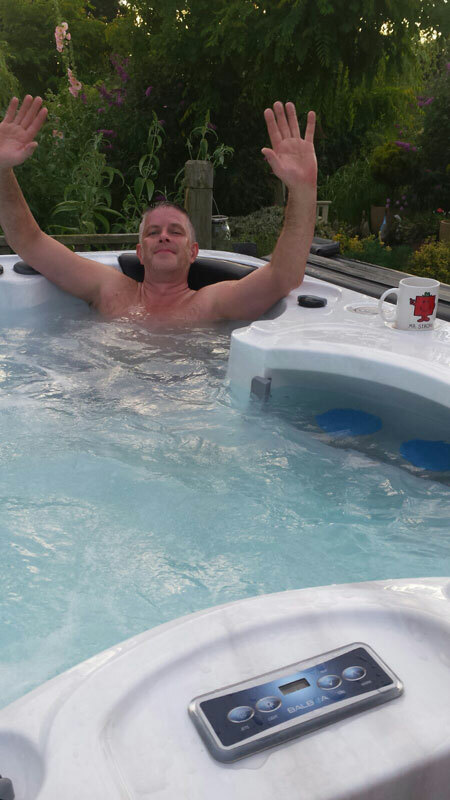 Well pleased with lid to my new Countesa Hot Tub. 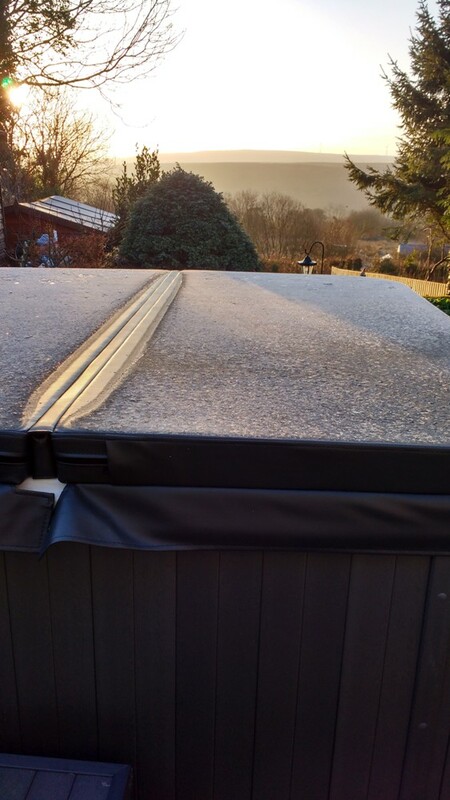 Really hard frost but lid is very well insulated. No heat escaping. Daphne Ordered the Countesa in Pebble Grey with Steel Grey cabinet. Great service no problems. Love the tub! I'm delighted, wish we'd have purchased one years ago. Very reassuring to have help at end of the phone. Aftercare fantastic. 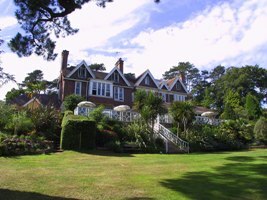 We recently worked with The Orestone Manor Hotel in Maidencombe, Devon. 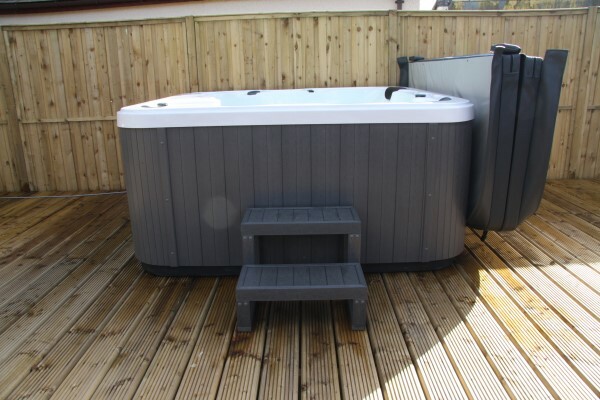 They bought two Pebble Grey Zeus Deluxes' along with Drinks Trays, Towel Rails and also Hand Rails. 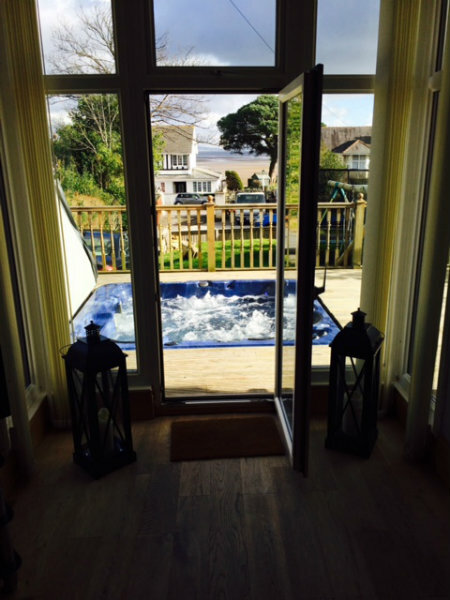 These two Hot Tubs have gone in their new Coach House Suites which each one has their own private Hot Tub. 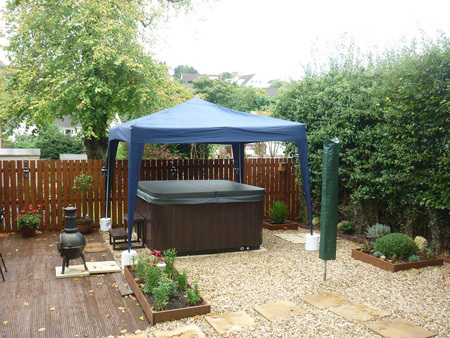 After researching hot tubs online for quite some time, I opted for Hot Tub Suppliers due the fantastic email/phone service I received and the confidence that their online reviews gave me. From ordering to delivery I was kept updated at all times. 1 Year later, the hot tub still looks brand new and works flawlessly. Very happy, thank you. 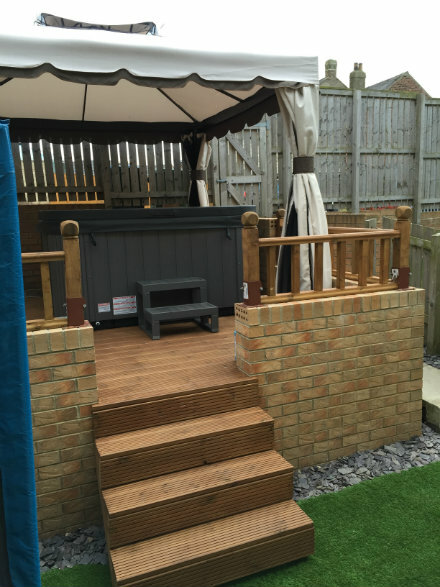 We first spoke to hot tub suppliers when we have a problem with an existing hot tub where nobody would give us any help or advice . I spoke to hot tub suppliers and not only did they give me advice over the phone but also emailed some pdf’s and links as well to help me . 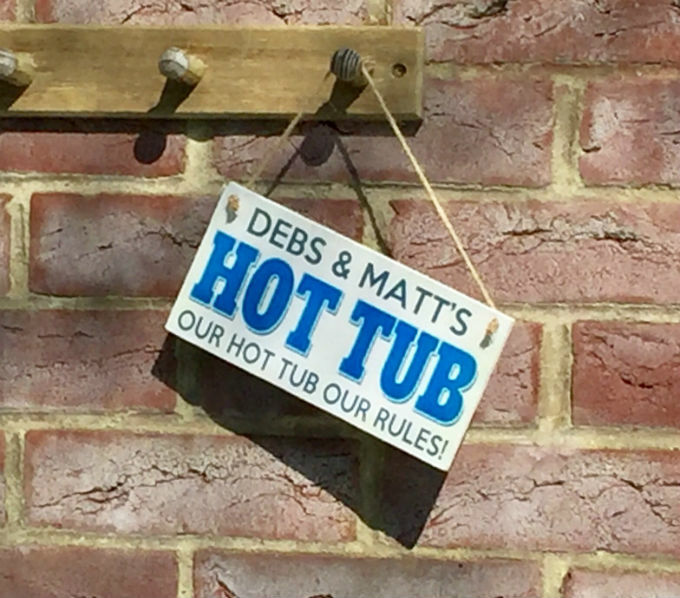 It was then later in the year when we decided to upgrade the hot tub and remembered the name and called them up. 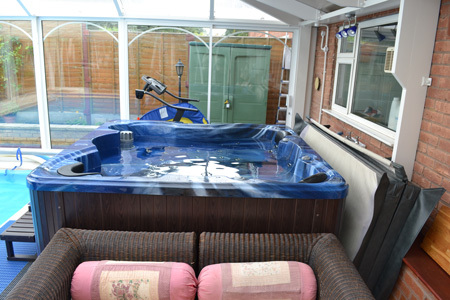 We again spoke and discussed options and even drove down to Leicester to see the hot tubs and speak to them. 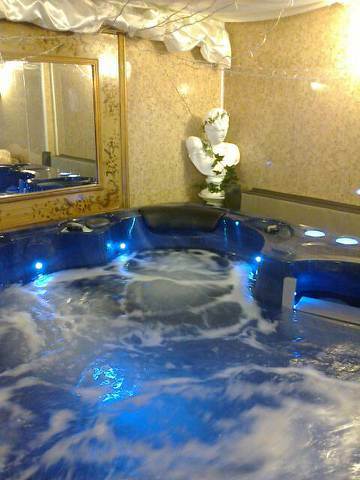 We ordered the Emperor Deluxe models and we are very happy , we use the hot tub 3 – 4 days a week we find it very relaxing and easy to use. 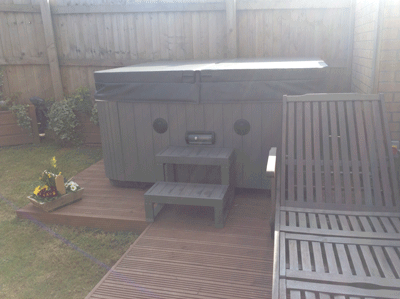 David ordered the Emperor Deluxe hot tub in midnight grey with midnight grey cabinet . Thank you so much for our new hot tub! Really quick delivery & any problems we had resolved quickly! From start to finish, Aran made the whole process really easy, always on hand to answer any questions. Our hot tub always has a steady stream of guests ready to jump in. Have already recommended you to many of our friends. 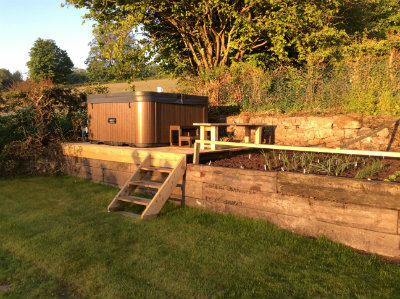 Our hot tub takes centre stage in our garden. Mrs O is Over The Moon ! A big thanks to all for getting this to us before xmas. Mrs.O'R is over the moon as am i.
Hiab people were great too! Customised service, very professional but "friendly" and "real people" aspects sadly lacking from most commercial firms nowadays. The girls are really chuffed. Many tub parties have already taken place!! Installation was great although it was extremely wet on the day. Really pleased thank you very much. Leigh ordered an Athena Deluxe in Pebble Grey with an oak cabinet. 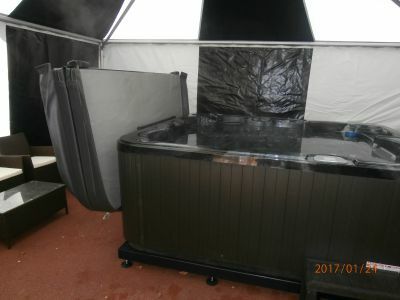 We were looking for a hot tub after our friends had recently purchased a Poseidon from hottubsuppliers.com, however we decided on buying one from another company, we paid a 30% deposit & they promised the tub would be here within 12 weeks. 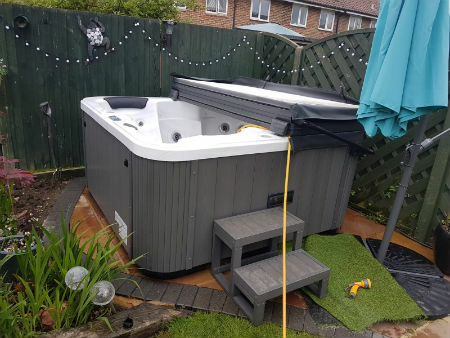 Coming up to the 10th week my dad phoned them to get some information on the hot tub,they said it would be an extra 2 weeks.... 4 weeks later they then said it would be another 2 weeks. After 16 weeks my dad decided to cancel the order. They refunded the money 3 weeks later. He then called Arun from hottubsuppliers.com asking for advice on what hot tub to get. We decided to order the Dynasty hot tub through the “build your own” section on the website. Arun kept us informed all the way through until the delivery day. 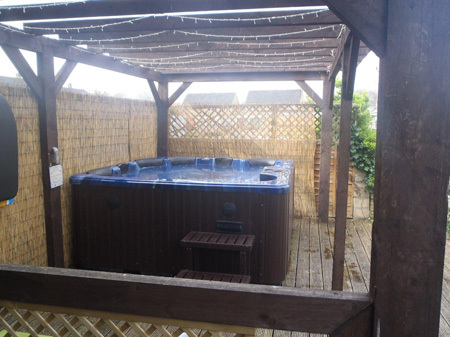 I kept pestering my dad saying “how long is it going to be?” my dad kept saying “soon” finally after nearly 7 months (from the original enquiry) of waiting the hot tub arrived. 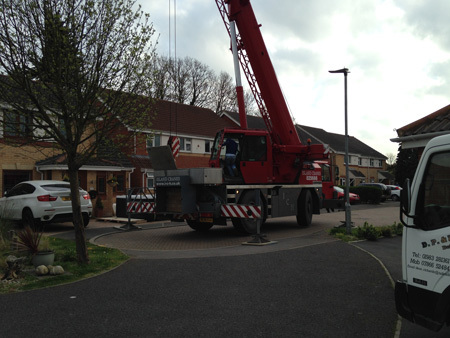 It was quite scary watching the crane lift it over the garage. It is now in place and we are all very happy with it. We are using it every night, it is absolutely fantastic. Dad has put me in charge of looking after the water quality “I haven’t turned it green yet” Thank you to Arun and his team at hottubsuppliers. Just wanted to send you some pics of the Hot Tub that we love so much. It really sets off the garden in our new home and has been the cherry on top! The price and quality of the Hot Tub are phenomenal and your service is of the same level... What a pleasure to deal with you guys. 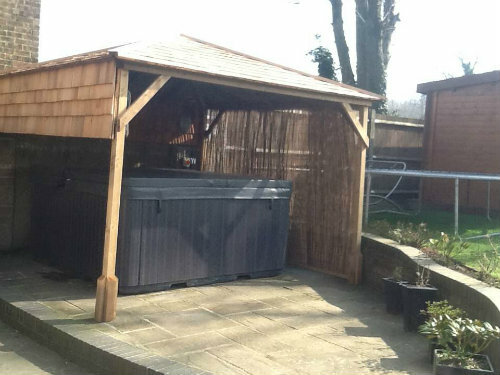 We initially consulted with Arun regarding which tub would suit us best, once the decision had been made the process of deposit/final payment and delivery was effortless. 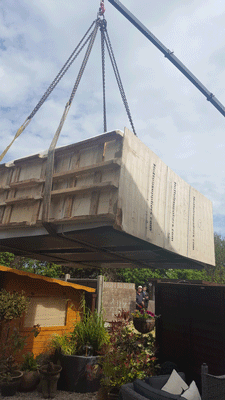 Arun also provided details of companies that could help with lifting the tub into place etc. It arrived promptly and is stunning, surpassed my expectations. I spoke with Arun regarding the chemicls/maintenance of the tub and was given excellent advice and guidance as well as the youtube step by step guides. I have also spoken to Arun regarding some of the tubs features etc and each time I was given great advice. 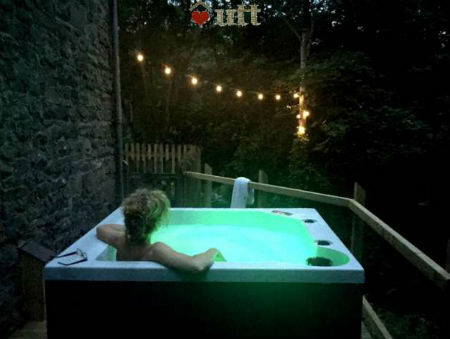 We love Hot Tub Suppliers and also love our tub! This must be one of Arun's longer deliveries requiring considerable patience for which he must be complimented. 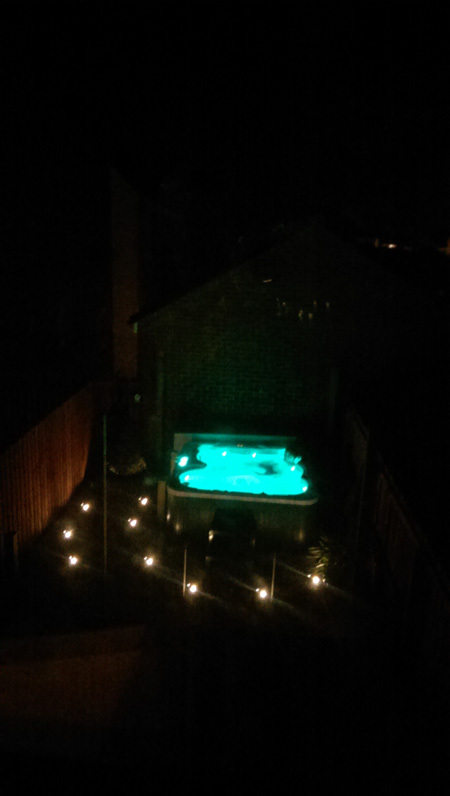 This is our third hot tub having had them in each of our last two houses. Having decided quite quickly on the Emperor, the colour and extras, it was ordered and paid for last December for supply and delivery pre-Christmas. This tub is great value due to its size, power and number of jets. There was one due to arrive just before Christmas and it was exactly the right specification. Installation whilst not difficult required the hiring of a large mobile crane to lift the tub over the house as it would not fit through the side gate. Arun was helpful finding companies within the area who could carry this out. 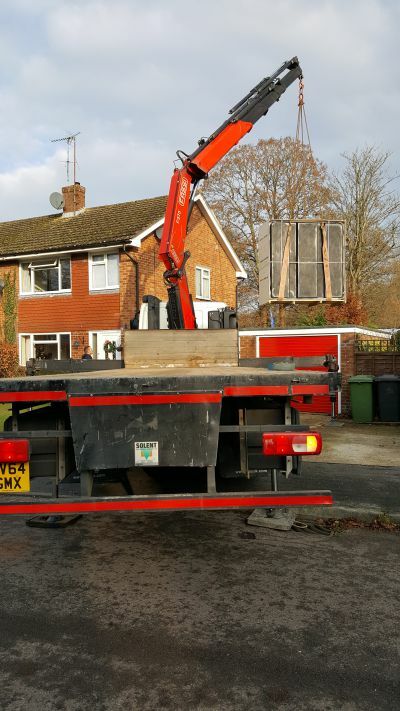 The large vehicle carrying the crane needed to sit very closely across the front of the house so that dry weather and a calm windless day was essential. 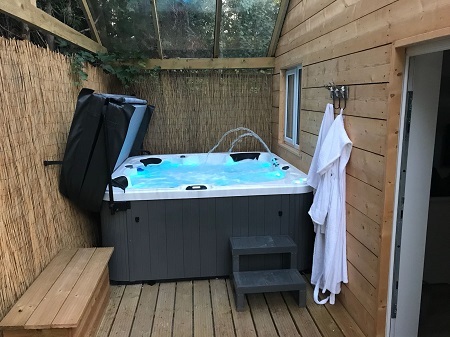 The wet winter and variously named storms (we are up to Katie) required many cancelled and rearranged delivery dates until last Thursday when the long awaited hot tub arrived, was lifted into place and installed. Arun's advice and reassurance throughout the process has been superb, particularly post-sale. His knowledge and experience might well have been expected throughout the sale and purchase but his calls of support when delivery had to be repeatedly rearranged demonstrated his genuine concern about the issues we were experiencing and helped to ease our disappointment. Friendly and very helpful. Great service. Would recommend to anyone. 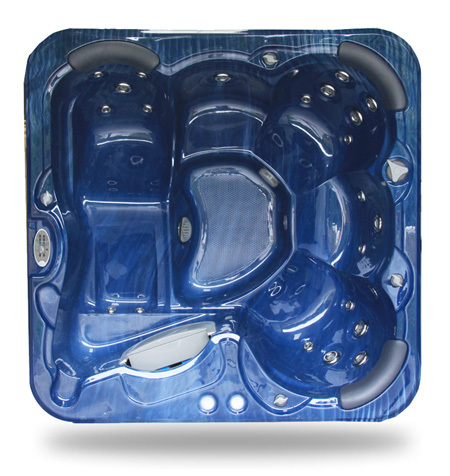 We did a lot of searching around the various Hot Tubs supplier web sites. 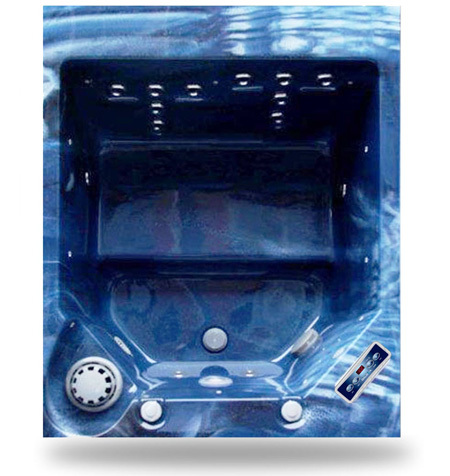 We contacted Arun at Hot Tub Suppliers to enquire about what would be the best type of tub to meet our requirements. We really wanted to make sure we got the right tub as there are so many different sizes and options available. Arun gave us lots of advice on which one would be best suited to our needs. In the end we decided to purchase a Countesa in mosaic blue. 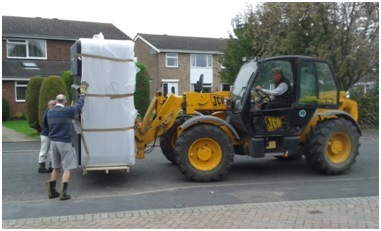 The process from the initial placement of the order to the tub arriving on our door step was seamless. The delivery was no problem, despite living in a very rural area. 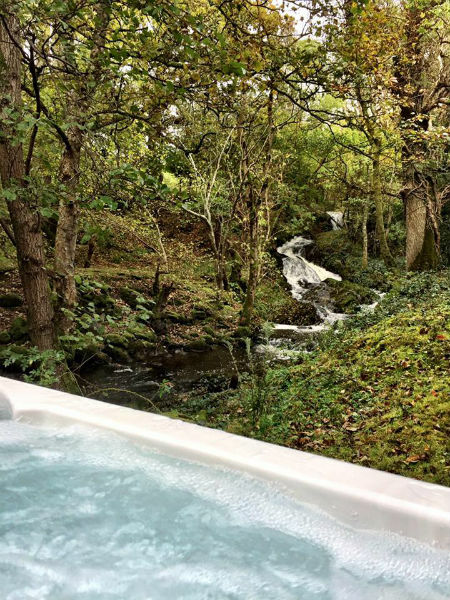 The tub is now probably used at least five nights a week as we are really enjoying the Hot Tub experience. 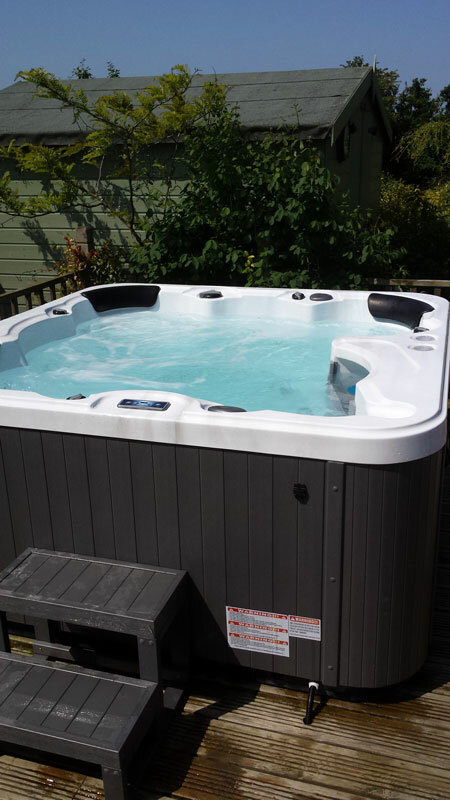 From start to finish we received an efficient service, excellent after sales care, and a top quality Hot tub. 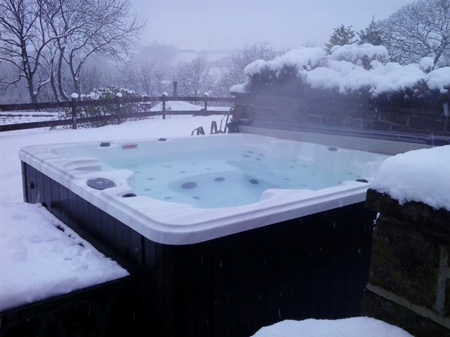 We would recommend anyone wanting to purchase a hot tub to give Hot Tub Suppliers a ring. We are very happy with the arun and his team. 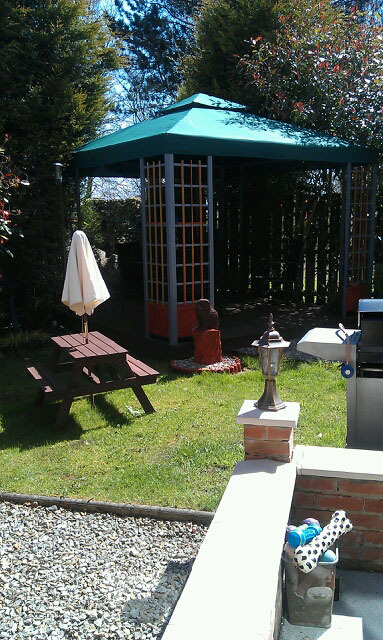 The service is excellent so is the after care too always in contact with us would highly recommend. 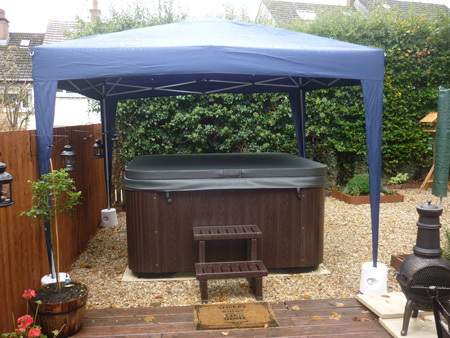 Thank you so much for the superb pre and post sale advice since supplying our Perseus Hottub. 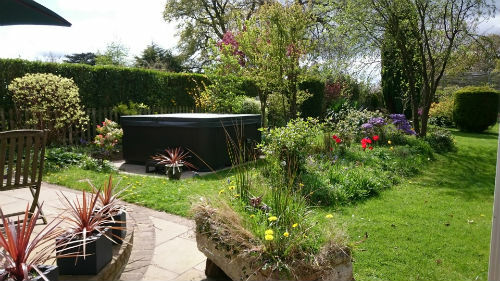 The tub itself is so easy to look after and a great addition to our back garden. I would whole heartily recommend the investment and delighted I decided to make my investment with a company that cares. Price was right, delivery was on time, installation instructions were easy to follow and it was up and running in a day. Very nice to find a company that answers the phone straight away and answers all the silly questions I should have found in the instructions. After visiting many garden centre and subsequently looking on line. I came across Hot Tub Suppliers. After my first call with Arun he couldn't have been more helpful. Being new to hot tubs, quite honestly I was clueless. But I needn't have worried. Arun was there for my numerous questions. Sending him pictures of where would be the best place for the tub and which tub would work best. He thought of everything, from the base to making sure I get the right tub with seats facing the right way. I ended up going for the Pontus. Perfect for what I needed!!!! After delivery Arun was still on hand for my endless questions. 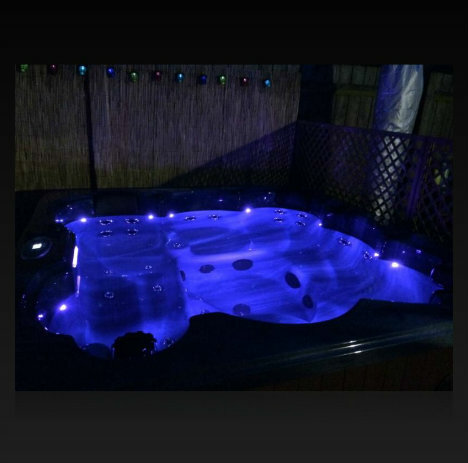 contacted arun at hot tub suppliers was very helpful in every way from advice to delivery, i did extensive research on hot tubs and honestly found these guys best around and i took weeks to decide they are honest couldn't be more helpful if they tried and ill be happy to recommend these guys to anyone, and for price well you try find better for the hot tub you order hard to beat and if you have any questions they reply asap will all the help i requested. 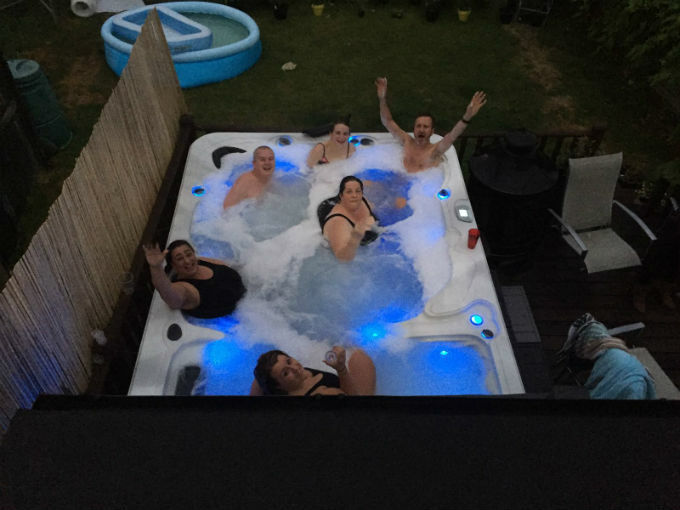 to sum up if your looking to buy a hot tub be hard to beat these guys i'm happy for my email to be given to potential buyers as more than happy to give them my honest opinion . 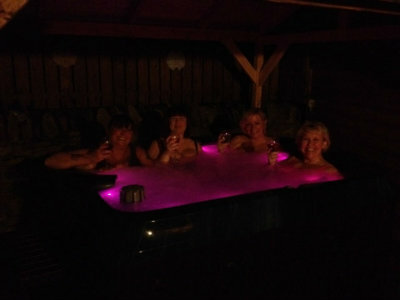 Hot tub VERY popular with the wife & her cronies; I have to serve them Champers and nibbles. I also love using it, but no one serves me anything. 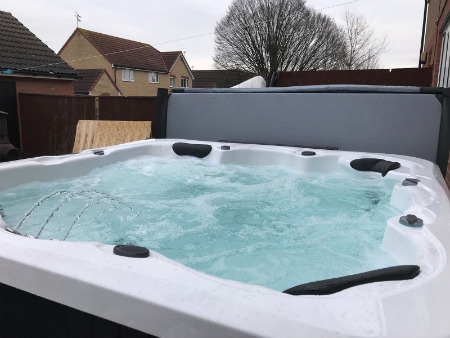 We are delighted with our Apollo Deluxe hot tub lots of great features and looks amazing, we did lots of research before buying and Arun and all the Hot Tub Suppliers team were very professional. We had a couple of missing parts on delivery but Arun responded very quickly and parts arrived after a few days plus he's always available for all those dumb questions too. We would most definitely recommend them for price, quality and service. Got in it last night, what a tub!, so impressed with it, its brilliant ! 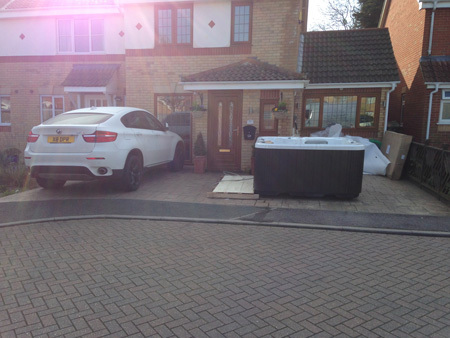 Just wanted to thank you and the guys who delivered it they were more than pleasant and really helpful and professional they are a credit to you, but the help and the after service has been of the highest quality I would highly recommend the company to anyone I know who is thinking of buying a hot tub! That you so much Arun it's been stressful but WE! Got there buddy! First class service from enquiry, sale and delivery, fully informed and updates throughout putting our minds at ease and answering any questions we had, exceptional service. 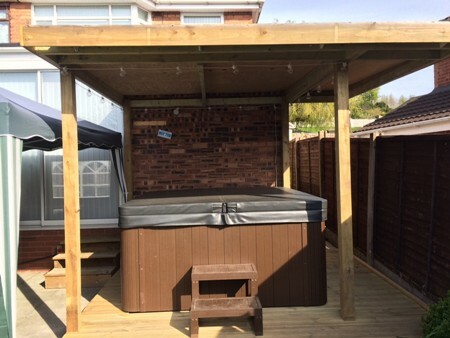 From first finding the company’s web site to the delivery of the hot tub and beyond the customer service provided by Arun and his team has been second to none. 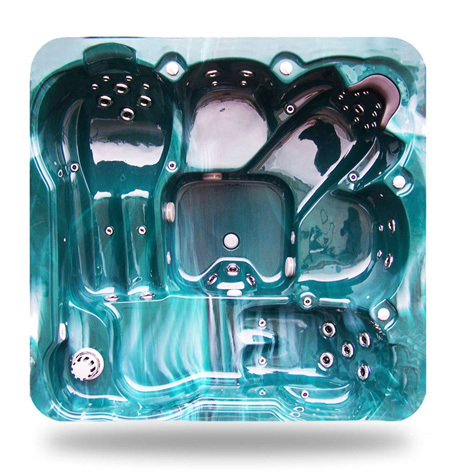 The web site allows you to design yourself a bespoke hot tub with differing colour schemes and components. It is easy to negotiate and I confirm that what you think you have ordered is what you get. 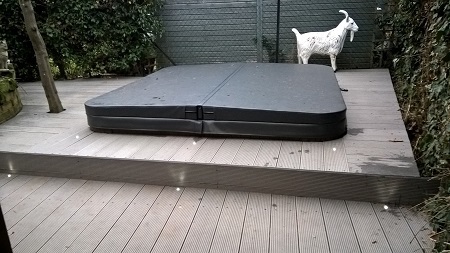 Our hot tub had to fit a hole in our decking when it arrived the dimensions from the web site were spot on it fitted with just a few inches to spare all round. 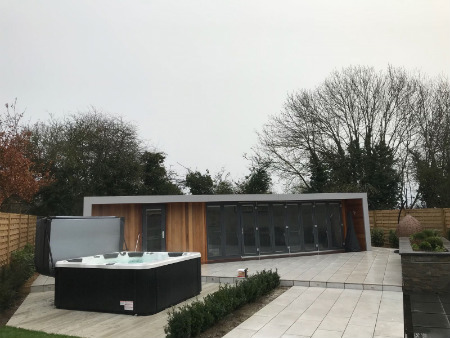 In spite of being ‘bespoke’ the hot tub represented value for money at around 60% of the price of locally available hot tubs of the same specification. Yet there is no compromise on the quality of the product which is excellent. Arun took the trouble to provide regular updates as the hot tub was shipped from the factory. The delivery team did their work with the minimum of fuss or damage. 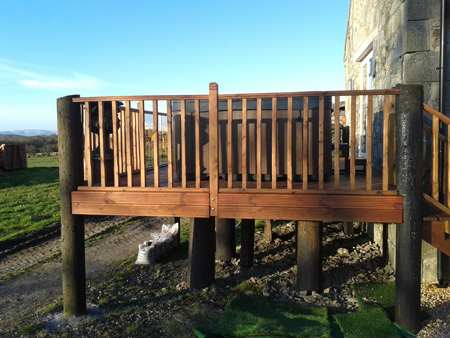 Not easy in view of the fact that the hot tub had to be lowered through a hole in decking and was beneath a canopy. There have been a couple of minor issues to resolve since the hot tub was installed. Throughout my dealings with Arun, nothing seems to have been too much trouble for him and his company. Everything that has been promised, has arrived and fitted exactly as promised. In conclusion this company’s Customer Service is an example that so many others could learn from. 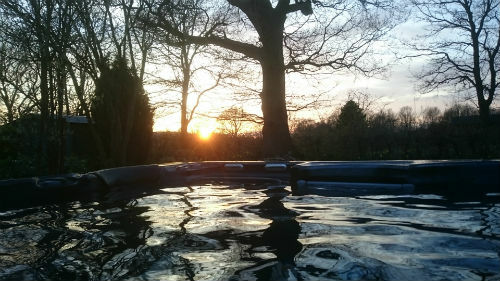 Based on my experiences, I would happily recommend Arun and his team trading as www.hottubsuppliers.com to anyone wishing to purchase a new Hot tub. A relaxed, pleasant experience from start to finish. Arun and Brook were expert and helpful, particularly when dealing with my concerns over whether the tub would fit through my garage. I thoroughly recommend Hot Tub Suppliers. 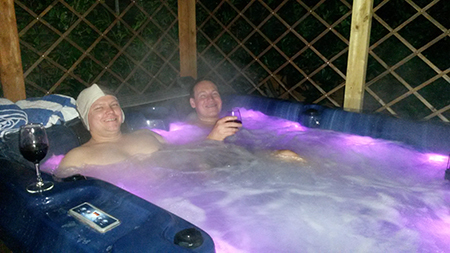 After a lot of research into Hot Tubs we came across Arun at Hottubsuppliers. There was no question about it, we were going to order our Hot Tub through Arun. He was so helpful and answered all of our questions. We opted for the Perseus Deluxe. We have two young children and felt this tub would give us plenty of room - and it certainly did. The Hot tub arrived on the exact week that Arun predicted and it was soo much better than we could have ever expected. We love it! The loungers are our particular favourite. We go in the tub about 4-5 times a week and absolutely love it. We go in it as a family and also of an evening me and my wife go in it when the children are asleep and it is so relaxing. 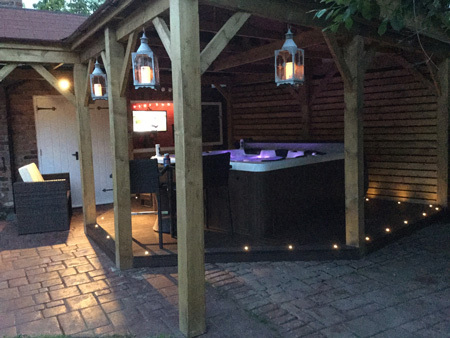 We also invested money in buying a shelter, composite decking and a bar area with flat screen TV which really makes a big difference and compliments the hot tub! 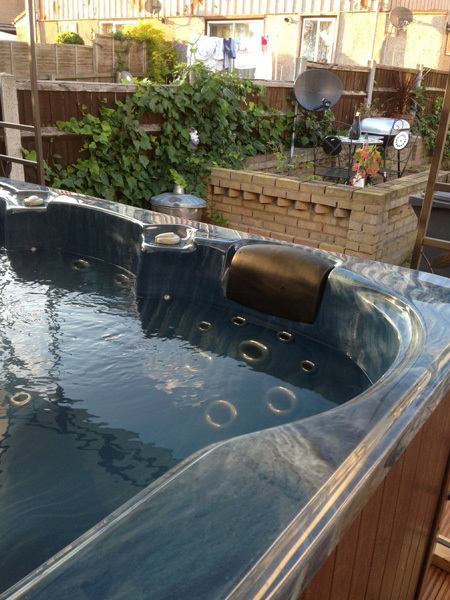 I would not hesitate in recommending Arun with his excellent personal service and top quality Hot Tubs. They offer excellent value for money. Polycarbinated the walls,satin material stappled 2 the ceiling.flashing lights drapped round bk of the mirror gave my roman cleopatra look ! Its lush all my family enjoy it. All our family from 6 years of age to 66 of age benefit from a great party tub when required or a relaxing hydro therapy relaxing tub. we have so many happy times from grandchildren swimming splashing to teenage party's to relaxing and pain relief for the adults. out of this world. Its amazing how family come around SO much! Haha! Bubbles Bubbles and more Bubbles! 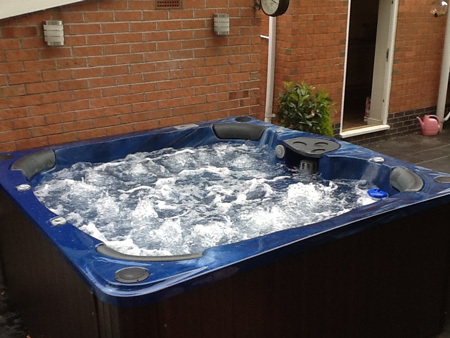 Fantastic service, fantastic after sales service and a fantastic value for money hot tub! What more can I say....attached a few pics to share with you guys up there! A million thanks! What an amazing company from my first enquiry to turning my hot tub on the service was first class. I would like to say a massive thank you to Arun and his team for all there help. Top company, would highly recommend if your are thinking of buying a hot tub. 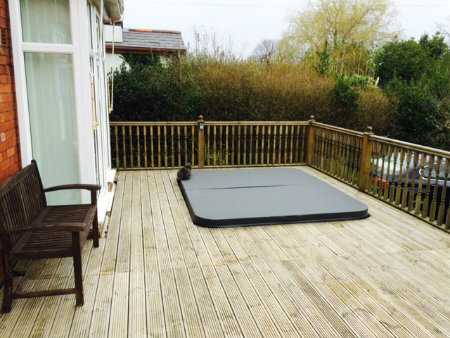 We have been extremely pleased with the service and product received. Not only were they extremely helpful through the ordering process but the after sales service has been excellent - thank you. 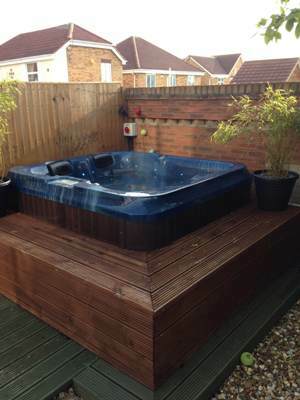 Great investment and have used hot tub all year round. Thank you for all your help with choosing tub and delivery we are all having a great time and enjoying our emperor tub as you can see. Great service and very helpful if I have any questions. Thank you for all your help. Informative, knowledgeable, excellent service, delivery was simple. Got an excellent price for the specification. I would HIGHLY recommend. We love our Tub. 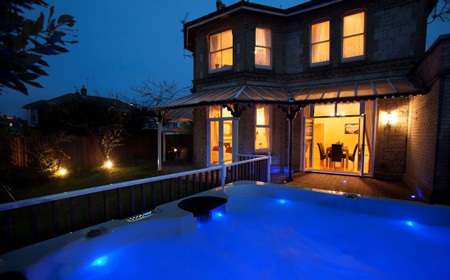 Fantastic deal, fantastic service, fantastic aftercare and a fantastic hot tub. I kid you not. I got a lovely hot tub by accident. Let me explain that a little better. On my way to work I was rear-ended and suffered whiplash as did my husband. So after physio etc we were blessed with a cheque from the insurance company. So what to do with this. Now I am not wealthy! Just a pensioner still doing a bit of occasional supply teaching and my husband is a retired Baptist minister. We wanted to do something with this money that would be beneficial to us. “HOT TUB !” I suggested. “Oh far too costly to buy and to run and to maintain!” exclaimed the husband, ever cautious. But off we went to one place after another looking for tubs. I can be quite persuasive! The prices made me blanch. Undeterred I turned to the internet and that’s where I found Zspa hot tubs. I was amazed at the prices and so I made contacted with Arun. 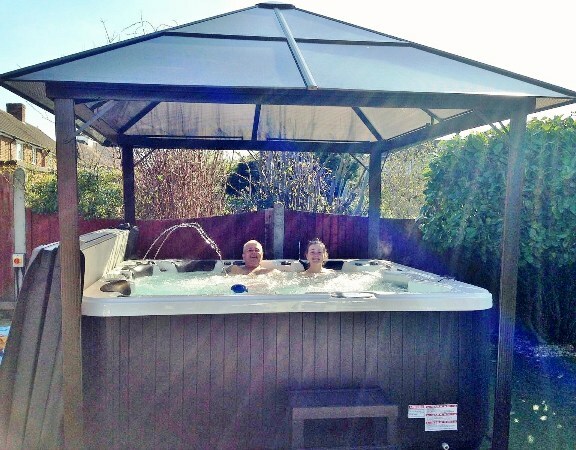 A few weeks later we went off to view a 2 seater hot tub which suited our budget and just the 2 of us. We liked what we saw. It was small but looked like the real thing. Arun was very attentive and helpful and saw us through the whole process including setting it the hot tub in our garden. That hot tub has given us such pleasure and will continue to do so for many years to come. I can thoroughly recommend soaking in a hot tub for arthritic aches and pains. And what about electricity costs. We have seen no noticeable difference and we have now been running the hot tub for a year. We run it at about 16°C and in the evening it gets turned up to 35°C about an hour before tubbing time. Then it gets turned down again. One evening round midnight ( yes this retired couple do midnight tubbing!) everything was very quiet and in the distance I could hear a roaring sound. “Ssssh!” I said to my husband, “Listen to that. Sounds like a lion.” Well I come from South Africa so I know what a roaring lion sounds like. The roaring continued. Yes it was a lion. Here in the UK. Yes here in Stourport on Severn. You see we are not far from the West Midlands Safari Park. Can’t promise that you will also hear lions when you are in your tub but you never know what a glass or two of red wine might do!! I can unreservedly recommend the experience to you and assure you that your bills will not go through the roof. That’s always the worry isn’t it. Good Service and easy to get hold of someone to answer questions and get help. Marcus ordered an Athena Deluxe in pebble grey with a grey cabinet. Hi Arun, sorry for the delay but i thought Andrew had done this. Excellent customer service and excellent product. 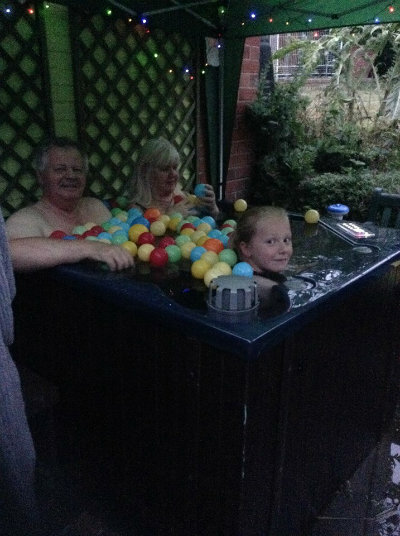 We have had lots of hot tub parties with friends and the family. I would highly recommend any one having one, i wish I had one a long time ago. 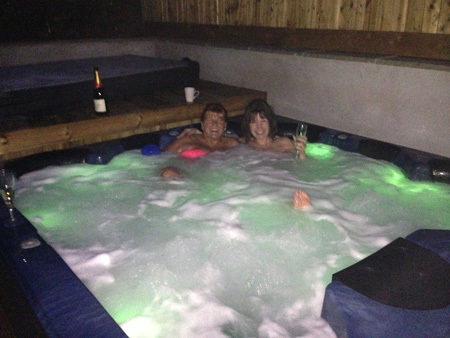 We bought a countesa hot tub from hot tub suppliers after being let down by another hot tub supplier. 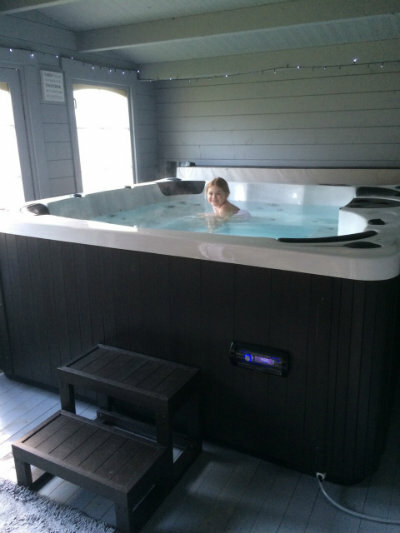 If we had known what a great service we were going to get from hot tub suppliers we would not have looked elsewhere. 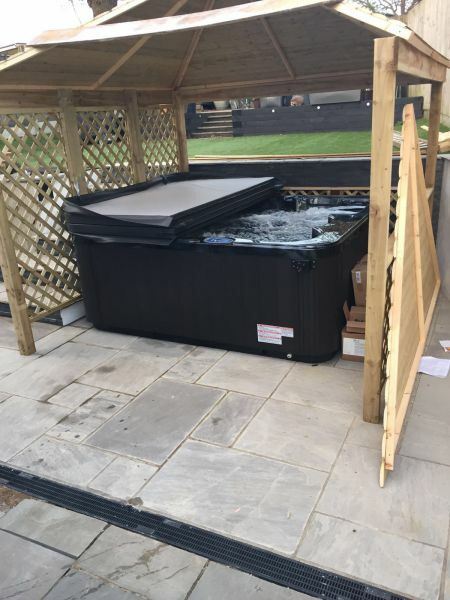 Fantastic service from Arun and his team from placing the order to receiving the hot tub, On the day of the delivery nothing was too much trouble for the delivery guys. I would highly recommend hot tub suppliers to anybody that is thinking about purchasing a hot tub. Excellent after sales service too. David ordered a Countesa in pebble grey with a steel grey cabinet. Arun. 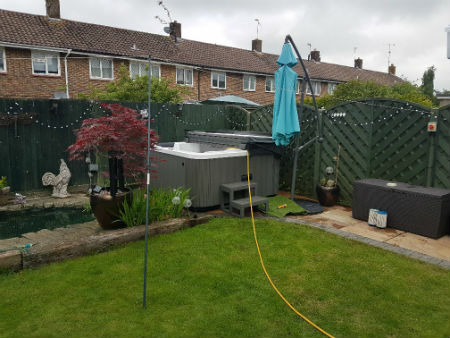 We were very happy with our hot tub we purchased from your company and would gladly recommend you to anyone who is after purchasing a new hot tub. service from start to finish was excellent. 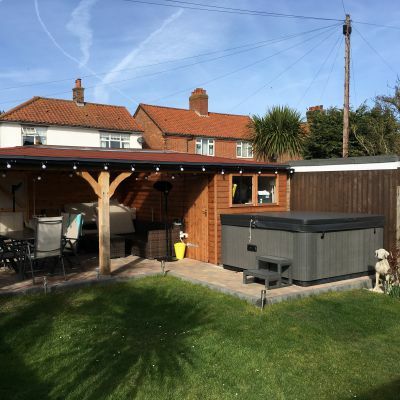 Mr. Alan R.
We purchased an Emperor Hot tub from Hot Tub Suppliers and have nothing but praise for the company and in particular Arun who helped us every step of the way, ensuring that the product selection was correct for our requirements and keeping us informed of progress. 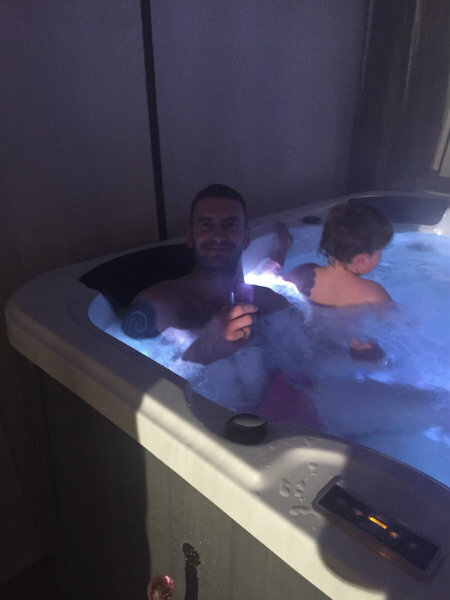 The main reason for purchasing a hot tub was to use for hydrotherapy for our son Christian who has cerebral Palsy and to play a part in getting him ready and developing movement for a Hospital assessment for his suitability for an operation which was positive, and will continue to play an even more important part in preparing Christian for his operation and his post-operative rehabilitation. Our installation was complex as the hot tub needed to be craned into position, and Arun recommended a Crane company AS Transport and the owner Alan attended himself to ensure that the lift was planned and undertaken both safely and without any problems, and on the day of installation the AS team were fantastic being both extremely professional and going the extra mile to make sure that the hot tub was positioned perfectly. Really pleased with the hot tub. Service from Arun and his team was great. Only slight disappointment is the quality of the instruction booklets which could give more detailed info. It has taken us a few months before committing to writing a review because we did not want to write a review based on momentary excitement we want it be to realistic based on months of use. 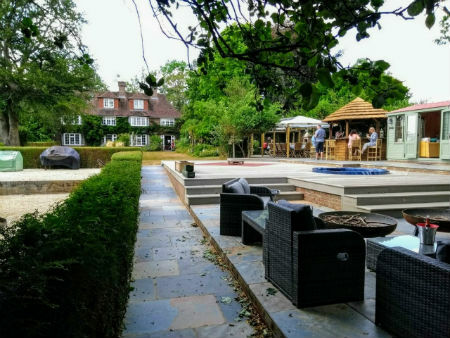 First of all we research a lot and we spoke to many people and to be honest here is where Arun shone, he did not try to sell us anything, he simply answered question after question and gave us brilliant feedback, in fact he challenged our though process to ensure we were 100% sure we want a hot tub. He then talked us through the selection process and installation process and when we finally decided to purchase a Hot Tub we wanted it quickly but Arun helped us to think about what we really wanted and hence we did not take the Hot Tub in stock (he could have sold us this one) he told us to wait and get the product that best suited us. From then on the process was easy a small deposit and then regular updates before the tub arrived. When the tub arrived the team installed it at our choosen location and, the overall quality of materials and construction is very high. 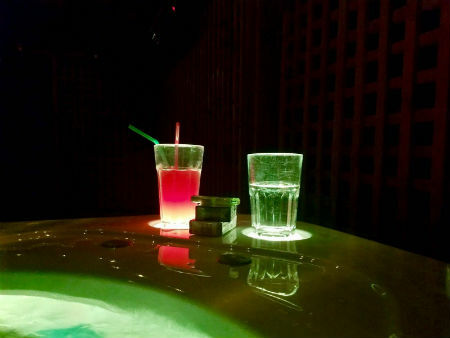 With respect to the hot tub it takes some experimenting to figure out which jests work best in which seats but the controls are very easy to use. 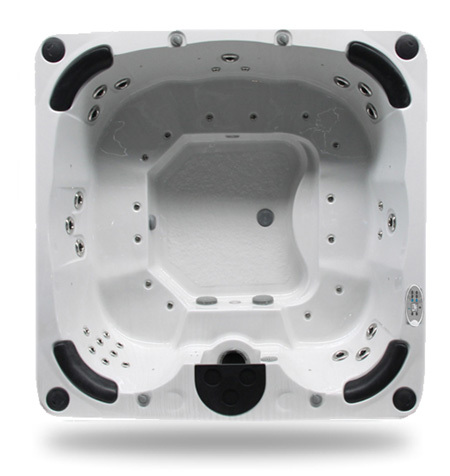 The deep corner seat, is brilliant for the back and there so many other shoulder jets in this hot tub, that relaxing is the name of the game. 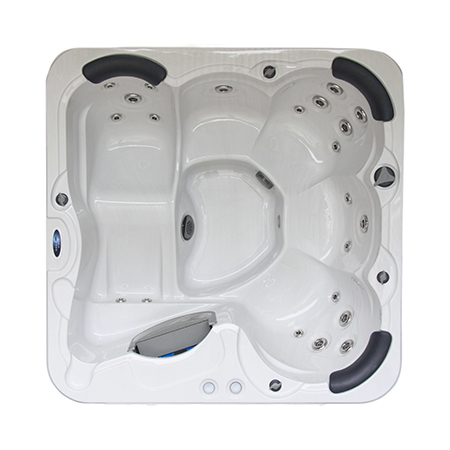 However, one of the key features of the hot tub is it has enhanced the quality of life for both family and friends. 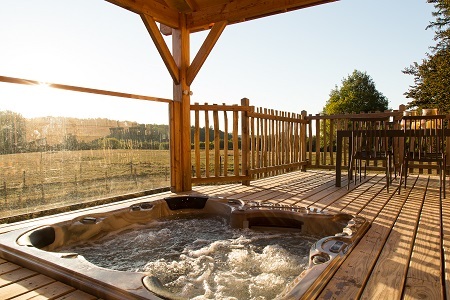 The hot tub has reinvigorated conversations and fun time and as a result we have enjoyed each others company than much more, we now look forward to spending more time outdoors. Thanks Arun. Finally, the hot tub its self is of high quality, its easy to use and maintain, has lots of great features and is probably one of the lowest cost hot tubs in terms of money, but do not be put off with the modest cost because there is no compromise on quality, I don’t know for how long Arun will be able to maintain these prices but while he can this tub is a bargain. So, in summary, a quality product at a very reasonable price. 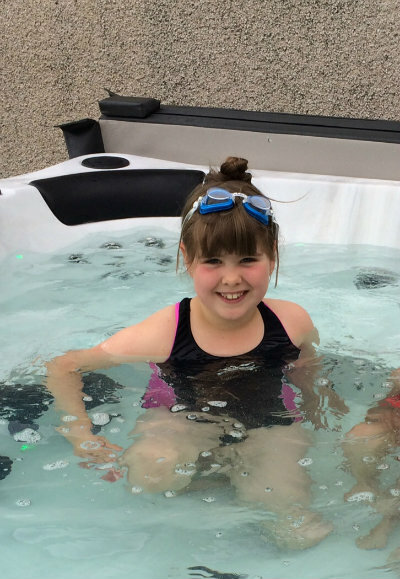 It has had some person benefits in terms of hydrotherapy but it has reinvigorated conversations and brought the family closer. 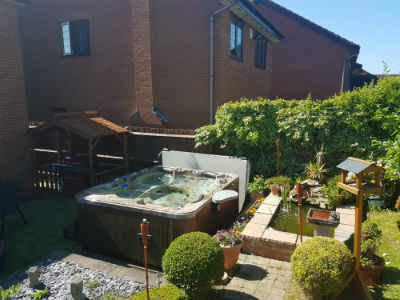 Therefore if you are looking for a hot tub and want quality and service then I suggest you speak to Arun, addtionally you could say yourself a lot of money as well. 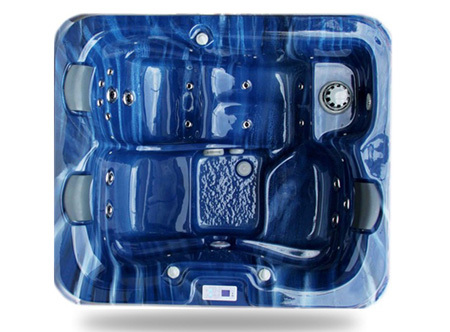 Terry Ordered the Poseidon hot tub in mosaic blue with steel grey cabinet using the "design your own " hot tub section of the website. 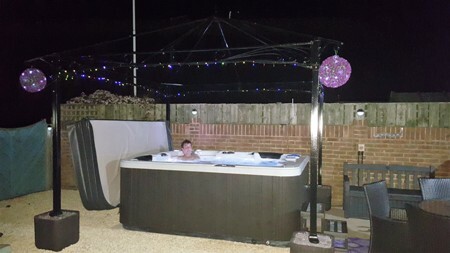 I would highly recommend hottubsuppliers.com The service is second to none! 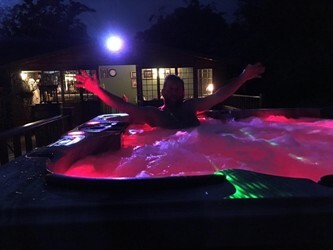 Arun goes well beyond the call of duty and takes customer service and customer satisfaction to another level, I highly recommend the company to purchase your hot tub from, you won't find a better company anywhere else, a very personal and fantastic service. 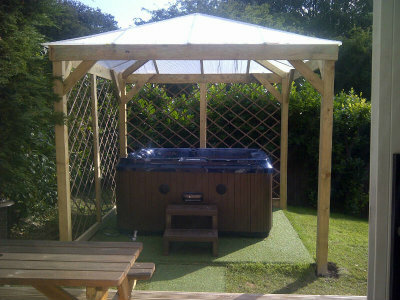 Very pleased with my hot tub, quality is great and it gets used every day. Pre delivery advice from Arun was extremely helpful, with all my questions answered immediately. 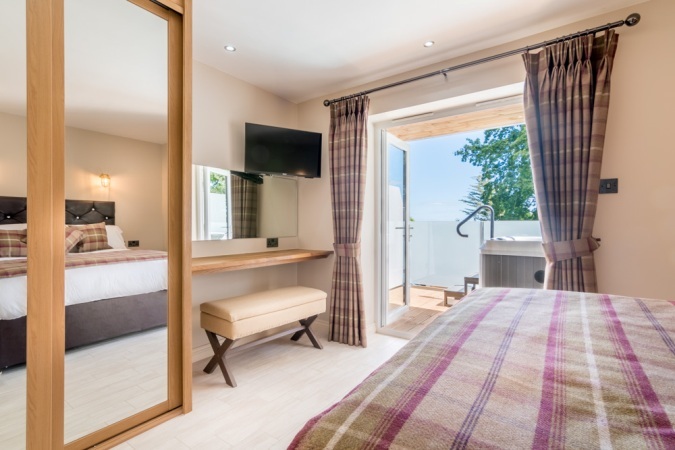 Atro Lodges we have impeccable standards in style & quality. 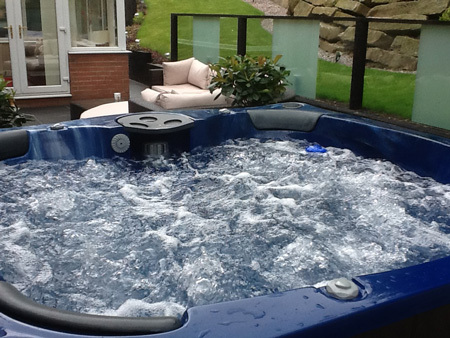 we only wanted to work with a quality supplier of hot tubs so we are very happy to be working with Hot Tub Suppliers. 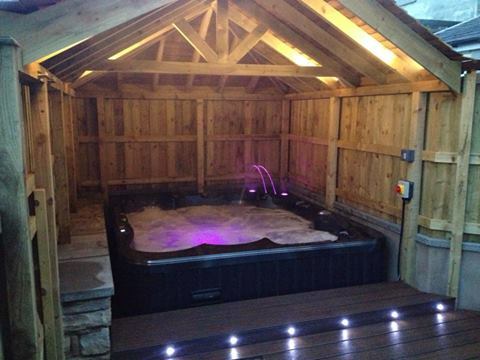 All our hot tubs are supplied by Hot Tub Suppliers & we look forward to working on future projects with them. Can not praise the team enough. Having been left in tears by a rip off merchant the Hot Tub Suppliers stepped in with not just a fabulous tub, delivered when they said it would be and with loads of useful tips for getting the best out of it, they also put me in touch with the right people to get my money back from HIGHLAND SPAS...do not go near them they are con men and you will not get a hot tub....Stick to these guys you won't regret it. 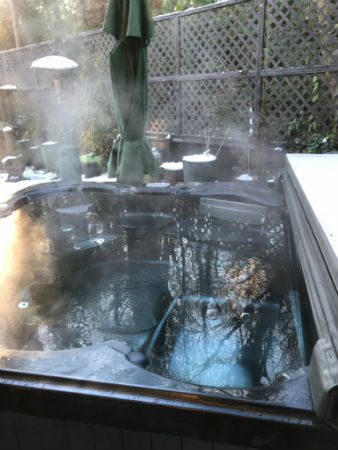 My hot tub adventure started in 2012 when I first decided I wanted to buy a hot tub to give me some relief from the pressure of work and aching limbs . 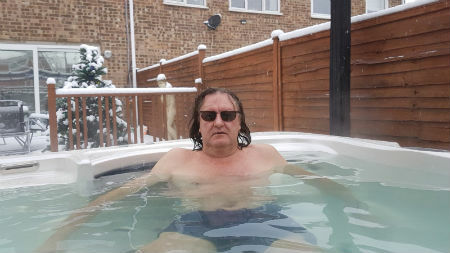 I found a website called highland spas and the prices was very low and so I went ahead and ordered a hot tub from them ................. and paid in full. After the order the delivery which was a few weeks , became a few months and I was struggling to get any firm dates on delivery from the company and also i found it hard to contact the company . Eventually through sheer persistence , I managed to contact a representative of the company but again I was given false promises which eventually concluded with a cancellation and a request for a refund on a payment on a order which was not delivered. This also proved very hard to receive and over 9 months after placing the order we received our money back with a harsh lesson learned . We did not want to go through an experience like that again. It was during this time that i contacted hot tub suppliers in Leicester , they was very supportive of my plight and reassured me that they do not work the same way as highland spas. 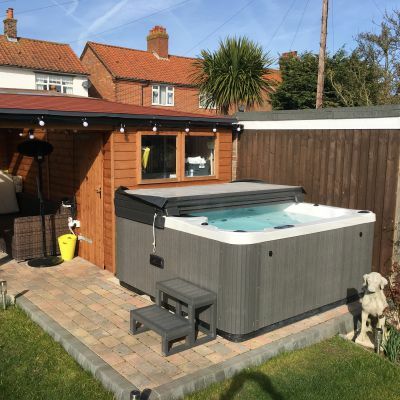 Those words are proven correct as now we have our new Apollo Deluxe hot tub , we are very happy and the troubles and stress of the last 12 months are forgotten as we now have a quality hot tub and the service has been fantastic. 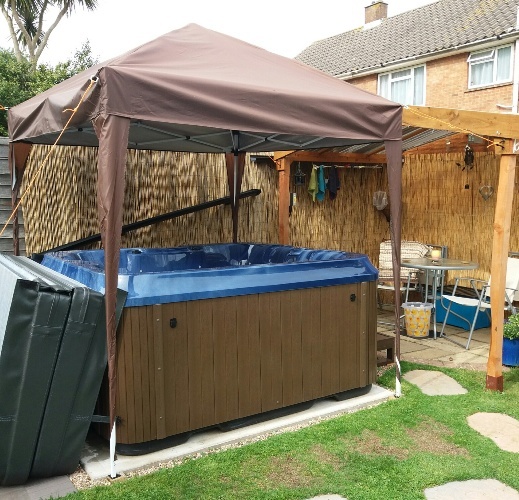 I want to thank Arun and his team for the support and service they have given us and would recommend the service and product of hot tub suppliers to anyone looking for a reliable and trustworthy company with excellent product and business ethics. We love our hot tub. Arun was really helpful from the word go when we phoned to look at some. Everything was delivered on time and with ease. Arun has also been available each time we have had a question. We would highly recommend purchasing your hot tub from here. 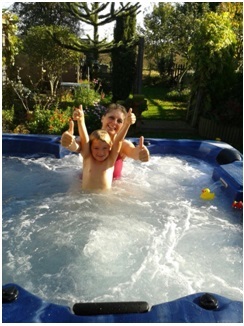 We are very happy with our Apollo hot tub and also the customer service from hottubsuppliers. 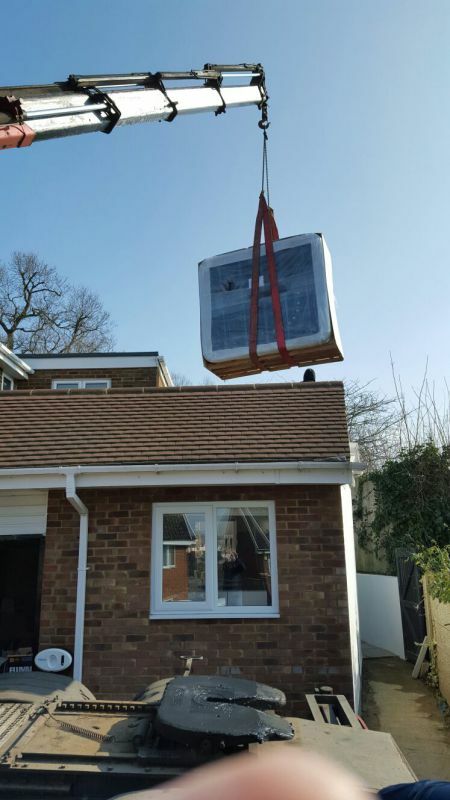 We had to arrange the a crane to lift the tub over the house and hottubsuppliers helped us to arrange this and also delivered on time so the whole process went very smoothly. I would like to conclude that hot tub terrific value for money and we would recommend this website to anyone. Peter & Gillian ordered an Apollo Deluxe in mosaic blue with an oak cabinet. Fantastic value, great support and very efficient delivery. 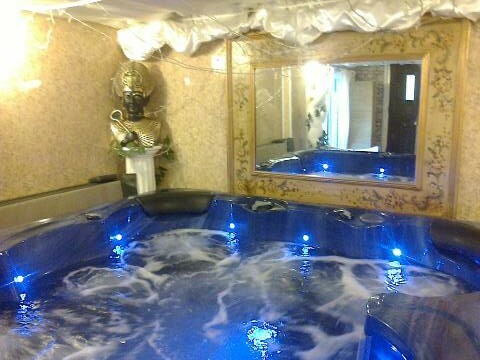 We have been delighted with out hot tub, are never out of it, and the support has been great. Thank you. 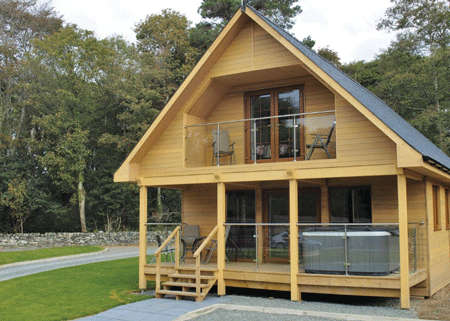 Over the past few years we have had several cabin holidays in the UK which all had hot tubs. 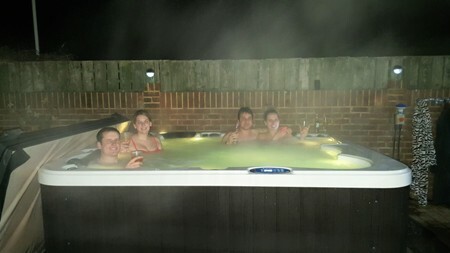 Despite the fact that it was nice to get away we realised that the main reason for going was the hot tub so it seemed to make perfect sense to see if we could get our own and probably save money in the long run. 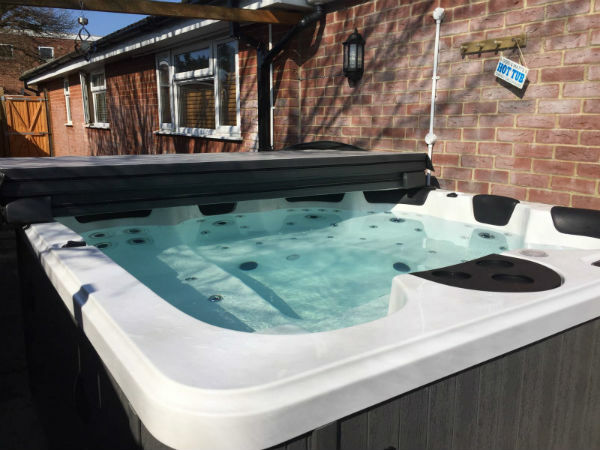 We started doing our research by getting quite a few brochures and magazines and a bit of searching on Google which is where we came across Hot Tub Suppliers and decided that seemed to be the best place to buy one. As seems to be the case with other reviewers we showered Arun with a multitude of questions and he managed to answer them all as well as giving practical advice. Our only real issue was actually getting the tub in place as we wanted to avoid the very expensive over the house option. Fortunately, Arun had a local contact for us and they were able to get the tub in place with inches to spare. The tub we finally chose was the Poseidon which is a big one with plenty of options but we did have a large area of dead space behind our garage and we went for the build your own option as we wanted the Atlantis Green colour. Delivery took just under 12 weeks, as promised, which gave us plenty of time to get the electrics sorted as well as laying the concrete base. Delivery day was easy and we were kept well informed on progress throughout. The electricians connected us up soon after and then it was just a case of fill the tub, press a few buttons, add the bromine tablets and just wait for it to heat up. 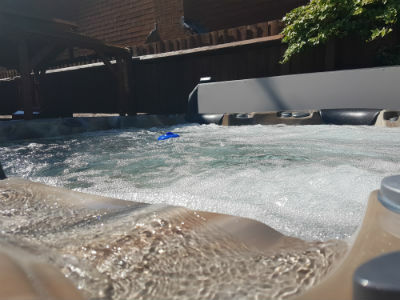 We have thoroughly enjoyed using the hot tub over the past few months, usually 4-5 times a week, it's easy to look after and we wouldn't be without it now. 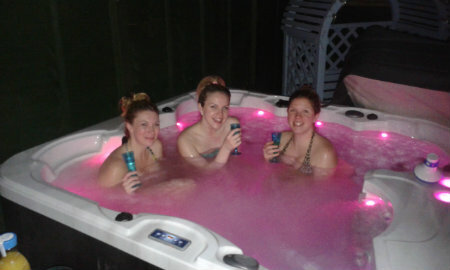 For anyone thinking of getting one and having any doubts we would strongly recommend Hot Tub Suppliers. Thanks again to Arun and the team. 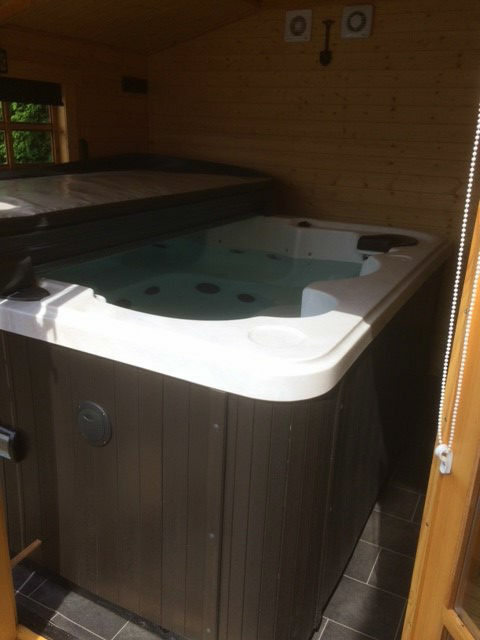 Simon & Andrea ordered the Poseidon in atlantis green with midnight grey cabinet using the build your own hot tub section of the website. We love the tub and it looks great. The service and delivery was excellent and you were a great help with any queries we had. Thank you very much. From the first telephone call we made, Arun was very friendly and helpful, giving us all the information we needed without pressuring us in any way. He kept in contact, and when we bought a tub it arrived exactly when he said it would. When we discovered after its delivery that our hot tub had a crack in it he immediately arranged replacement as soon as he could. 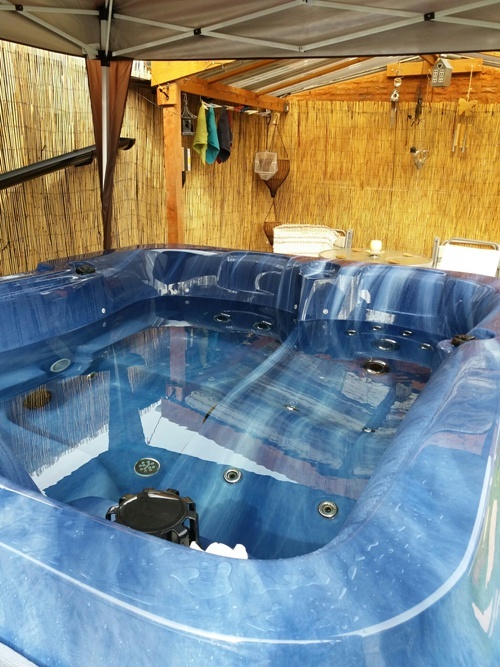 We know we can contact Arun any time for help with our tub , and we would recommend Hot Tub Suppliers to anyone looking to buy a hot tub. Wendy and Laurence. Love my new hot tub! What fantastic service I received! I would recommend anyone interested in buying a hot tub to use this company! 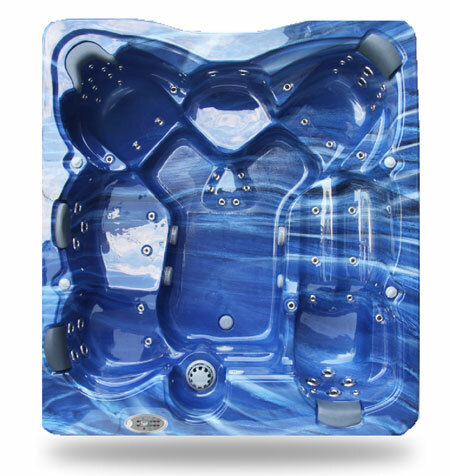 I ordered the hot tub and straightaway I received emails about delivery, how to set up and all information I needed. It's perfect it has 4 seats and 1 lounger seat! 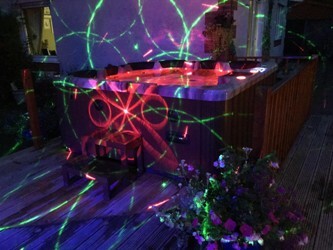 Great for me and the girls, colour changing light and stereo system! It included steps and cover. Just need try and keep hubby and boys out ha! Absolutely love it!! I ordered from another company who really let me down, 12 weeks later and just kept saying it will be here shortly, I had paid 50% deposit and was getting no answer, eventually I cancelled and used this company instead! What a difference! Thank you!! Kirsty smith-a very happy and relaxed customer!! Kirsty ordered a Countesa in midnight grey with a grey cabinet. 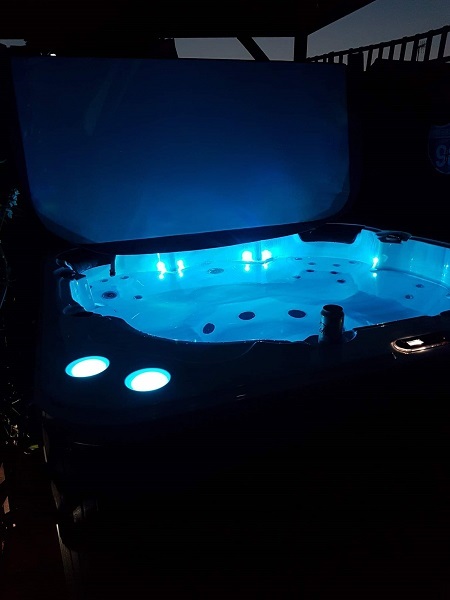 We love the Baron Pro, the 7 seater is perfect for socialising and relaxing, our daughter turned 14 a couple of weeks ago and she loved her hottub party with 5 of her friends, the built in lights and music made it a party she’ll remember. 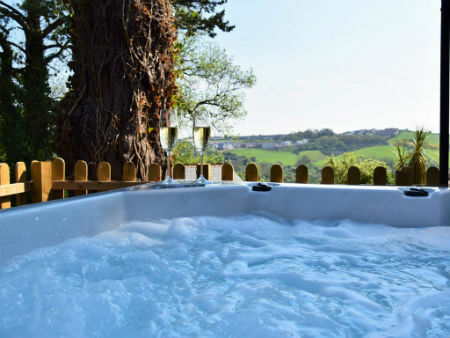 The adults are yet to party in it but we’ve already spent a number of lovely evenings just unwinding with the spa jets on and a glass or two of the good stuff….. heavenly. The delivery was a smooth operation so thank you for all your help and assistance during the waiting period and the initial set up. 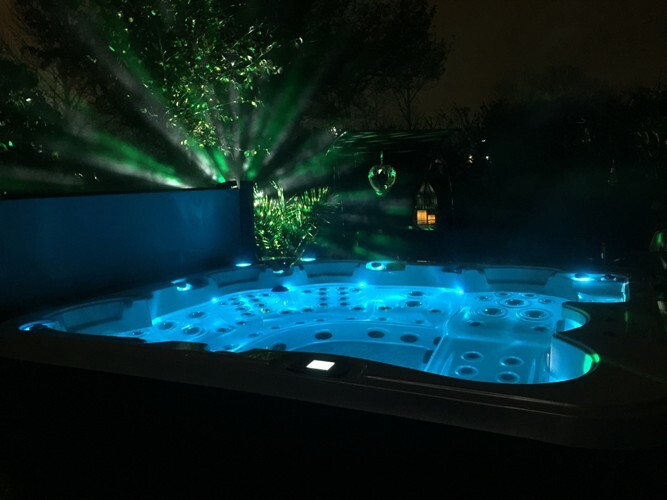 Extremely happy with the service and very helpful advice I received when ordering our Poseidon hot tub, which we've had for over 18 months now and use most days, all year round. Highly recommend both Hot Tub Suppliers and the Poseidon. 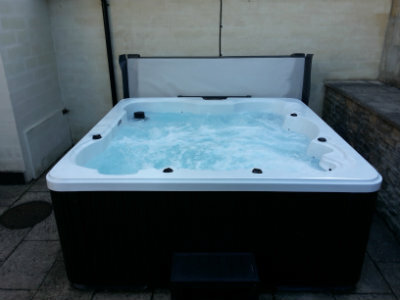 We purchased our hot tub from Arun at Hot Tub Suppliers and could not fault the excellent before and after sales service we received. I kept phoning Arun with questions before our purchase and nothing was too much trouble for him to answer my queries. The guys that came and delivered our hot tub were very helpful and polite. 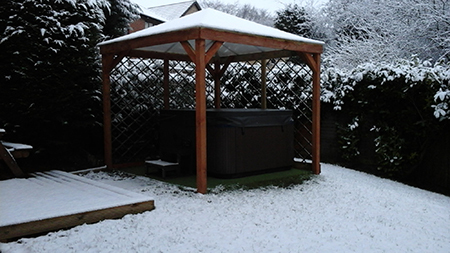 We have had out tub a few months now and have used in all weathers. Nothing better that a cold night a a clear sky. We were lucky enough to see the meteor shower last week whilst relaxing in our tub. After talking to other hot tub owners I believe we received excellent value for money. 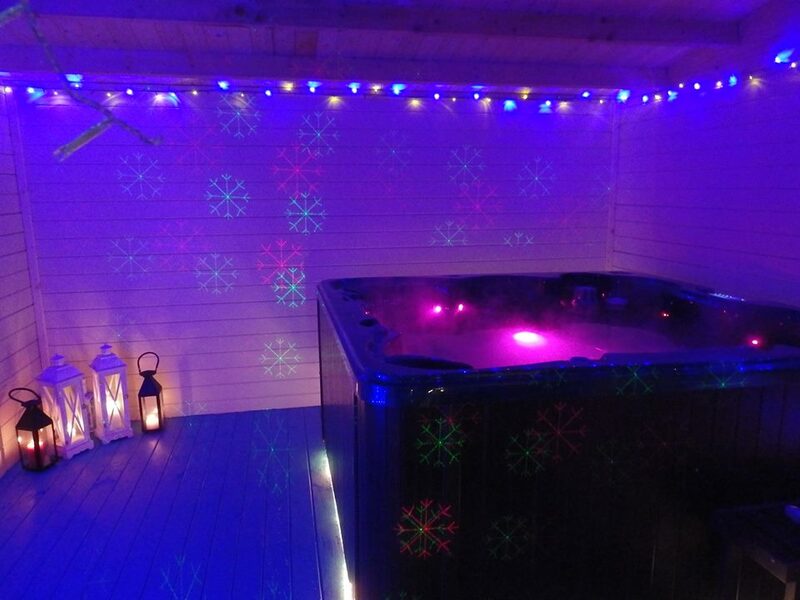 Hot Tub suppliers are an extremely good company to order from, they take the time to talk to customers over the phone with any problems they may have and when placing an order it is dealt with swiftly and the products arrive within 1 or 2 days, I would definitely recommend them. 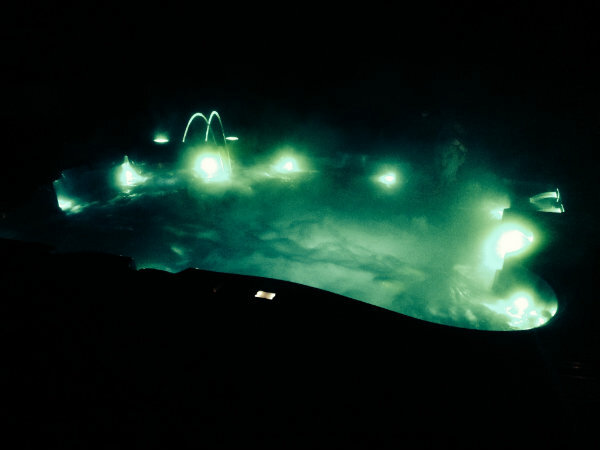 My stress levels have been kept at bay by my wonderful hot tub. What can I say other than it is the best purchase we have made we in a long time. The service from start to finish was second to none, the delivery time was fantastic and the delivery men were very polite and helpful. The tub was easy to set up and get started and is of the highest quality. We have had no problems at all with the tub and the cost of running it has been minimal. 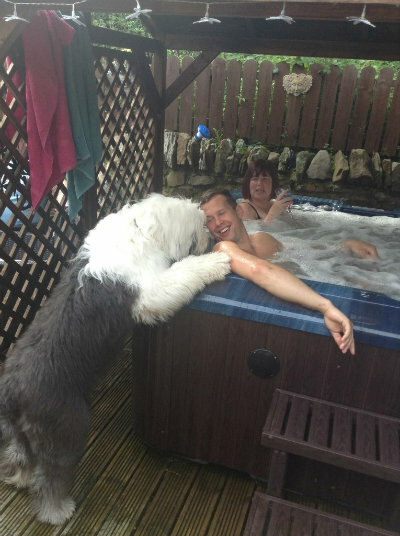 its so nice , even Albert the old english sheepdog wants to join in !! 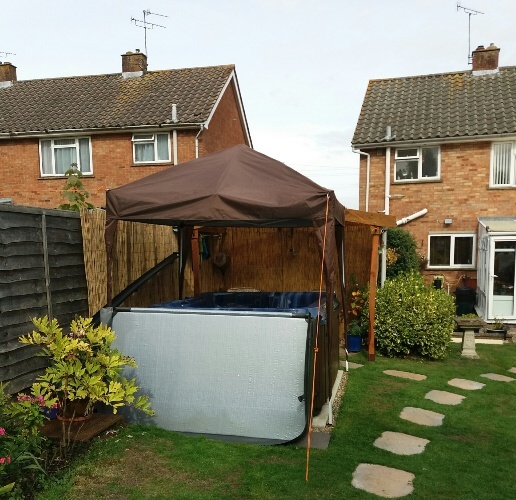 We purchased our hot tub 3 years ago from Arun at hottubsuppliers.com of Leicester and the excellent customer service continues. We recently needed a new pipe due to wear and tear. As usual Arun was very helpful, friendly and professional. The part arrived within 48 hours with instructions of how to change the pipe. 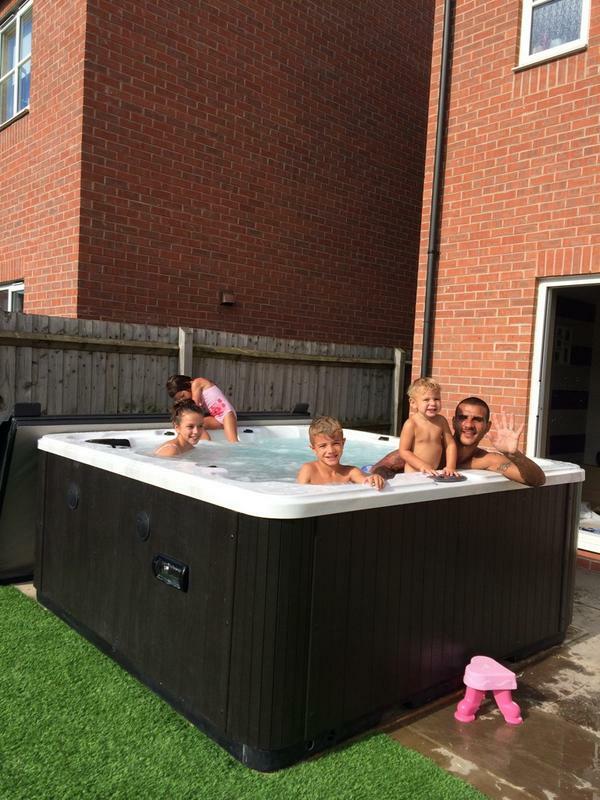 We would highly recommend Arun and his company to anyone interested in buying a hot tub. Hot Tub Suppliers & particularly Arun have been of great help. An absolute pleasure to deal with "real" people. Got our Perseus Deluxe last June,. Ordering was simple and Arun was very helpful sorting out deilivery etc. Installation was prompt and efficient. Would recommend using this company for your hot tub and hot tub supplies. Very happy . I can't stress enough how Arun conducted his business with us to impeccable standards. Arun offered a truly competitive product and throughout my first approach to him, along the customer journey he advised, and with no hard sell helped us choose the right spa for us. We chose the wifi enabled dynasty, and I couldn't be more happier with selection we made. The spa, the installation, the enjoyment was all a super experience, and I thoroughly endorse Aruns credentials and service. Just wished we had decided earlier to purchase one. Bubbles, bubbly, sunshine and good friends - sheer bliss! Jackie ordered a Countesa in mosaic blue with an oak cabinet. Great product at an extremely reasonable price. We have been so happy with our hot tub. We recommend everyone to see Arun as he is so helpful. 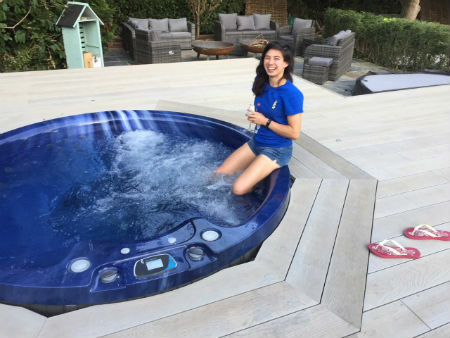 We finally took delivery of our Poseidon Hot Tub in October 2014, after weeks of pestering Arun with 101 questions, which he answered quickly and politely – even though I must have tested his patients at times! We were concerned about making such a large purchase without seeing it first and couldn’t make up our minds on which one to go for but finally decided on the Poseidon as it had more features. My husband had concerns over the size and when it was delivered I did wondered if it would be too big. The delivery guys were brilliant; they kept us informed on delivery time, were prompt and very polite and helpful. We had a local farmer put the tub on a teleporter and bring it across the brook at the bottom of our garden. Getting it down the garden and into place was heavy work – it took 4 friends and a lot of sweat but they (I was at work) finally got it in place. We chose to commission it ourselves and it wasn’t difficult to set it up and get it going. Again Arun was always on hand with advice. We are absolutely delighted with our tub and no, it is definitely not too big. We’ve had wonderful evenings gazing up at the stars, fantastic afternoons with our young grandchildren squealing with delight and social times with family and friends. Had the tub for over a year now, use it regularly, helps get a good night sleep after achy muscle days biking or office work. Nice design and has worked well. Online videos and manuals are a real help trying to figure out all the buttons ! Arun always gets back with advice , support so would recommend. 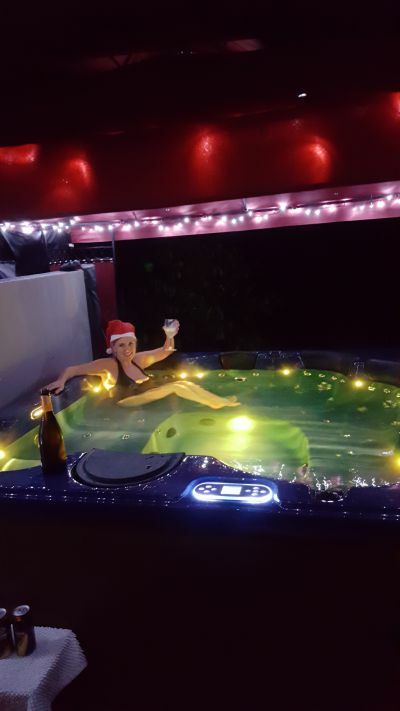 I called hot tub suppliers in October to order a hot tub for the Christmas and new year and also as a special surprise for my wife . 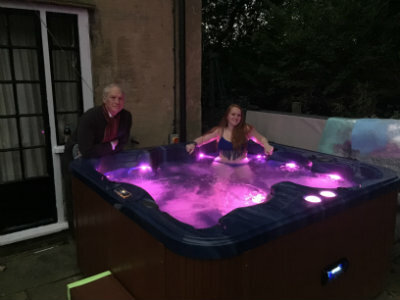 Hot tub suppliers were very helpful in helping me select the right model and colour and also tracked the order from manufacture to delivery so I was always aware where my order was. I even saw a video of the testing of the hot tub in the factory which was fantastic. 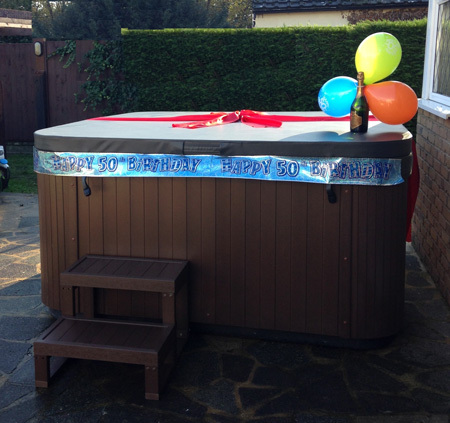 But also supplied 10 metres of 25cm wide ribbon so I could gift wrap the hot tub to add to the surprise ! 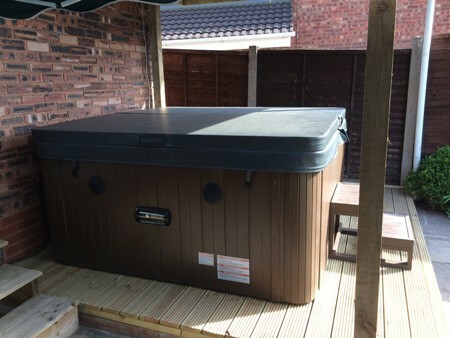 We would gladly recommend hottubsuppliers for anyone looking for a quality hot tub at sensible prices, thanks again ! Andrew & Charlotte ordered a Poseidon in pebble grey with a midnight grey cabinet. We were extremely pleased with the service that we received from this company. I have to say that they are fantastic with keeping in touch while waiting for delivery to installing and after care, there customer care is second to none and we have to give them the upmost credit. 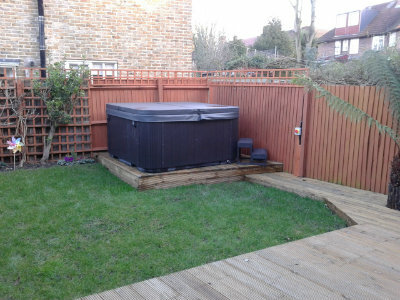 Just wanted to say a massive thank you for the service and after service you provided around the purchase of our hot tub. Family and friends really enjoying it. 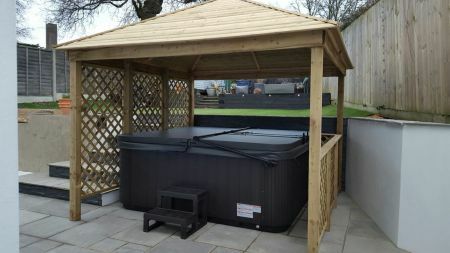 Mike ordered the Emporer hot tub in midnight grey with dark grey cabinet . Had all of my queries dealt with with no problems. Love the tub! The Hot Tub was easy to set up and excellent value for money. installed and find it very relaxing after a hard day. Jim ordered a Hera in mosaic blue with an oak cabinet. 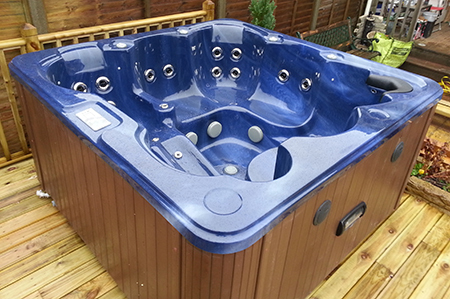 Chris ordered the Emperor hot tub in mosaic blue with oak surround. I can honestly say I have NEVER had such a friendly personal service from any company I have ever bought from. Arun was brilliant from start to finish. He was instantly available and attentive to everything! From working out how we were going to get it into my garden (no mean feat) to how to use the chemicals. Most companies would just sell you the hot tub and run off laughing to the bank! I have had the hot tub for months now and Arun still emails me to check all is well and reminds me to let him know if I have any problems. The hot tub is gorgeous. Easy to set up, run and clean, I love the strength of the jets. I also love the lights at night (and the wine glass sits perfectly on one and keeps changing colour. It's very girlie but I love this ;-)). All in all I cannot recommend enough. The level of customer service and quality is second to none. Cheryl ordered a Countesa Deluxe in pebble grey with a grey cabinet. 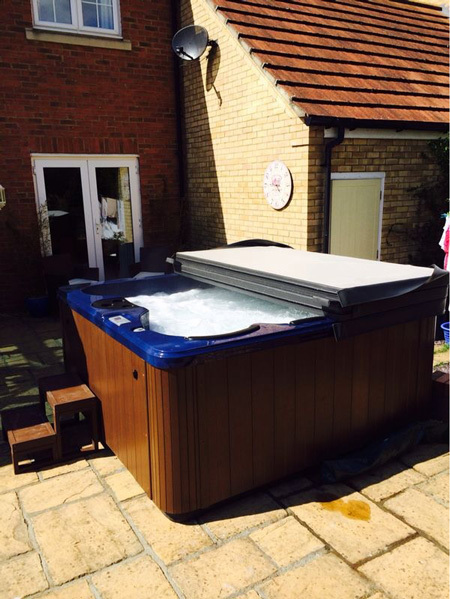 We love our hot tub so do our family and friends, Arun was so helpful and we had no problems when the tub was delivered it was very easy to set up and we knew that we could contact Arun if we had questions. 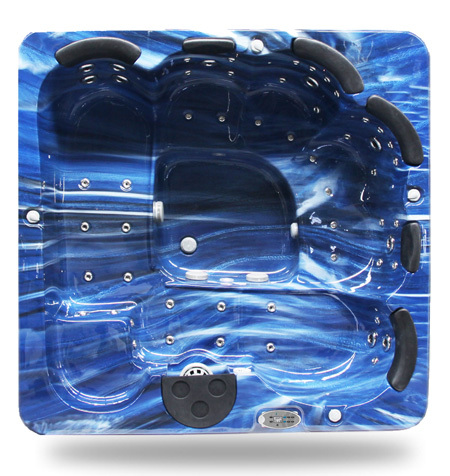 Mark ordered the Poseidon in mosaic blue with a oak surround. i have had mine for 3 years now and we love it and use it most days. I have only had to have a new heater changed (which was probably our fault for not having it serviced) anyway the engineer that replaced it asked how much we paid for it as he was soo impressed with the amount of pumps on it, and that he only has tubs with 1 pump for triple the price. Great price great helpful company A1. 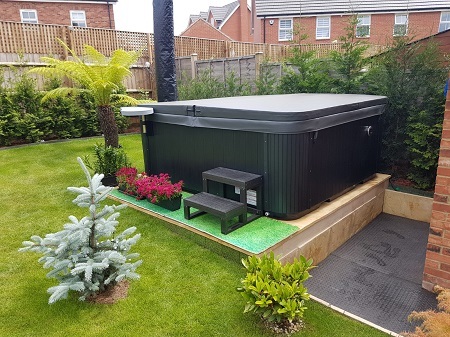 Not only did we get a fantastic hot tub but hot tub suppliers kept us informed on the delivery and progress of the order until it was delivered in time for the party. Brent ordered the Perseus Deluxe in pebble grey with midnight grey cabinet. Thanks again for the lovely hot tub!!! 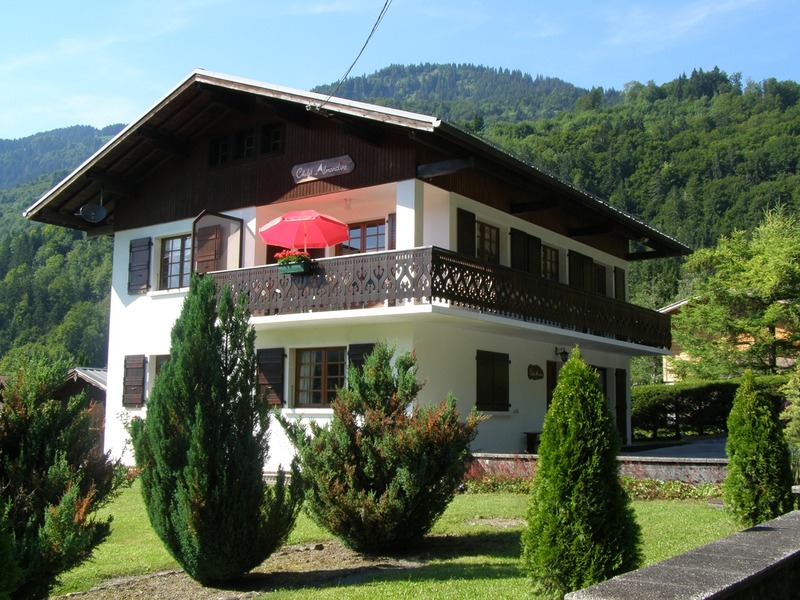 The Jay is a small family run farm in a peaceful and beautiful environment. It has six acres of pasture surrounding a 1.5 acre pool fed from natural springs. 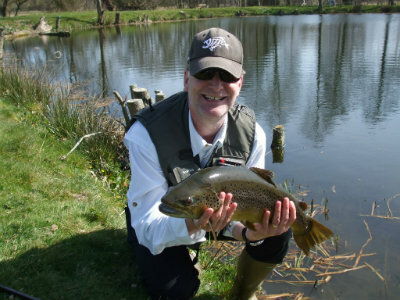 It has abundant plant, insect and animal life and is the perfect place to spend a few hours or even a few days fishing or simply enjoying the surrounding area with its many attractions. 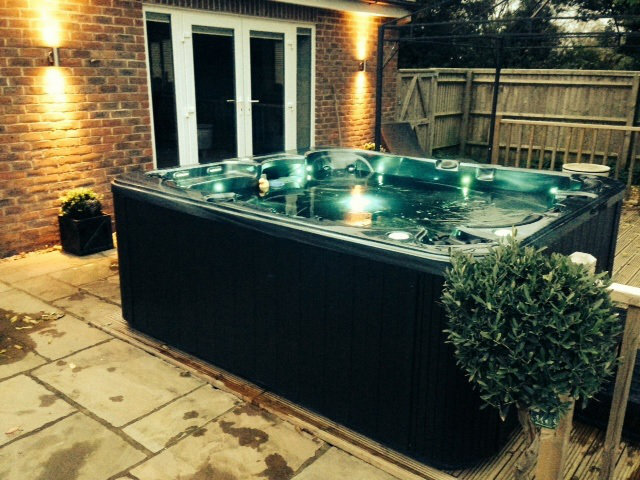 Really pleased with our Athena Deluxe hot tub. Was a bit sceptical at first but shouldn't have been, Arun was superb to deal with throughout and answered all queries promptly and honestly. I would, and already have, recommended Arun and his team to my friends. 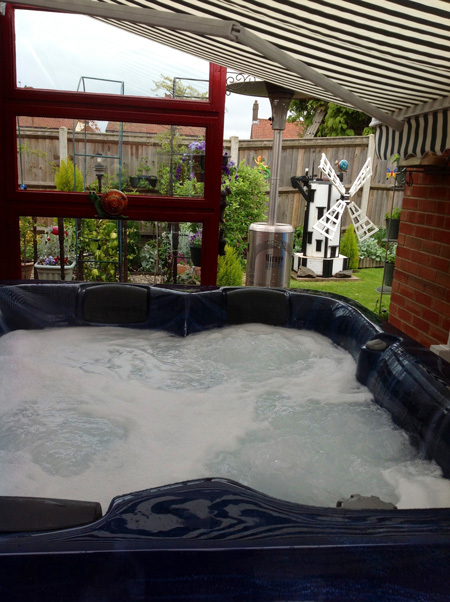 Love our hot tub and Arun still provides support and guidance 6 months on. Many thanks. I was in the tub at 5 this morning watching the sun rise over the woods with a brew. It’s nice to also see your lads who delivered the hot tub with a can do -will do attitude. Hot tub is great ! Arun and his team have been absolutely fantastic. Brilliant service and after sale support. I also thought the chemical pack was great value and very thorough. The tub is amazing - we use it an awful lot. 'I would highly recommend Hot Tub Suppliers. 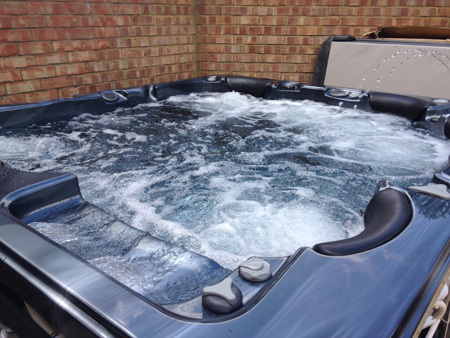 Not only do they offer great value for money, Arun at Hot Tub Suppliers is someone who truly understands the value of excellent customer service! 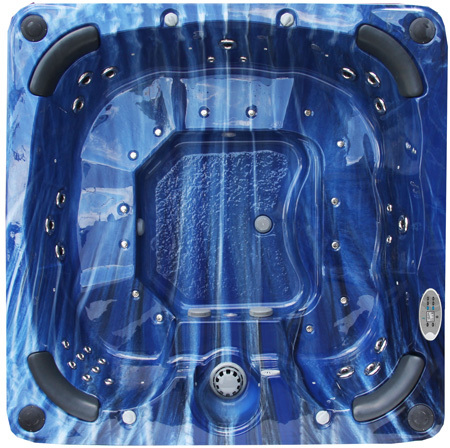 We found Hot Tub Suppliers through a web search and found their prices so much more affordable than the competitors. You'd think it would be too good to be true until you read all the fabulous testimonials from happy customers - that is what swung it for us and we were not disappointed. Arun is a friendly voice, always available to answer questions and he kept us to up to date from ordering to delivery. We needed a crane to get our hot tub in (check the width of your access is over a metre) and Arun managed to arrange that for us (even though we are in rural Fife), finding a local contractor and organising all the logistics. We had a very minor problem with our hot tub (faulty radio) but Arun got a new one sent to us within a few days. 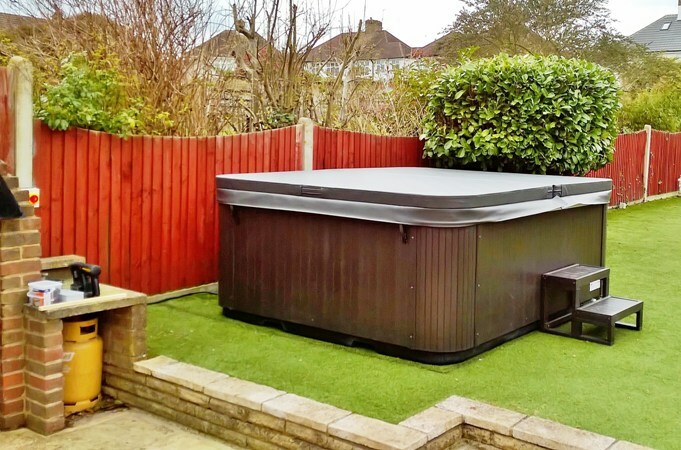 When you are making a big investment, you want to be confident its all going to work out ok and you can definitely trust Hot Tub Suppliers. We are really enjoying having the tub - especially the kids (as you can see).....and all the kid's friends! There is something special about escaping in the evening and relaxing, toasty in the tub, outside in the dark, once the kids are in bed and I can finally get a turn! 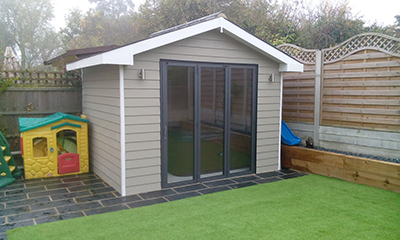 Carol ordered an Apollo Deluxe in pebble grey with a midnight grey cabinet. I'm really happy with the service and delivery. 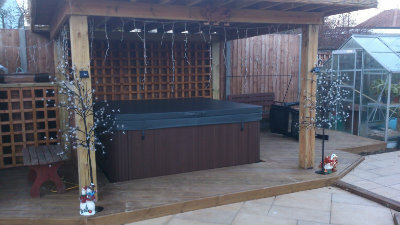 The spa is really easy to use and maintain and I'd definitely recommend Hottubsuppliers.com to anyone. Jim ordered a Perseus Deluxe in pebble grey with a midnight grey cabinet. 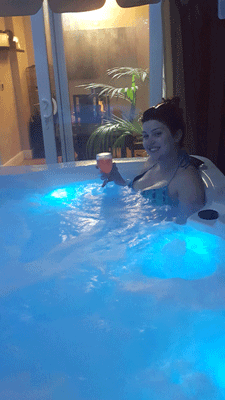 I am very please with my Zeus Deluxe hot tub, it looks fantastic & works like a dream. I also have to say that Arun was really helpful with the million questions we had to ask! I Would strongly recommend this company to anyone wanting a hot tub. 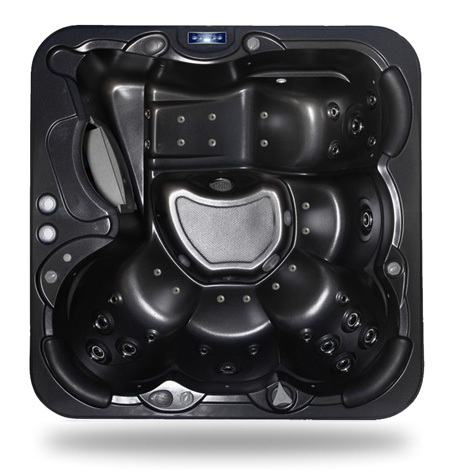 I approached Arun and his team not knowing alot about hot tubs other than knowing that I wanted one. 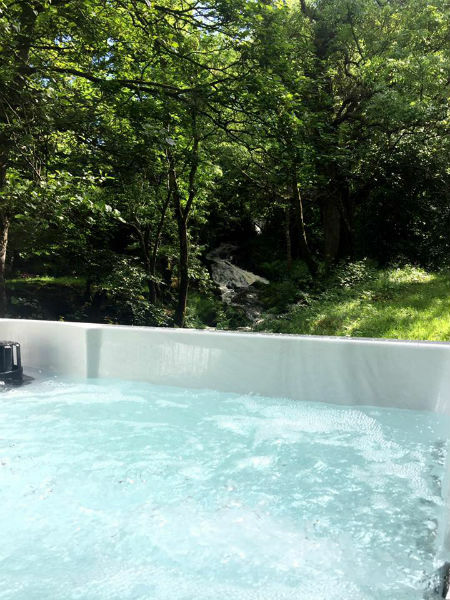 After the process I felt as though I knew all there was to know about hot tubs such was the support and guidance I received from Arun in particular. From the moment I spoke with Arun over the phone I could tell he wasn't a man focused on the 'hard sell' and allowed his product and its price to sell itself. All the same he was very forthcoming with details and information that helped shape rather than influence my decision with respect to the model I should go for. 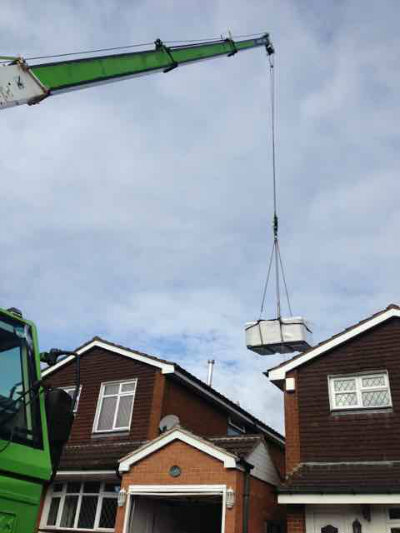 Not only that but Arun was only to willing to assist in organising a crane service to get the tub into its designated position as well as areas to look out for with respect to electrical supply and general installation pitfalls. Importantly post sale support was excellent with Arun on hand to promptly respond to my queries as I slowly came to grips with maintaining & using a hot tub. 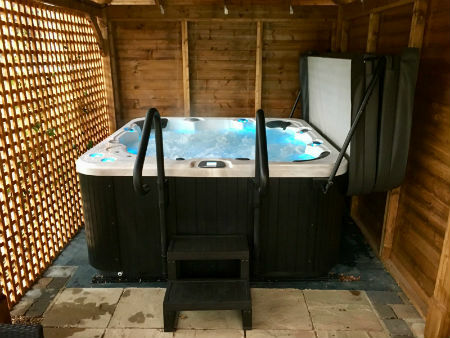 All in all I could not have been happier with the service provided end to end by Hot Tub Suppliers and have already recommended them to friends and acquaintances alike. Grey ordered the Countesa hot tub in pebble grey with the midnight grey cabinet. Exceptional hot tub. The best bye of 2015 . Have had lots of great days with family and friends in this very spacious hot tub. Would definitely recommend your company as we had a good rapour with you and nothing was any trouble . Being retired and enjoying lots of free time, we spent hours researching numerous hot tubs and suppliers County wide. 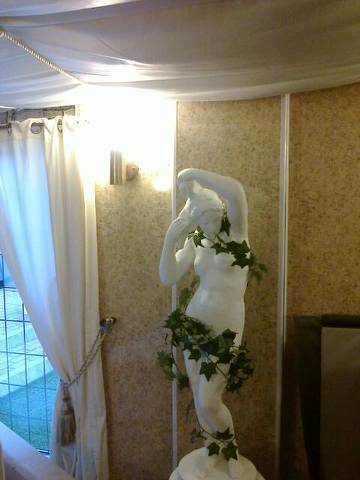 We eventually contacted Arun at Hot tub suppliers having agreed with him that the Countessa seemed to meet our requirements. Great decision everything went through really smoothly Arun was able to answer all our questions before and after the delivery. All the family are delighted and are keen to jump in as often as possible. 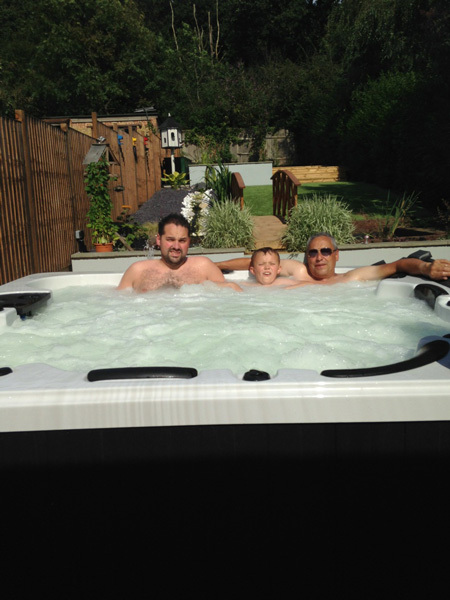 We are happy to recommend hot tub suppliers without hesitation and Thank Arun for all his help and patience. 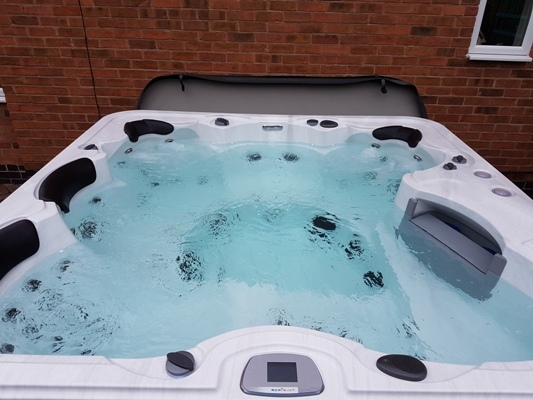 We bought the countesa just before Christmas, after speaking to Arun in November through to the hot tub being installed,we have received excellent service throughout. Arun is always on hand to answer any questions we have, and the after sales service is fantastic. 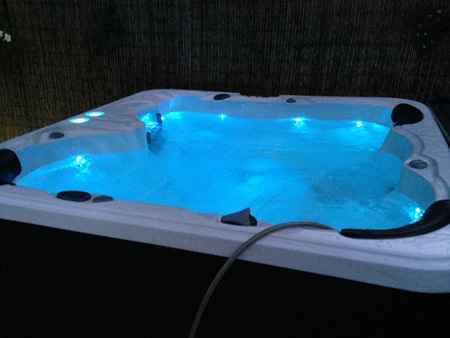 We would recommend hot tub suppliers as their prices are very competitive and the service is second to none. Love the hot tub starting to get a bit of good weather up here so making good use of it . 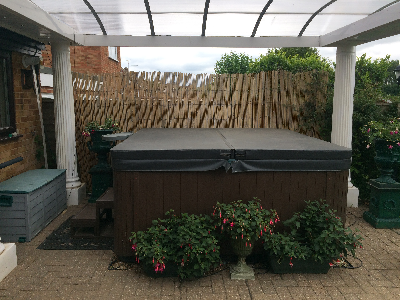 I purchased a Countesa Hot Tub from Hot Tub Suppliers in July 2015. It came with a complimentary cover and set of steps. 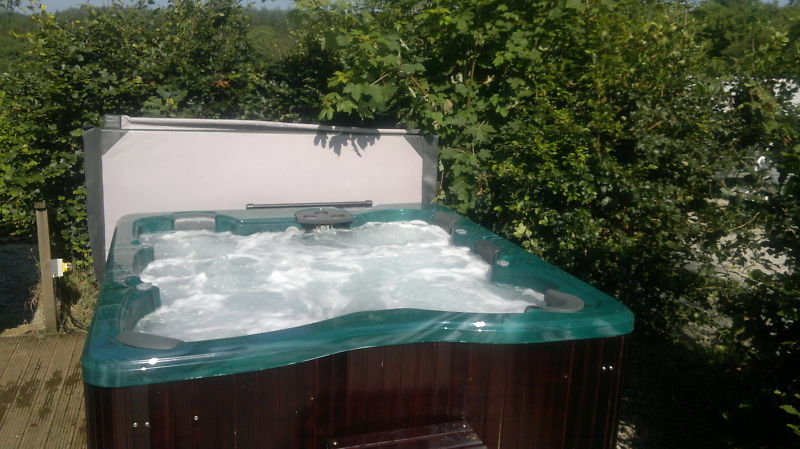 It is a great Hot tub and was half the price of a smaller Hot tub I had looked at from the Jacuzzi range. It has 4 seats and a lounger-which I use all the time as it has foot massage jets. 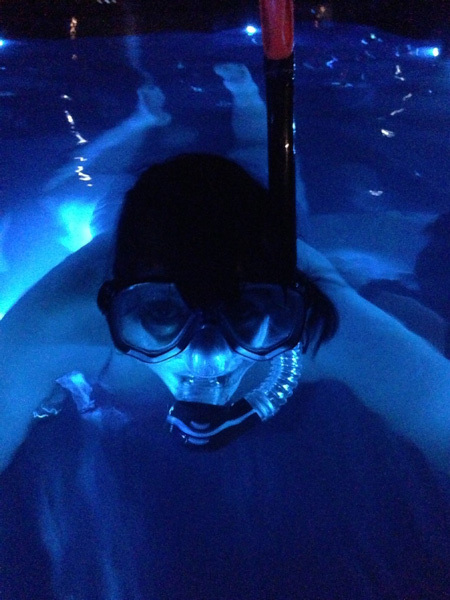 It also has great LED surround lights and underwater lights, which can flash and change colour. There is also a Bluetooth MP3 music system including a radio and loud speakers. I can even receive phone calls on my mobile, via the Hot Tub! 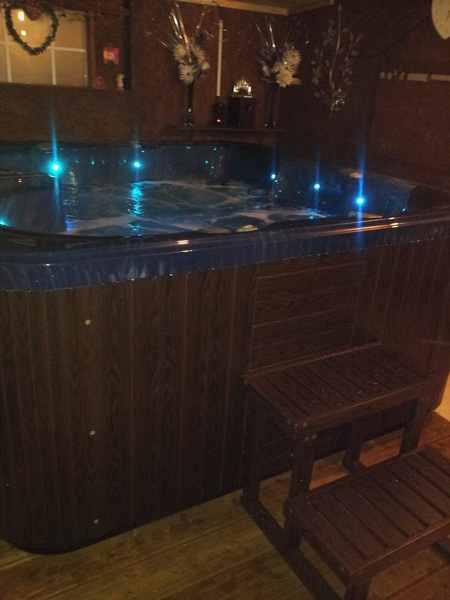 We have spent many hours enjoying ourselves in it and it is great for stiff muscles. We are a sporty family and often use it to relieve all our aches and pains. I have to say that I was very impressed with the great customer care provided by Arun. Support is offered as being available 24/7 and that is what I have found to be true. There are numerous video tutorials available on You Tube and if advice is still needed it is only a phone call away. I have bought a few hot tubs over the years so I know what makes a good hot tub and what is not. in the past I have paid up to £9000 for the Jacuzzi brand but this time I decided to shop around, and I was very glad I did . 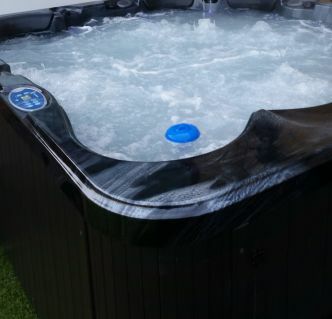 after extensive research I found hot tub suppliers and I saw from the details that the tubs were well made from a reliable and established brand and the costs were fantastic. 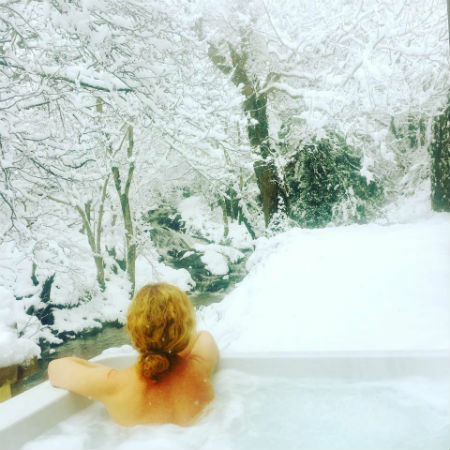 I called hot tub suppliers and immediately I was told about the availability and delivery and was also told that the fact that I lived on the Isle of Wight was not a problem at all. 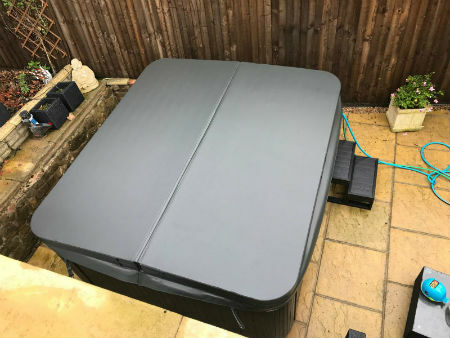 hot tub suppliers arranged delivery to Hampshire freight and within the space of 2 weeks from my first phone call, I have my new Countesa Balboa hot tub in my garden. I would have no hesitation in recommending hot tub suppliers to anyone looking for a quality product and service & a very reasonable price. Dean ordered a Countesa in pebble grey with a grey cabinet. From start to finish the team at Hot Tub Suppliers were great, always there for questions and support.. The hot tub is one of the best buys we've made. Really easy to set up and use and so relaxing. Mandy ordered the Zeus in mosaic blue with a oak cabinet. 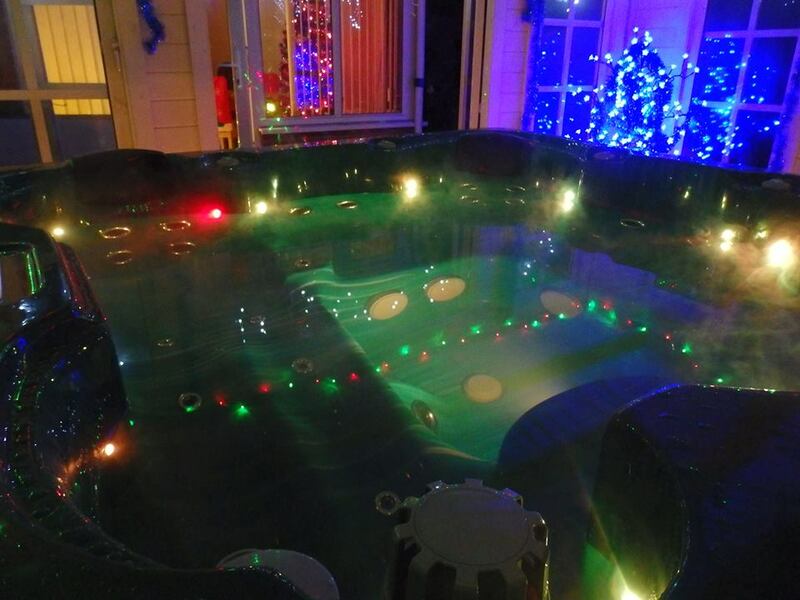 We spent around 6 months researching hot tubs, having only previously had the inflatable type. We got fed up with these cheap alternatives breaking down and ultimately we worked out we had spent almost as much on them as a proper spa ! 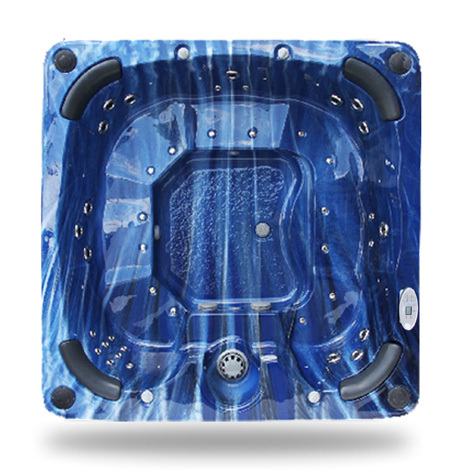 We found that we kept coming back to Hot Tub Suppliers as they seemed to offer the best price with many of the same features as other companies who charged a lot more. We visited the warehouse on 2 occasions to see the spa’s in the flesh, Arun was very helpful (and patient with all our questions). We decided to take the plunge and ordered the Athena model in blue. Right through the process from tentative enquiries to delivery, Arun was in touch, always available and made us feel confident that everything would go to plan. Arun had even arranged for a crane to get the hot tub in place. That was back in September, since then we have been in the spa every day with only a couple of exceptions (we went away for the weekend!). The spa runs in an economy mode for most of the time, so even as write in December, its only heating the water for around 4-5 hours a day. 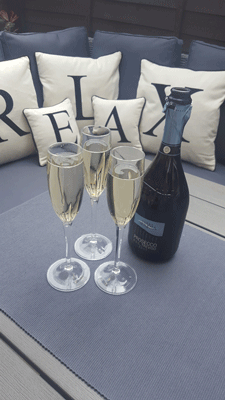 There is nothing better after work than a glass of fizz and a relaxing hydro massage. 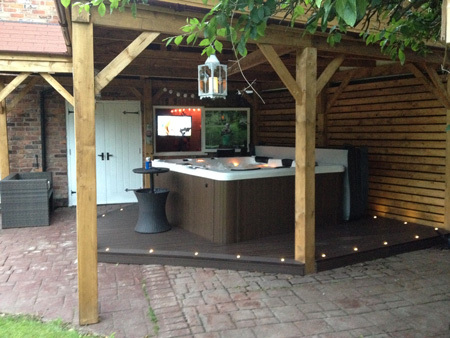 So to sum up, we are really pleased with the Spa, it works great and feels well made. We were really happy with the customer service, faultless, and the price was very competitive. Perfect. 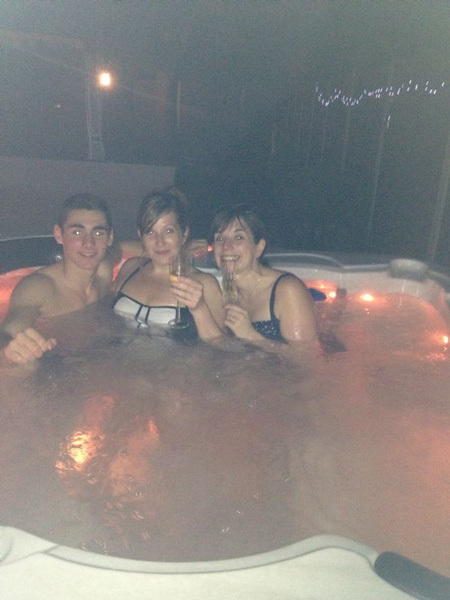 Would happily recommend Hot Tub Suppliers to our family & friends. 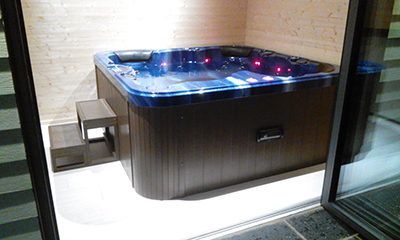 Robert & Glynis ordered the Athena Deluxe hot tub in mosaic blue with oak cabinet. Excellent service from enquiry through to delivery and also to a minor repair. The hot tub is a great addition to our family life. No regrets. We are lucky enough to have our own tropical paradise day or night, summer or winter. 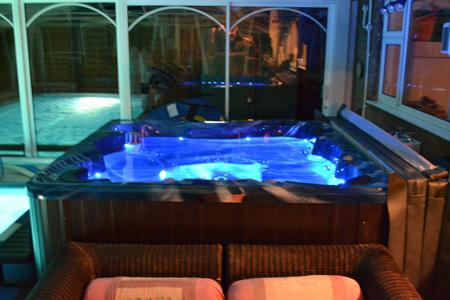 We are loving spoiling our friends and family with the delights of our new Poseidon hot tub. Unfortunately Alex has not been able to sample it as his leg is still in plaster!! Alex & Barbara ordered a Poseidon in pebble grey with a grey cabinet. 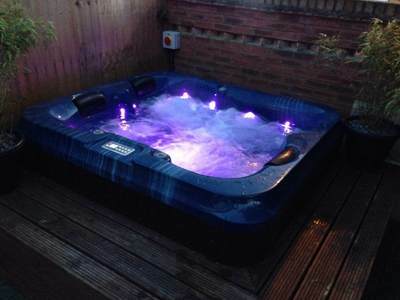 Would recommend Hot Tub Suppliers to anyone interested in buying a hot tub. Arun truly understands what good customer service is so do not be concerned about buying on line, the prices are extremely competitive and you will not be disappointed with your purchase! There is no reason to look anywhere else! I'd like to let people know what fabulous customer service you get from Hot Tub Suppliers, particularly Arun. We bought a hot tub about 18 months ago from Hot Tub Suppliers and had a fantastic service at that point. We have now had reason to contact Arun to ask for some help and not only did he remember us from our original purchase but he also helped us with our needs and we got a next day service and Arun's wonderful customer service. 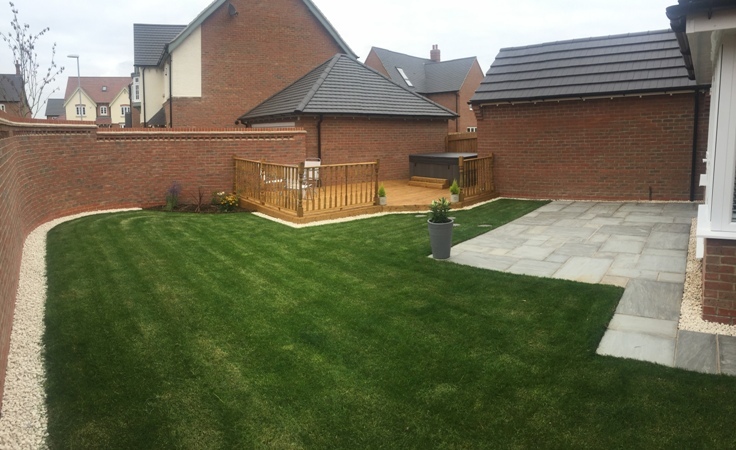 I have to say that I was originally very pleased with the service that we received but to contact them again 18 months later and to be remembered and helped again with the same excellent service was fantastic, yet again! I can highly recommend this company and Arun to anyone and would be happy for anyone to contact me if they wanted any information on our service. Trish & Mike ordered the Apollo hot tub in mosaic blue. Purchased a hera hot tub from hot tub suppliers in 2013. Very impressed with the quality and value for money. The service was excellent from start to finish. We have had no problems with the tub and we are really enjoying it. Would highly recommend this company to anyone thinking of buying a hot tub and would definitely use them again when we upgrade. Excellent and professional. Well done. 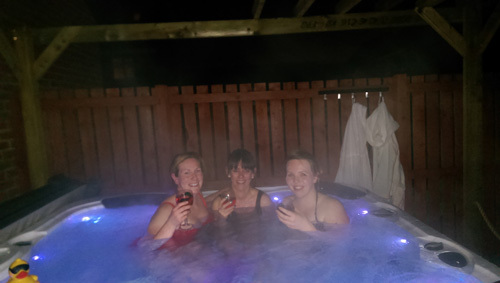 We are loving the hot tub were in it every day it is so relaxing can't thank you enough for the excellent service. Barbara ordered an Athena Deluxe in pebble grey with a grey cabinet. Just a quick word to say how thrilled we have been with our Possideon Hot Tub. From the very first enquiry in Feb 2015 to the delivery and placement we received helpful, polite, prompt and very efficient service. All our queries answered fully and speedily and now we enjoy relaxing and wondering why we did not buy one before! It is now November 2015 and we have been so impressed that we recommended your company to our friends and we understand they are pleased too. Many thanks from a very satisfied customer. I believe we all order items and are disappointed when they arrive. I ordered my Pontus delux hot tub and expected it to meet my needs and expectations. The tub arrived and I had it installed and am delighted to say my expectations were exceeded. 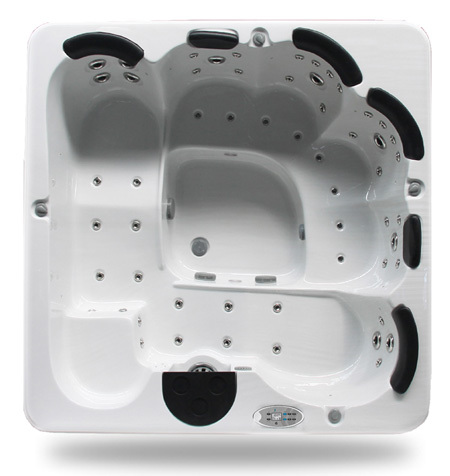 The built quality is first class and the operation of the tub is fantastic. I did a lot of checking before eventually ordering and found that hottubsuppliiers.com appeared so much better value than other suppliers. I would have no hesitation is recommending them. I am a very happy customer. I would like to thank the team from Hot Tub Suppliers. From our first enquiry to delivery the communication and help was second to none . 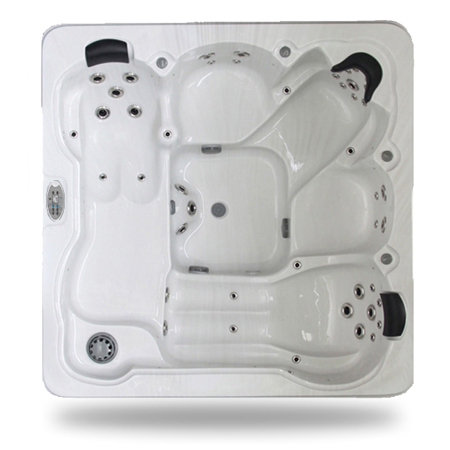 The quality of our Hot Tub the Perseus Deluxe is amazing and we love it. We would definitely highly recommend this company they are friendly and very very helpful . 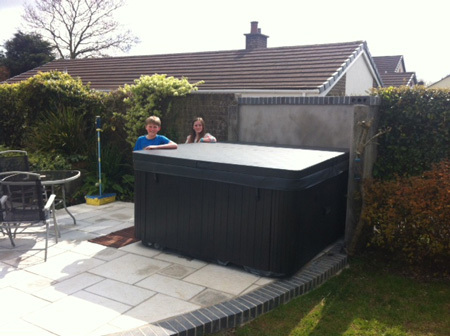 Martin & Louise ordered the Perseus Deluxe Hot tub in pebble grey with midnight grey cabinet. A really friendly company to deal with. We asked a lot of questions about installation before making a purchase and these were all efficiently responded to. Delivery and installation were arranged by the company and was basically a hassle-free experience. 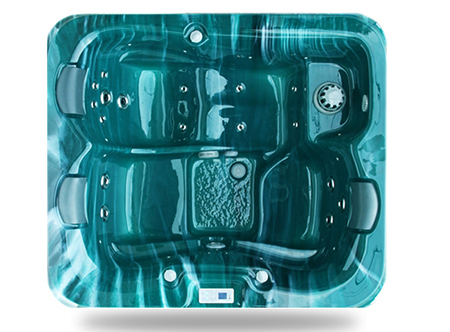 We are thoroughly enjoying our Poseidon hot tub and would have no hesitation in recommending Hot Tub Suppliers. they even supplied red ribbon to help with the presentation ! We managed to give Michael and fantastic gift without his knowledge and he was immensely happy, thanks again to hot tub suppliers for their help with this. We're making great use of the tub, and as a family, enjoying the time we spend together using the tub. It's amazing the conversations we get out of the kids when there are no distractions. As the tub was setup in April, we're all looking forward to the coming cold frosty nights of winter - thats going to feel very special. Peter & Bev purchased the Perseus Deluxe build your own so they customised the colour to choose a mosaic blue shell with a steel grey cabinet. Excellent product and great service, money well spent, we use the tub 4 or 5 times a week, cheaper than visiting a health spa!!!! 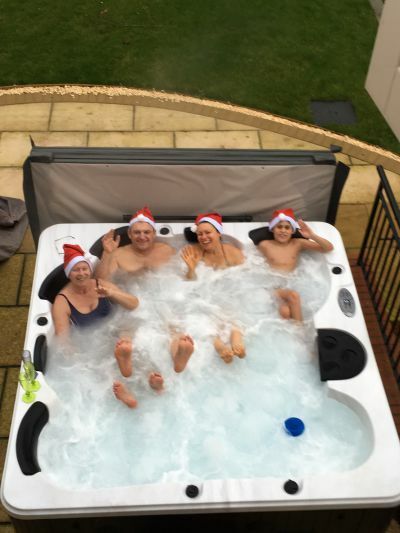 "Purchased Hot tub from HOTTUBSUPPLIERS last Christmas. From initial advice, installing and maintenance their service has been faultless. Any minor issues have been dealt with very quickly, without quibble or fuss. Really excellent service. Would recommend them to anyone. Price great too! Happy customer Gamston, Nottingham. " 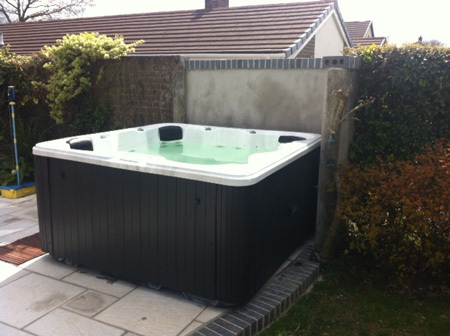 Rupert & Alison ordered the Countesa Hot Tub in pebble grey with dark grey surround. Happy to share these with you and your customers. One of the best purchases we ever made. 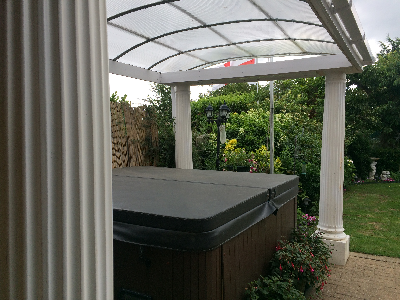 From start to finish to aftercare, service was absolutely first class, Arun went above and beyond my expectations and made the process of buying my hot tub enjoyable and exciting. 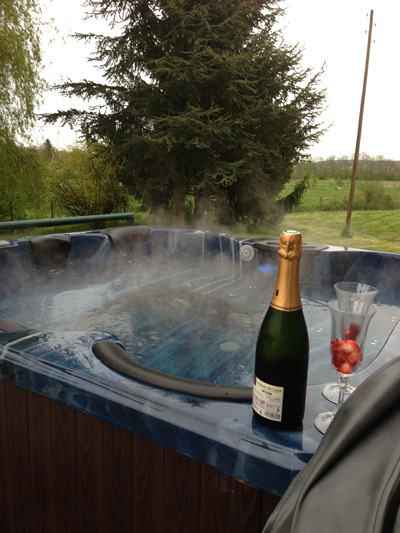 I can highly recommend hottubsuppliers without any reservations! Thank you so much!
" 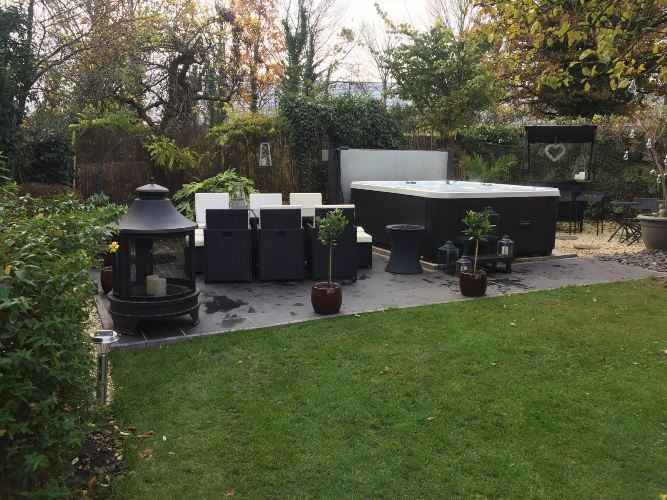 we wanted a hot tub for our property in France so we wanted a company with a strong reputation as we wanted support if there was any problems, we studied hot tub suppliers and more notably the Zspas brand and we was therefore confident we was dealing with a good respectable brand . 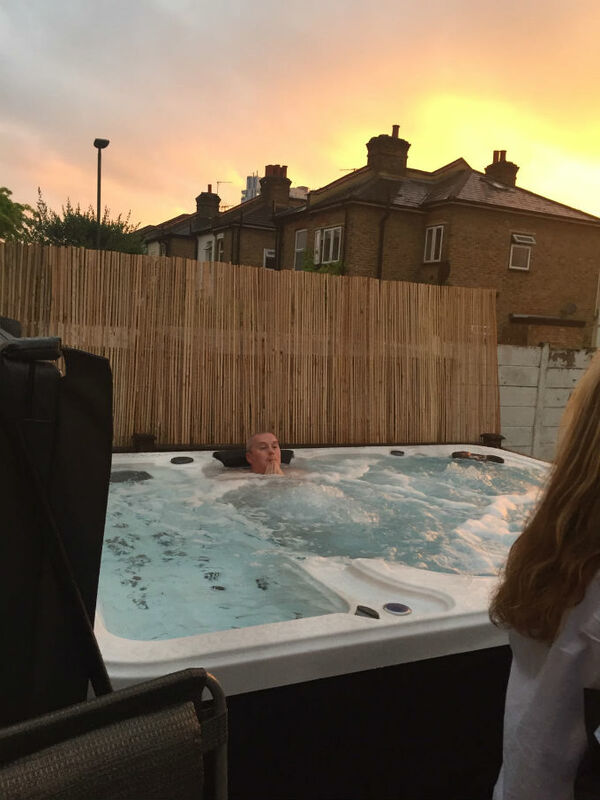 After a few months, the hot tub developed a problem with the heater , when i spoke to hot tub suppliers they acted immediately and between the uk office and the Zspas office and myself we fixed the problem with active communication and support. 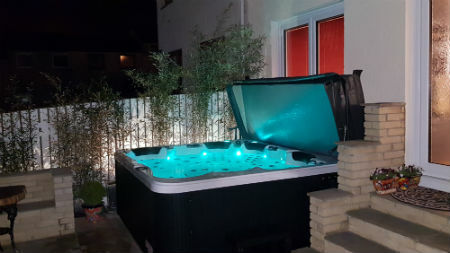 They sent parts to my home in France which was not cheap but their only objective was to fix the error and ensure we continue with the enjoyment of the hot tub. Soon enough the problem was solved and we continued with the enjoyment of the hot tub . 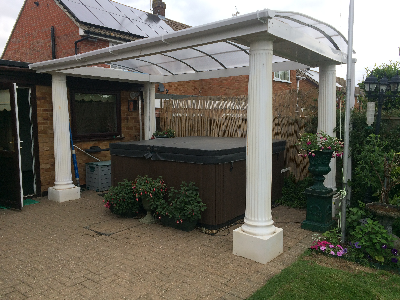 Sometimes you only see how good a company is when there is a problem, and therefore i have no hesitation to recommend hot tub suppliers and Zspas for their excellent product and also customer service and support ." Davina ordered a Perseus Deluxe in mosaic blue with an oak cabinet. Good product, great service and great price! 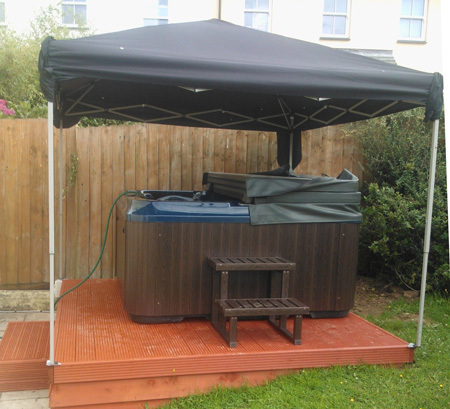 Hot tub suppliers provided an excellent service, kept in regular contact and helped us with the most difficult placement problem. We overcame that and have now been in our hot tub for 2 weeks. Its really fun play time with the kids and completely relaxing without them. We like nothing better than relaxing music, soothing lighting and de-stressing in the tub after a hard day at work. I would recommend hot tub suppliers to all. Kirsty & Brian ordered an Athena Deluxe in atlantis green with an oak cabinet. We Bought a Hot Tub 2 years ago and its still like new excellent quality. 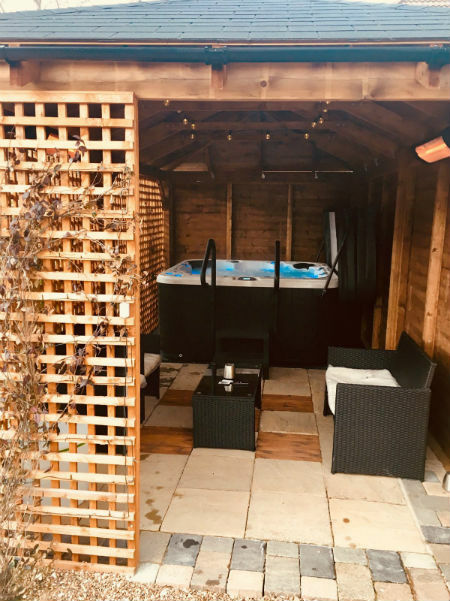 As with many Hot Tubs there are so many to choose from so back when I was looking I rang Arun up (the owner) and we chatted on the phone for well over an hour time was nothing to him he was asking all sorts of questions to make sure I had the hot tub suited to me and my family. 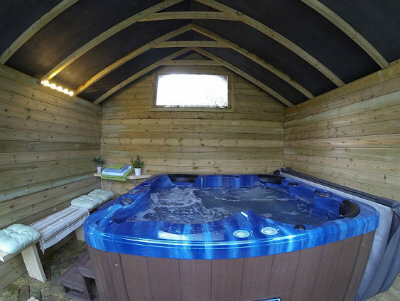 He advised me of all the cost involved and made sure the hot tub would fit, when I finished on the phone I felt like I had known him for years , even the people who delivered the hot are so polite and caring they kept me informed to when they were going to deliver and even down to the last hour . Hot Tub Suppliers are the best around a cant speak more highly of them they are a company who really do care about there customers . 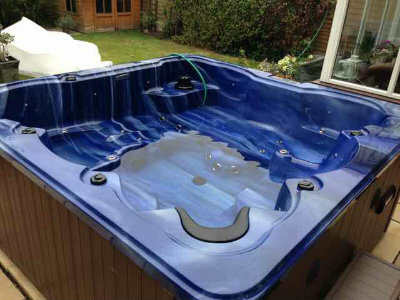 I have recently purchased a Zeus 2/3 person Hot Tub from Hot Tub Suppliers of Leicester. I did quite a bit of research on the internet before I decided to buy. This company was the only one that sold the 2/3 person Hot Tub that I was looking for. 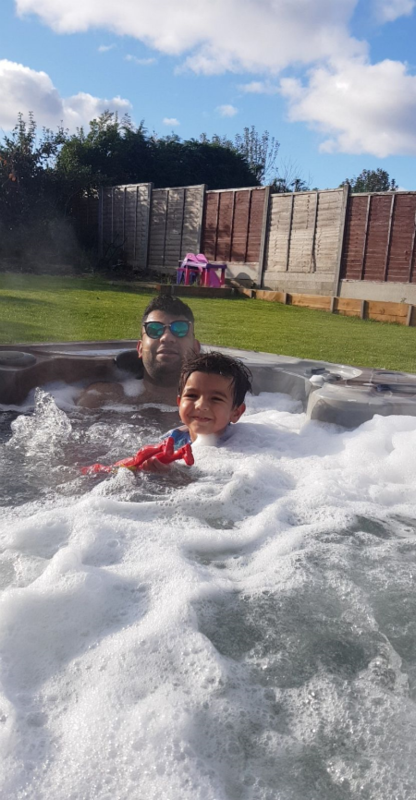 I wanted to speak to someone in person before making a decision so I arranged a meeting with Arun, from Hot Tub Suppliers, in Leicester.I live in Middlesborough so I booked an overnight stay with my wife and Grandson. We met Arun who was happy to assist in any way he could. 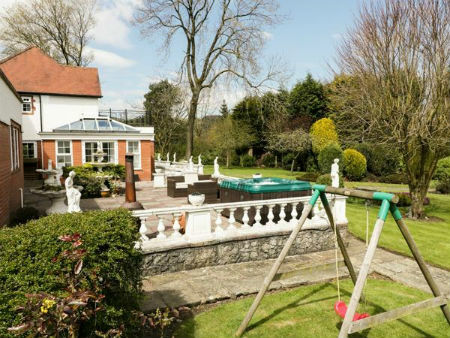 We had a lengthy conversation and discovered that the only problem I had was how to get the Hot Tub into our garden, as the gate was not wide enough. The following day, I received two phone calls from local crane companies, sourced and arranged by Arun, who made appointments to come to my home to view the access to the garden. Within the next couple of days I had ordered the Hot Tub and booked a crane to lift it into the garden, keeping in touch with Arun at each stage. Everything went according to plan. 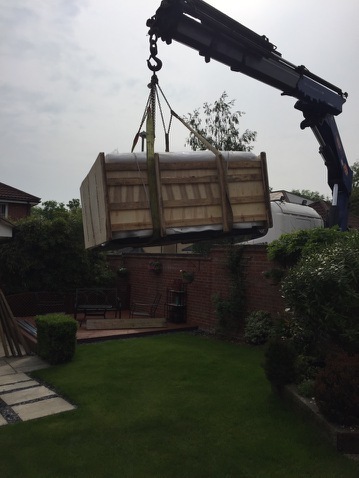 The delivery drivers and Tim from the crane company were very professional.The Hot Tub was delivered along our drive and was lifted over the garage into the garden by the crane company. Arun was great even after the delivery as I had a number of questions about the workings of the Hot Tub. Arun was happy to talk me through the queries. 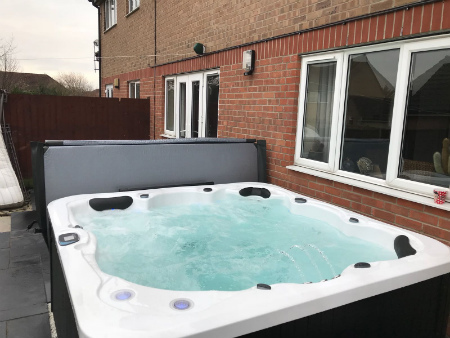 I am extremely happy with my purchase and would definitely recommend Hot Tub Suppliers of Leicester to anyone thinking of purchasing a Hot Tub. Mark ordered a Zeus in mosaic blue with an oak cabinet. 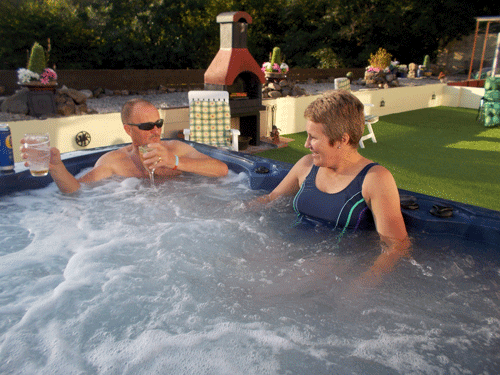 The hot tub is great and is a huge hit with the holidaymakers. I am so tempted to put another one in my smaller cottage as it does make a difference to the bookings. 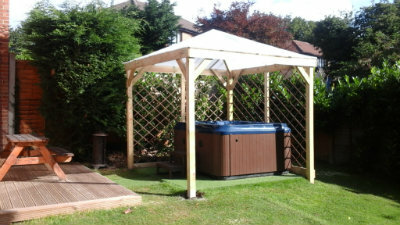 www.underthethatch.co.uk or call on 01570481423 or 0752837473. Eleri ordered a Countesa in pebble grey with a grey cabinet. 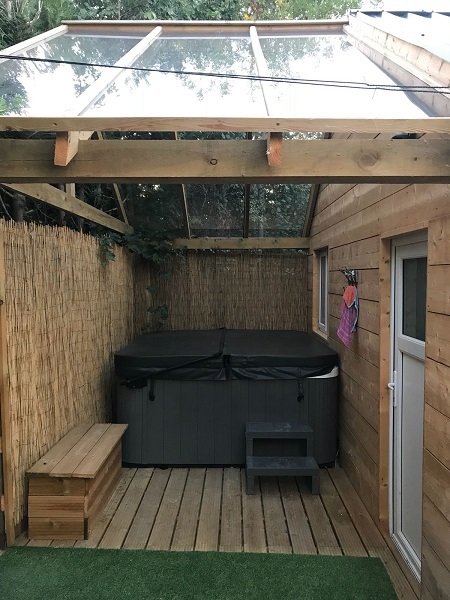 Arun and his team at hot tub supplies were brilliant, I had a summer house delivered on the same day as the hot tub and there was a crash on the motorway so I was really stressed out, but the delivery team were brilliant! They saw that there was a crash and took a different route! When they arrived the three sides to the summer house were already erected! 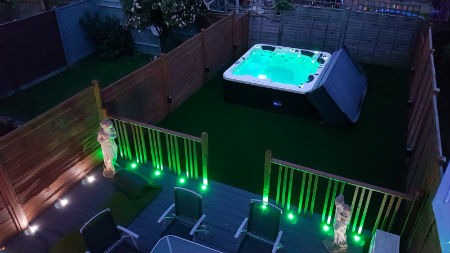 It looks amazing and the hot tub is just fantastic we took delivery of it in February and it's the best thing I have ever! Invested in and we are in it all the time and no the running costs are not high at all! 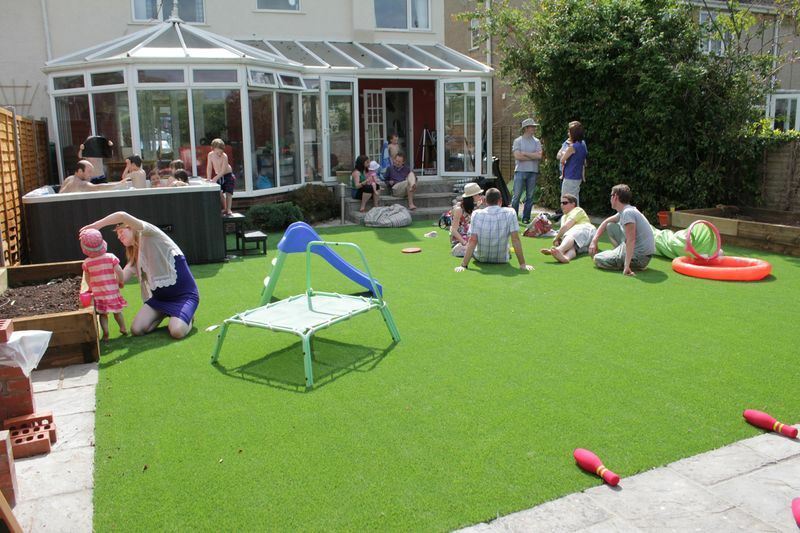 The whole family loves it, it been a very busy house with all of the kids sleepovers we have had! 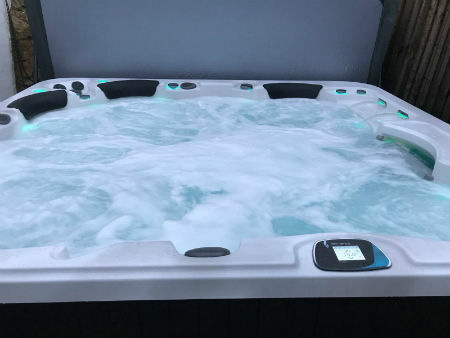 It's easy to clean and very easy to run, am really impressed with price a quality of the hot tub it does everything we need. I would lightly recommend hot tub supplies as they are professional at every level from choosing the right one to getting it installed everything was right on! I still call Arun from time to time. 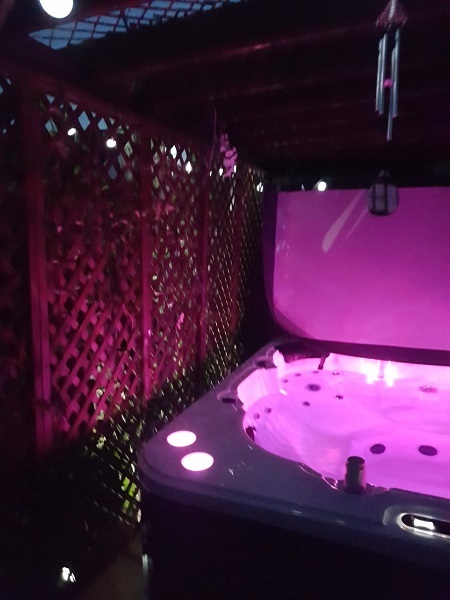 When we had the nice weather (yes I know not a lot in the UK) I decided to get my garden done and treat myself to a hot tub. Looked online and in various garden centres and for a 6 seater a lot of the prices were in the £8K upwards price bracket which was way above my price range. 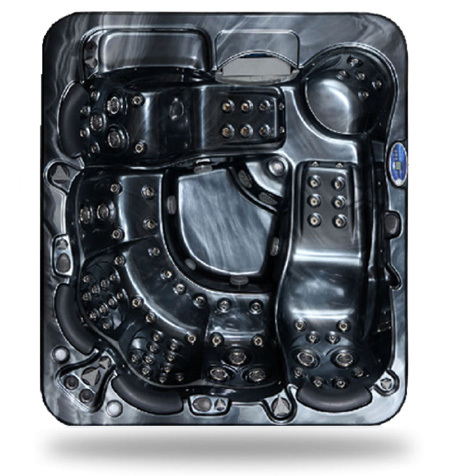 Just as I was about to give up I came across Zspas when I did a general search for hot tubs. I found a 6 seater one for a fraction of the price - £3500, I though it was too good to be true but gave them a ring.The guy I spoke to Arun was really helpful and let me know which they had in stock and could delivery for when I wanted etc. There was no hard sell or anything and he was really accommodating when I had to keep changing my delivery date as the garden wasn't finished. I didn't have to pay the balance until I was ready to have it delivered which I thought was really good.There was a small hiccup with the delivery as the delivery men said they couldn't get in into my back garden down the side passage but this was partly my fault as I hadn't measured the width properly. 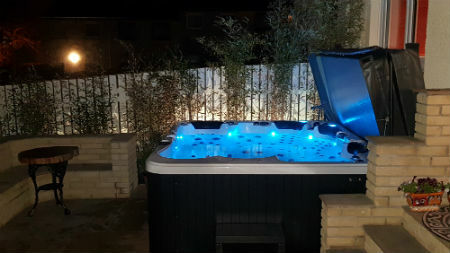 As soon as I spoke to Arun to explain we had managed to get the hot tub in ourselves, there was no quibbles or anything he offered straight away to refund the £100 delivery charge. The delivery men aren't Zspa people and are sub contracted so this didn't tarnish my opinion on Zspa in the slightest. Arun even send me some replacement bits that had been damaged when me and my friends man handled the hot tub into the garden.I had definitely under estimated how heavy the hot tub would be as it was a really sturdy frame and definitely feels well built. Be sure to measure the width of your entrance to the place it is going as they are bigger than you think. Neil ordered an Perseus Deluxe in mosaic blue with an oak cabinet. 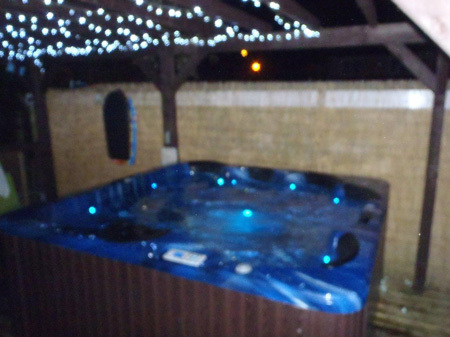 Excelent service, cannot fault, any questions are happily answered, no problem is too big, would recomend to any one looking to buy a quality hot tub we have had hours of fun in ours, the best treet we could have bought ourselves. Well to Arun and his team. and got next day delivery,very pleased with Nigel the crane man, looking forward to relaxing in the Tub. Val & Steve ordered a Pontus Deluxe in pebble grey with a grey cabinet. Wow bought our Countessa in January 2015 it is simple to use and gives excellent service we have been in more expensive units and see no noticeable differences. Arun gave us a great customer experience the aftercare has been brilliant. 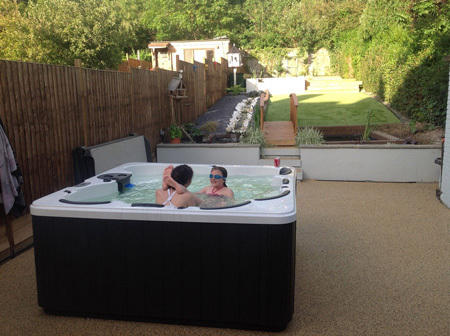 We would highly recommend the hot tub suppliers to anyone considering buying a hottub. Sam ordered a Pontus Deluxe in mosaic blue with an oak cabinet. 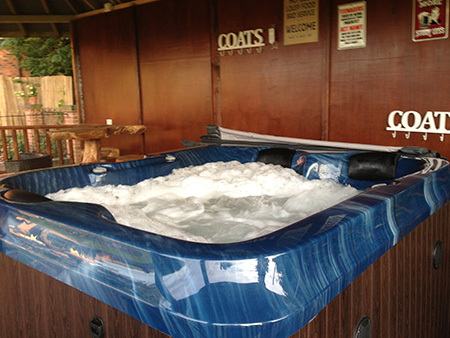 A fantastic quality hot tub & great service plus a great price! 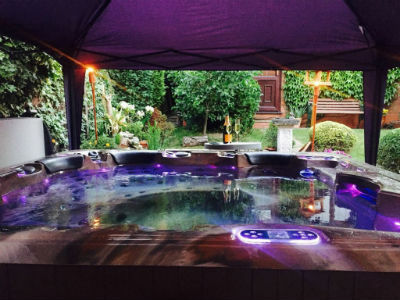 If you need a luxury hot tub, I strongly recommend hottubsuppliers. Ashley ordered an Apollo Deluxe in mosaic blue with an oak cabinet. Embarking on our first, and only, property renovation was a daunting prospect and, as it was to be our ‘forever home’, there were a few extra touches which we thought it would be lovely to have. We could scarcely believe that we could get exactly what we wanted for less than half the price we had seen locally. Not only that, but for only a few extra pounds the tub would be delivered and put in place for us. Amazing. Naturally, there was an element of trepidation purchasing such a high value item online and from a company over 200 miles away from us, but we needn’t have worried as Arun was always available to talk to us and answered all our questions patiently and diligently. Nothing was too much trouble. 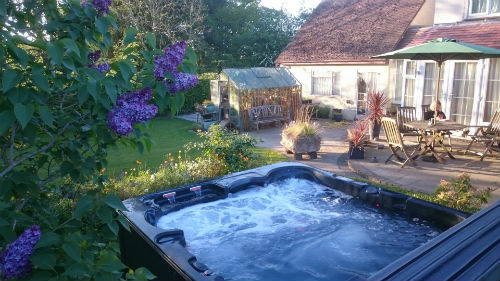 Now that the summer weather is upon us, the hot tub is just the most fabulous thing to have and we are the envy of all of our neighbours. It is also fair to say that my suntan is already he best I have ever had. We cannot recommend hottubsuppiers.com highly enough. The ZSPAS products are fantastic, and incredible value for money, and the customer service from Arun and his team is second to none. Simon & Tracy ordered a Perseus Deluxe in mosaic blue with a grey cabinet. 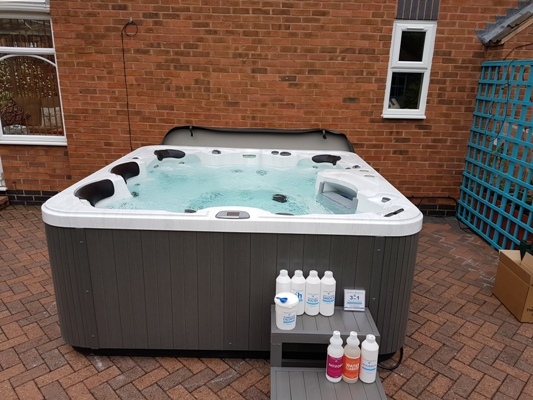 After engaging with many different suppliers, face to face, and from the internet, I found the understanding of my needs, service delivery and after sales service from Hottubsupplies was first class. In addition, the price I paid was well within budget, and the product is excellent. 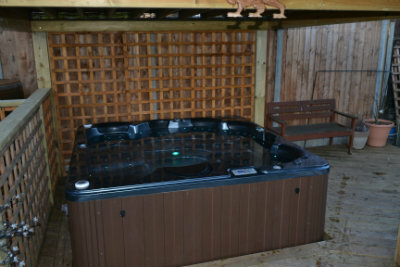 A few photos too of the beautiful hot tub that has been used everyday since we have had it. Thank you for such great service on all parts fantastic and I'm so gonna recommend you to all of Essex! Susan & Steve ordered a Countesa in pebble grey with a grey cabinet. Arun was very helpful from the start to finish of our purchase. 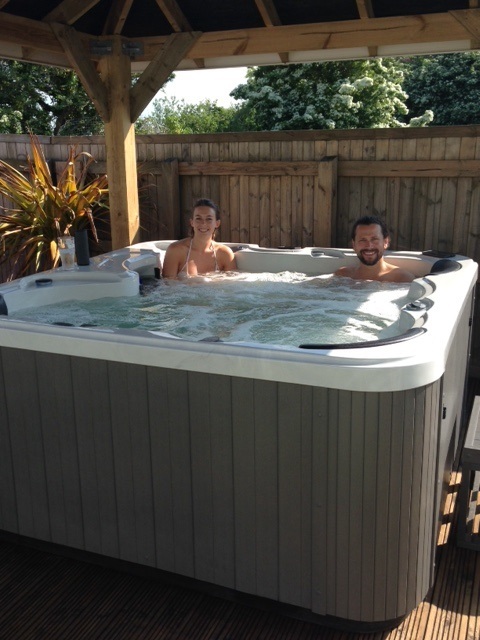 We love out hot tub and often say it's one of the best things we have ever bought! 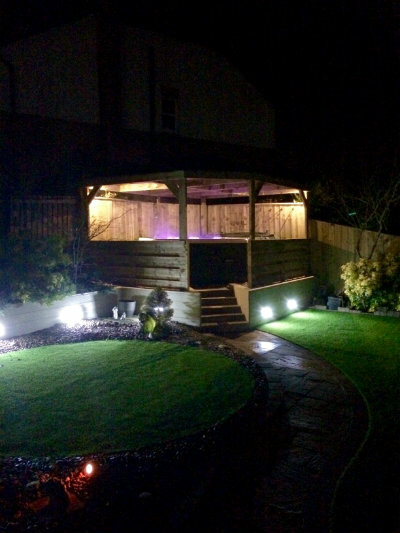 We use it all the time, and loved it during the summer but we equally enjoy sitting outside under the stars on long, dark evenings. 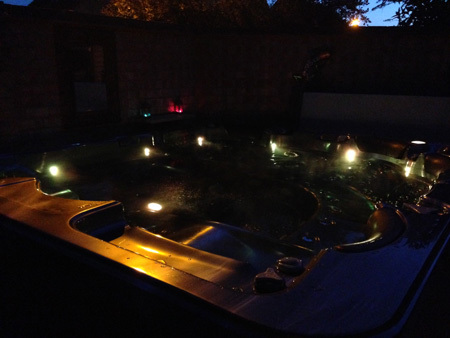 If you are considering a hot tub I would definitely recommend Hot Tub Suppliers, go for it, you won't regret it! K & P, Broughton Astley, Leicester. Here are a few pictures but I will be taking more. Just wanted to say thank you for the amazing hot tub. I still can't believe it is here. I found you and the team so easy to deal with and am so happy with our new emperor hot tub. It only took a couple of hours to fill and now it's heated and at the right level..... Which was also easy we shall be using it every day. 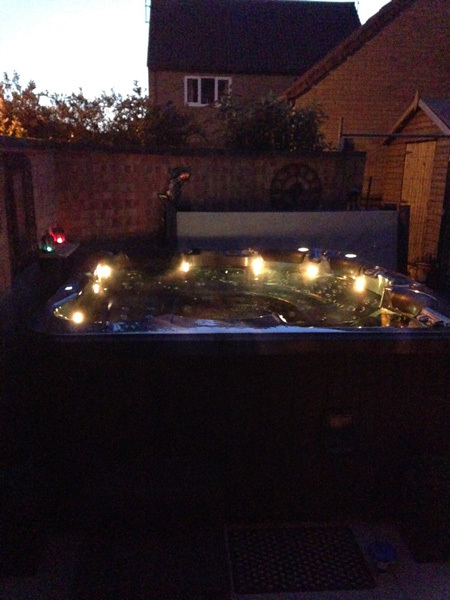 Last night we had the lights on and sat under the stars in the hot tub and relaxed. I will be recommending you to everybody. Great service and amazing product. Many thanks again and will send more pictures and a video if required. Natasha & Simon ordered an Emperor in midnight grey with an oak cabinet. 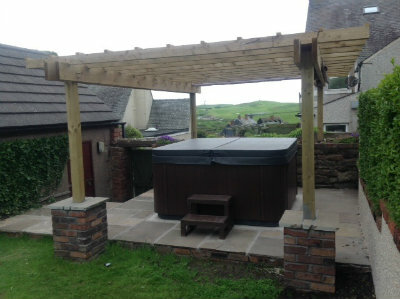 However my project was not just a delivery of a hot tub, I needed the electrics to be arranged , I needed a crane to lift the hot tub into my garden , we also wanted an installation .. .and I needed all to be completed to a time scale so we could reap the benefits of our new investment at the earliest opportunity. I discussed my needs with hot tub suppliers and together we managed to arrange it all together , we had constant dialogue and the work was both transparent and efficient . I knew the status situation at all times which was great and the dates we wanted for delivery were all kept . 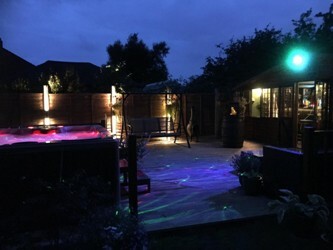 The hot tub is amazing and the family love it and the service is 2nd to none , I'm very happy to recommend hot tub suppliers to anyone looking for a quality hot tub and fantastic service . Peter ordered a Perseus Deluxe in mosaic blue with an oak cabinet. Very helpful and friendly staff. Good product. Not top of the range, but exceptional value for money. For personal use, rather than commercial, just what one would want. We have had ours for a year, used regularly, and there have been no problems so far, but plenty of enjoyment. Definitely would recommend. 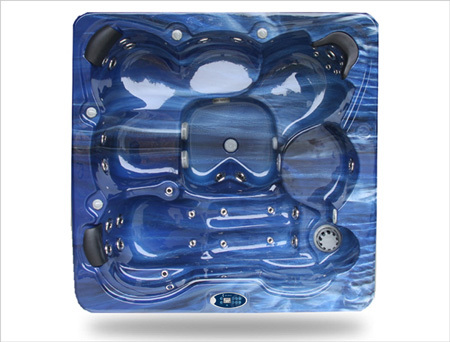 I was looking for a luxury hot tub to match the surroundings of my property and contacted hottubsuppliers about the Perseus Deluxe model. 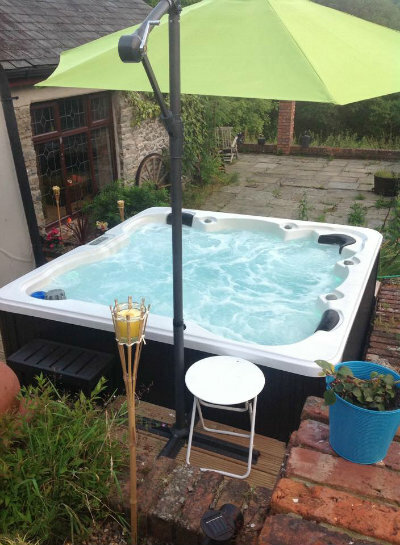 Hot tub suppliers helped on my enquiry with precise knowledge of the hot tub & also advice on how to prepare for hot tubs and what base and power is required . As i wanted my property to be of the highest order this was advice i needed and was very grateful for. hot tub suppliers arranged delivery plus a hot tub installation which even though I'm based on the isle of Wight and this involved a ferry crossing, was not a problem for them to organise. 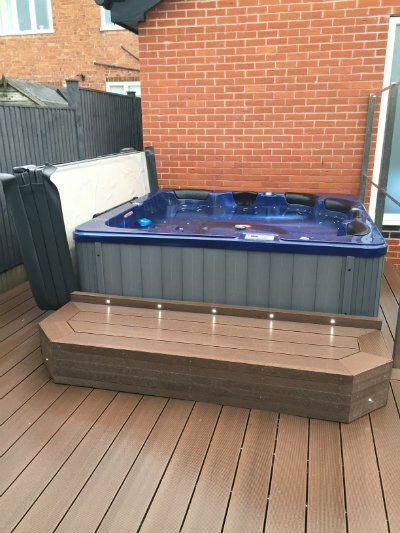 If you need a quality product matched with fantastic service , then i have no hesitation in recommending hot tub suppliers. Dave ordered a Perseus in pebble grey with a grey cabinet. Excellent service and communication from Arun. Everything happend as they said it would. Very good to deal with. 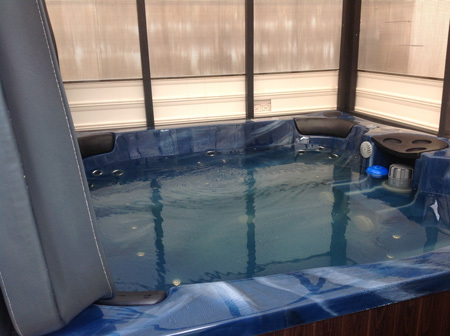 We wanted a hot tub for my family and especially for my wife who needed hydrotherapy. 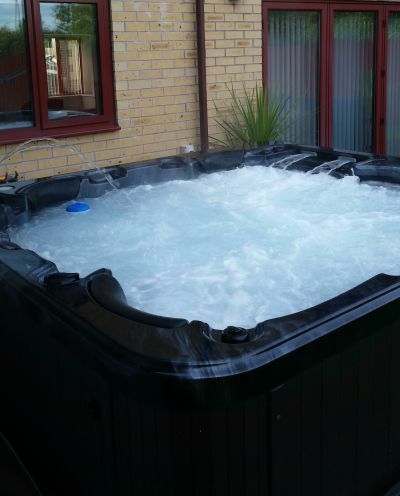 We asked hot tub suppliers for a reliable hydrotherapy hot tub at a good price and looked attractive. Not only did we receive all the requirements listed above but in addition we received proper personal & genuine customer service and the Perseus is even better than it looked on the website. 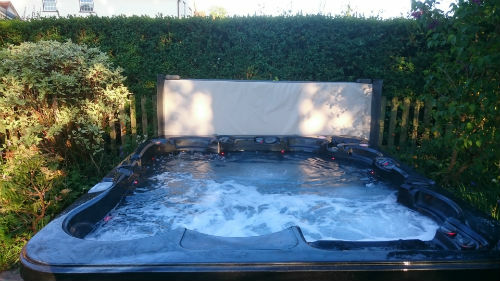 The delivery team were also excellent and helpful with our postion in the garden, so in summary i have no doubts in recommending hottubsuppliers for anyone looking for a luxury hot tub. Andy ordered a Perseus Deluxe in pebble grey with a grey cabinet. 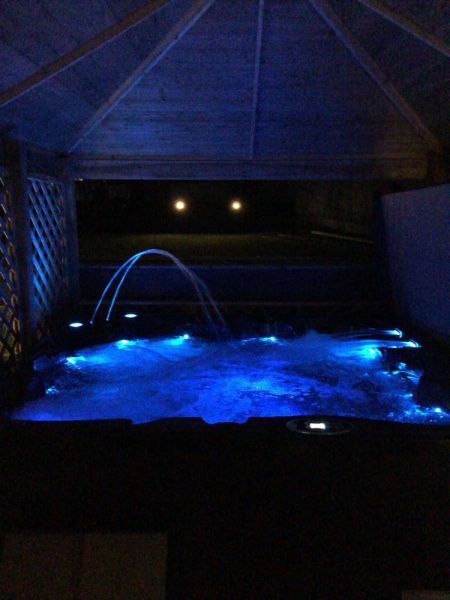 This year we bought the Poseidon from hot tub suppliers and we received the best possible customer service and are very happy with our hot tub . 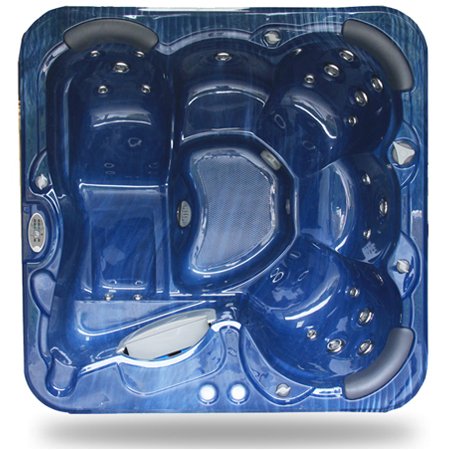 We have bought hot tubs before and this is compares very highly and the cost is fantastic. 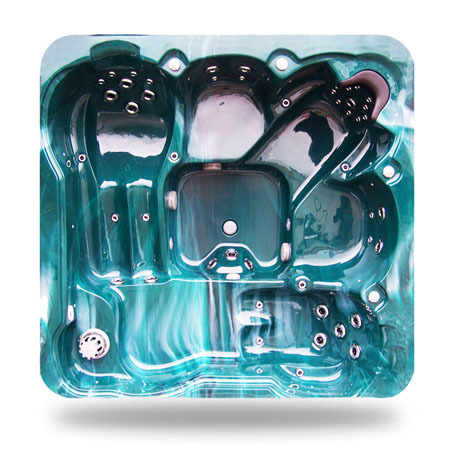 For the product and the excellent after sales service and the prices, we strongly recommend hot tub suppliers as a quality supplier of luxury hot tubs. Fred ordered a Poseidon in pebble grey with a grey cabinet. Malcolm ordered a Pontus Deluxe in mosaic blue with an oak cabinet. Thank you Arun for your friendly service, it has been great to deal with your firm. 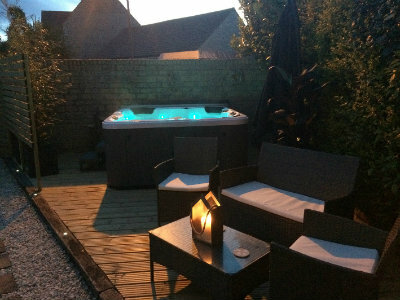 Our Hot Tub is now taking pride and place in our garden and getting used to the max. We even spent all Boxing Day in it, which was fantastic. 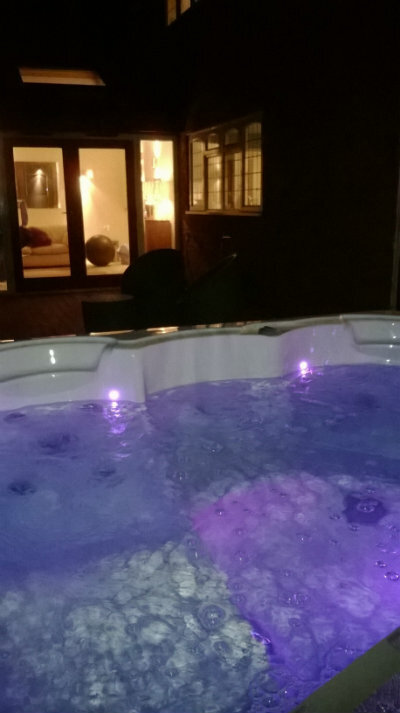 The Perseus hot tub is one of the best things we have treated ourselves to in a long time, we love it. I work in a gym so it is the perfect way to unwind after a hard day. Shane & Emma ordered a Perseus Deluxe in pebble grey with a grey cabinet. 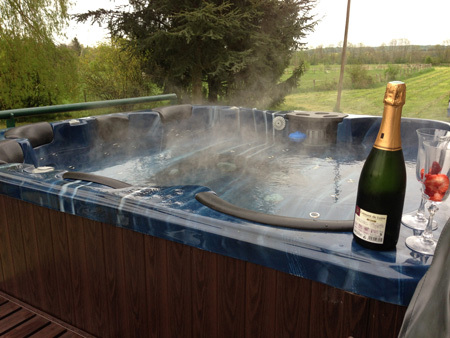 We purchased a Countesa Hot tub , Seats: 4 Adults + 1 Lounger from Hot Tub Suppliers in July 2013. 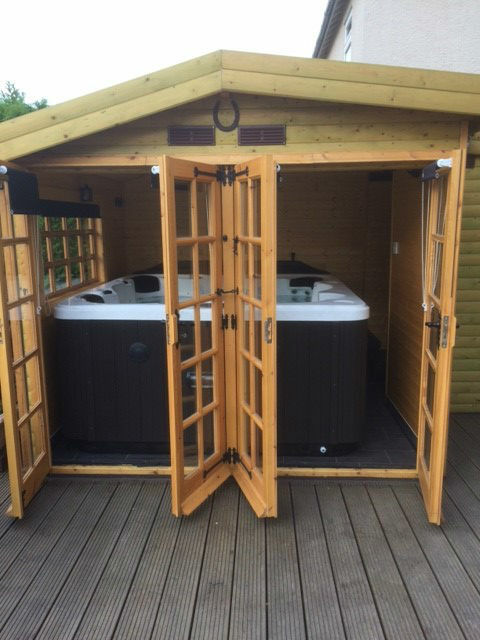 We paid £299.00 deposit online to secure our Hot tub, The next working day we where contacted with confirmation of our order, and we were advised of potential delivery date. 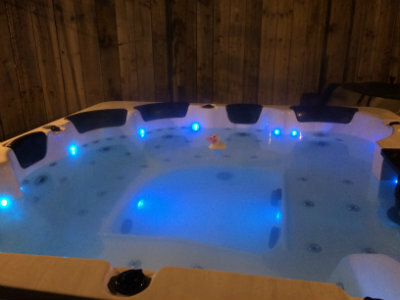 Staff at Hot Tub suppliers were very helpful on any queries we had regarding our hot tub, plus we where given useful information of the requirements needed for the hot tub to work, ie electric cable required, dimensions, space etc. 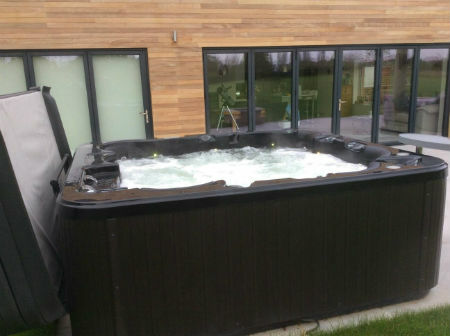 We was contacted with a delivery date that suited around our work commitments, The balance was paid the night before delivery, there was no pressure to pay full balance up front on order ,Hot tub suppliers were happy for balance to be paid just before delivery. Hot Tub was delivered as agreed. 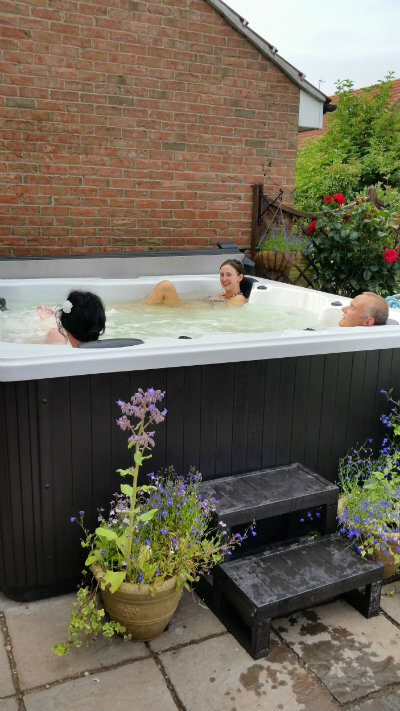 The after care service from Hot Tub Suppliers Limited is excellent,always friendly and helpful even after delivery and sale. Angela & Graham ordered a Countesa in mosaic blue with an oak cabinet. We had issues locating the hot tub to the back of our house, but Arun and his team didn't give up and they ensured it was installed just where we wanted it. 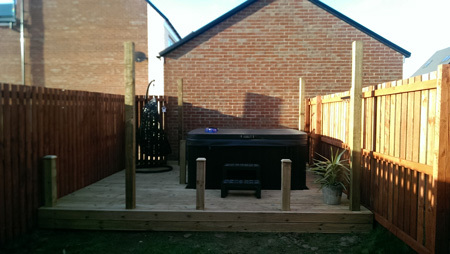 We were very happy with the excellent service we received at the time of purchase and even months later we heard from Arun to ask how we were getting on with the hot tub. 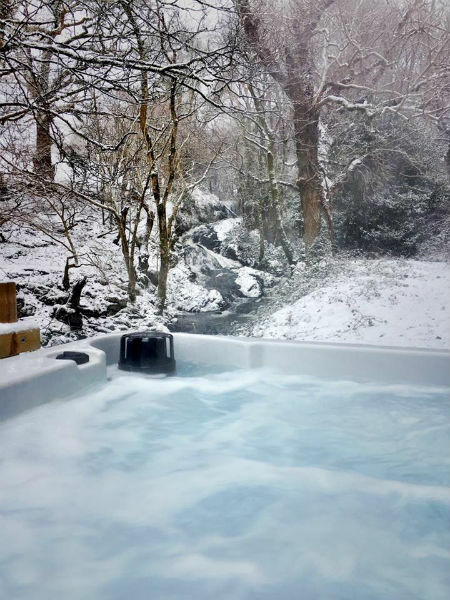 We love our hot tub and are even looking forward to the colder weather as it really comes into its own in the winter! We would like to thank you and your team for the excellent service provided. 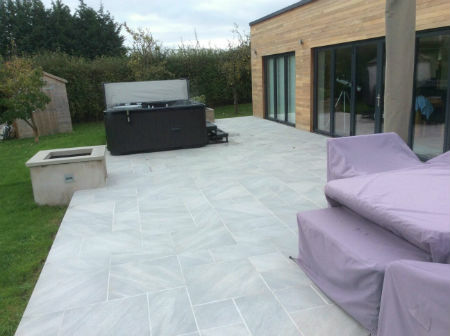 From our initial idea of a Hottub, to the the final delivery and subsequent support after installation, Hottub suppliers services and advice has been of the highest order. A great company where people matter and where ensuring customer satisfaction is central to the companies ethos! After sales advice helped us no end - thank you again! Peter ordered a Pontus in pebble grey with a grey cabinet. Enjoying it every night and my back feels great !! Craig ordered an Emperor in midnight grey with a grey cabinet. Excellent value for money and fantastic before and after service would highly recommend. 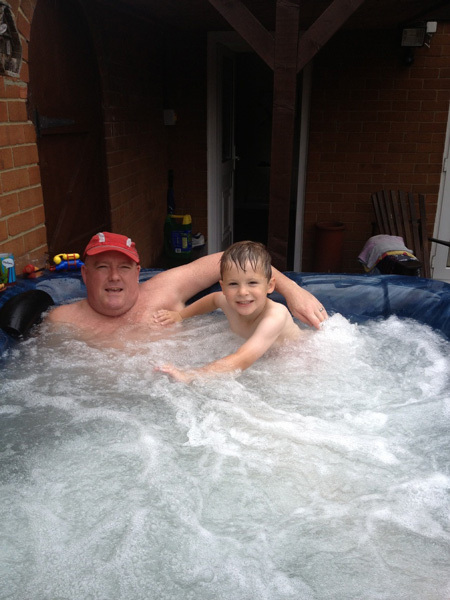 We have got the hot tub up and running and we are enjoying the tub very much. Thank you for your excellent service from start to finish. 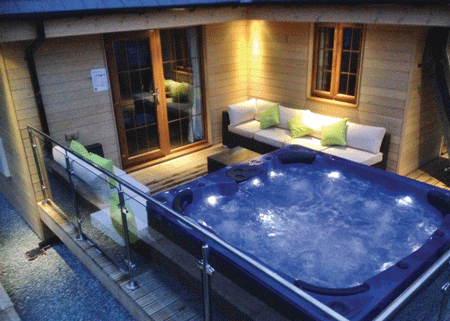 We would highly recommend your company to anyone thinking off purchasing a hot tub, excellent value for money. Caroline & Andrew ordered a Hera Deluxe in pebble grey with a grey cabinet. It was a fantastic day and the hot tub is totally stunning. We love it and thank you for the great service and wonderful tub. Jan & Ronnie ordered a Countesa in mosiaic blue with an oak cabinet. We have had our hot tub for a couple of years now and have had no problems whatsoever. It is well used by our family (and friends!) and we have thoroughly enjoyed it. 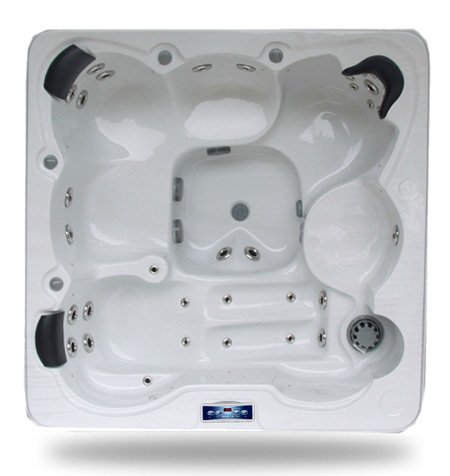 I would recommend Hot Tub Suppliers for their helpfulness and competitive pricing. 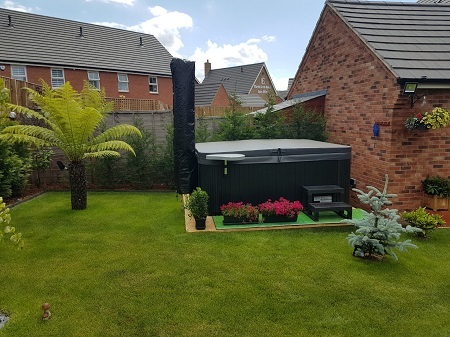 We are so happy with our Perseus hot tub from hot tub suppliers, from day one when we first made our first enquiry we received great service and every question we asked was answered with no fuss and with great detail. 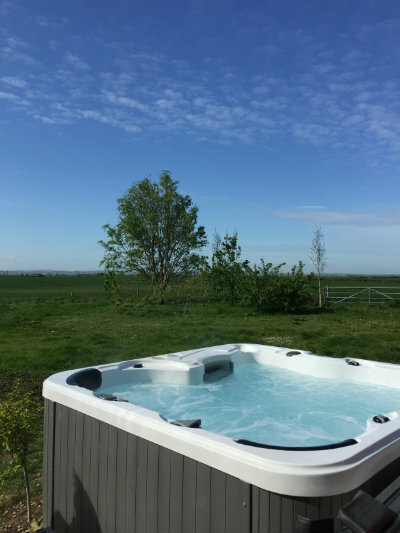 it was great to buy a hot tub from a good local hot tub company and we would recommend hot tub suppliers not only for people looking for a luxury hot tub in Leicestershire, but all over the UK. Gary & Tracey ordered a Perseus Deluxe in mosaic blue with an oak cabinet. I use the tub every day and really enjoy it I would recommend you and your company highly as there has been no hesitation in solving The few queries I have had. Margaret & Jim ordered an Apollo Deluxe in mosaic blue with an oak cabinet. A great company to deal with. 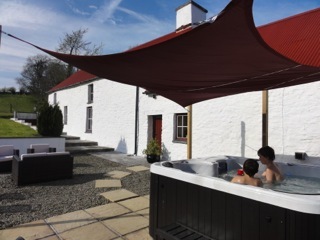 Product is superb, we bought the Countessa for use in our holiday cottage so it gets a lot of use and a lot of abuse Still up and running and it gets of lot of admiration from our guests. Arun was extremely helpful and nothing is too much trouble for him. I thouroughly recommend hot tub suppliers. Kim & Eddie ordered an Athena Deluxe in mosaic blue with an oak cabinet. 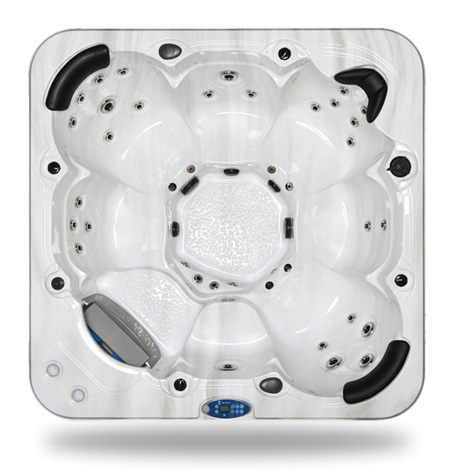 We purchased the Zeus hot tub, it is a fabulous hot tub, the best we have ever experienced. The customer service is second to none nothing to much trouble. If you have a query or unsure of anything, your email or call is answered straight away, can't fault the service. Delivery was also perfect, arrived on time, and very processional. Thank you very much, Kev and Sue from Norfolk. Mr & Mrs Robinson ordered a Zeus Deluxe in mosaic blue with an oak cabinet. Excellent customer service before and after delivery and an ongoing interest from management . I thoroughly recommend Arun and his team. Best value that I found anywhere. Ross ordered a Perseus Deluxe in mosaic blue with an oak cabinet. Jay ordered a Pontus Deluxe in mosaic blue with an oak cabinet. Recently purchased a countesa..couldn't be happier!!!! 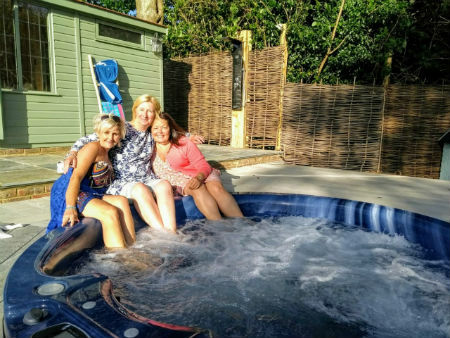 I recently purchased my Athena hot tub from hottubsuppliers, i can’t fault the team there they have been very helpful to me, it’s really nice to have some old fashion customer care service when it is needed well done !!! I have been enjoying my hot tub for the last 4 months along with family and friends & it’s great! 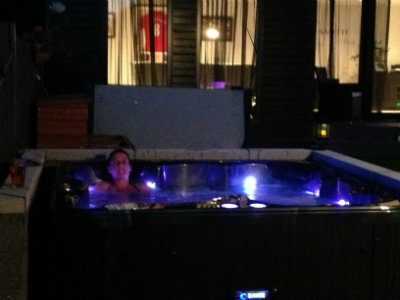 I would recommend hottubsuppliers to anyone who is thinking of getting a tub. William ordered an Athena Deluxe in atlantis green with an oak cabinet. 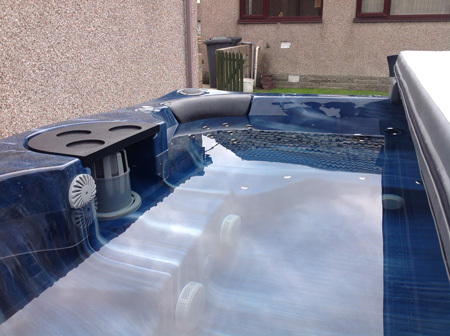 Hi Arun, just a line to say we are delighted with the service and the quality of our Zeus hot tub. As you can see fully installed and working, my children are always in it and love it. Will & Sasha ordered a Zeus Deluxe in mosaic blue with an oak cabinet. 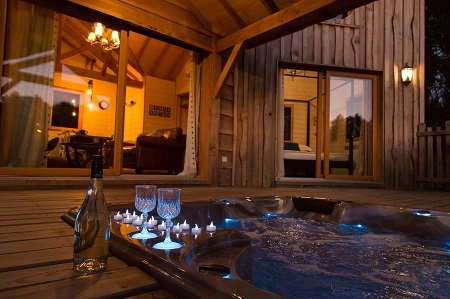 I love my hot tub, it's great place to relax at the end of the day with a glass of wine and watch the stars in sky. 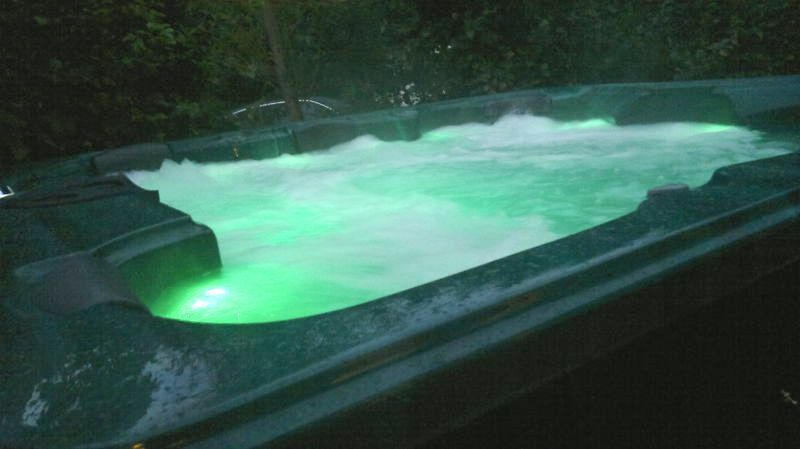 It's the best item I have brought for my garden and the Hera hot tub is very powerful and great value for money. 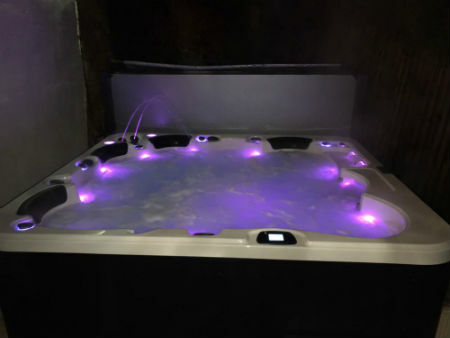 Having looked at many dealers and websites , we decided to buy from hot tub suppliers as the product and prices was very good. 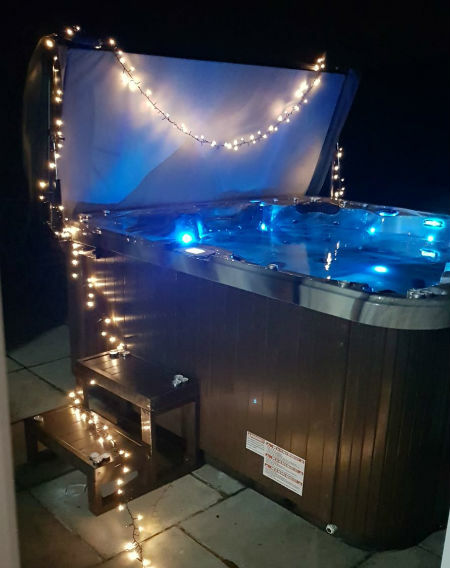 we have a Zspas Poseidon hot tub and having bought hot tubs in the past we was impressed with the structure of this tub with the stainless steel frames where our previous hot tub was wooden . 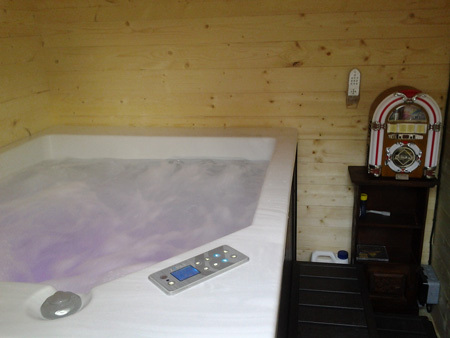 also the hot tub had the right balance of jets to pumps so the quality of hydrotherapy is also very good. Mick & Michelle ordered a Poseidon in atlantis green with an oak cabinet. We bought our hot tub from Hot Tub Suppliers and Arun was fabulous. 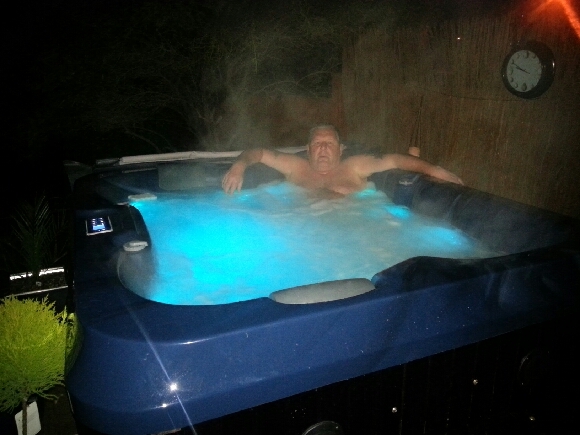 He gave excellent customer service and we have kept in touch with him when we have needed help or advice about our tub. We use the hot tub all the time with our family and friends and its one of the best things that we've bought in many years. We would highly recommend Arun as a guy to buy from as he genuinely understands what good old fashioned customer service is all about !! Get a hot tub, they're fabulous and a great way to unwind and/or have some fun. 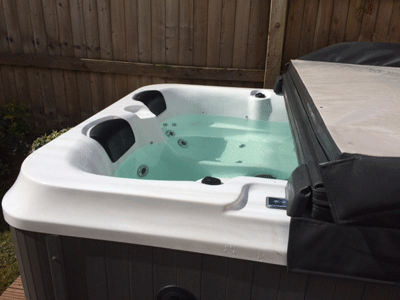 The Apollo hot tub has lived up to our expectations and we are very pleased with the product. Richard ordered an Apollo Deluxe in mosaic blue with an oak cabinet. 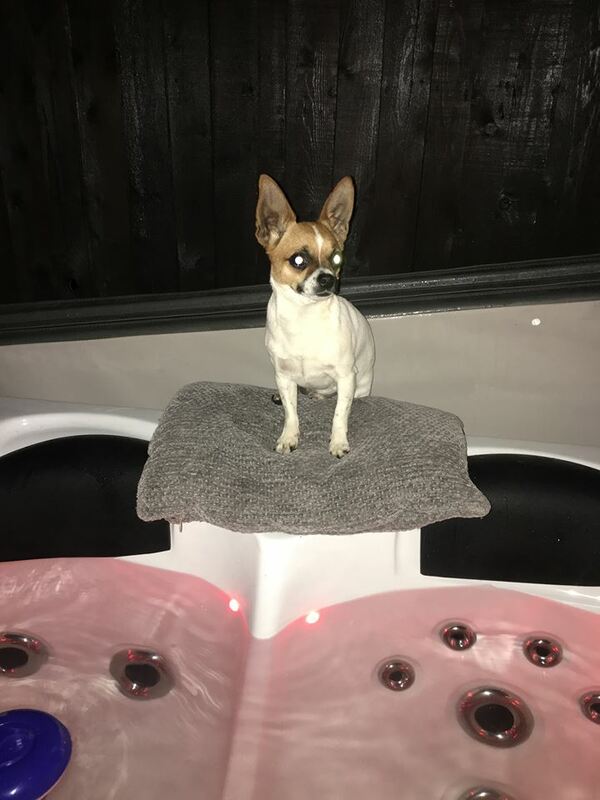 As I work away allot, it’s great to get home and relax in our zspas hot tub, we wanted to treat ourselves to some luxury and this hot tub is exactly that plus more! Stephen ordered a Zeus Deluxe in atlantis green with an oak cabinet. 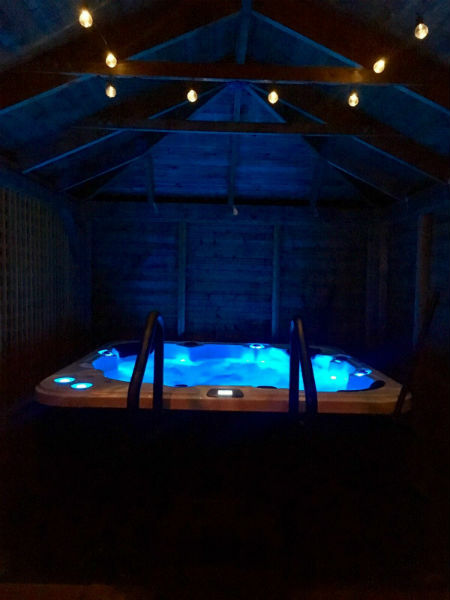 We are so happy with our Zeus hot tub , it’s the best thing we have ever bought and would recommend hottubsuppliers for the fantastic product and service. Wendy & Brian ordered a Zeus Deluxe in mosaic blue with an oak cabinet. 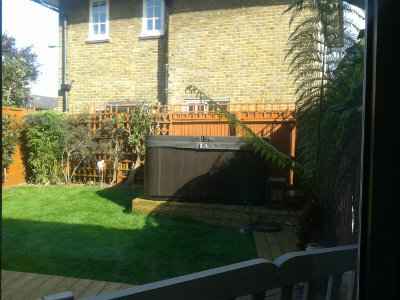 Our main reason for wanting a hot tub was that we wanted to be able to use our garden all year round and also for entertaining in. 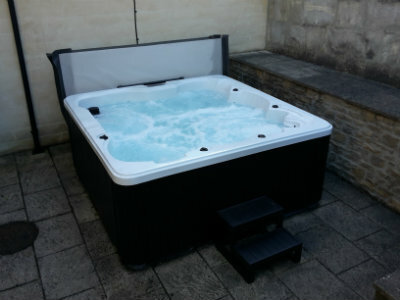 We chose hottubsuppliers.com because their prices were far more reasonable than anywhere else we could find. 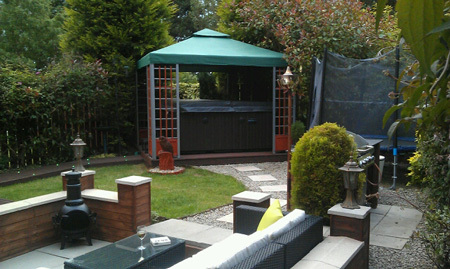 We spoke to them a lot before ordering and they always came back to use quickly and were very helpful – we didn’t want a lot of hassle and Arun sorted out a crane for us to get the tub into our garden. The tub itself is amazing – it really is the height of luxury. We have had it for a few months now and have had no problems with it. Our friends love it too. We have found that it reduces stress levels and actually prefer it when it’s wintry outside to when it’s hot – it is amazing in the snow. Duncan ordered a Perseus Deluxe in pebble grey with a grey cabinet. everything is great, thanks again for the excellent service. Dave ordered the Countesa in pebble grey. 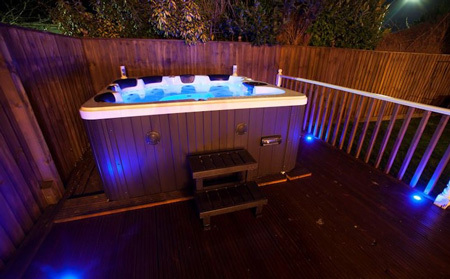 Fantastic hot tub, unbeatable prices and brilliant service ! Gary ordered a Zeus Deluxe in mosaic blue with an oak cabinet. 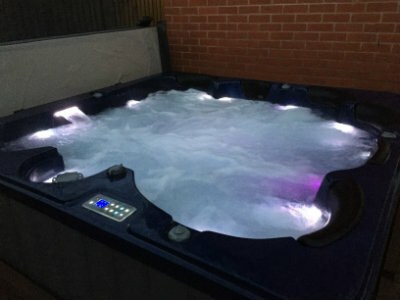 As I have my own business and work long hours I found it hard to make time to buy a hot tub, luckily I found hottubsuppliers.com that made the purchase very easy with their easy to follow web site plus friendly very helpful customer service. 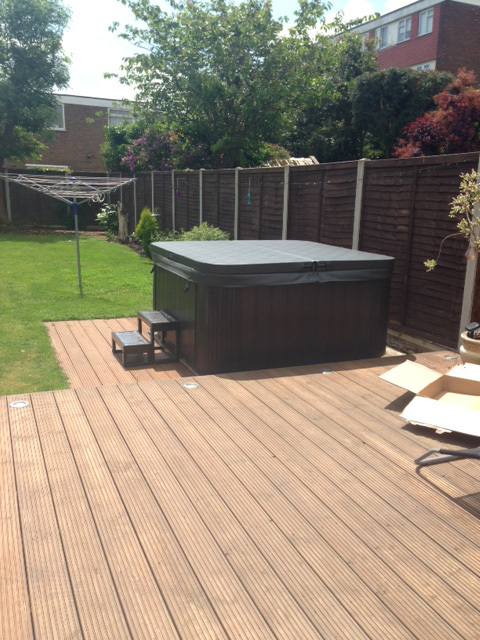 My hot tub was delivered very fast and the quality is fantastic, we are really happy. Matt ordered a Zeus Deluxe in pebble grey with a grey cabinet. tweet 1 A great way to start your day. Thanks @hottubsuppliers for an excellent service. Shaun ordered an Apollo Deluxe in pebble grey with a grey cabinet. Julia ordered a Perseus Deluxe in pebble grey with a grey cabinet. 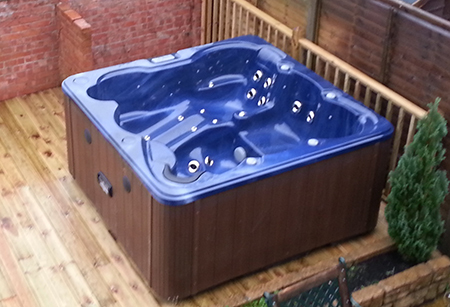 As we are Leicester based it was great to be able to come over and view our hot tub before we ordered it. 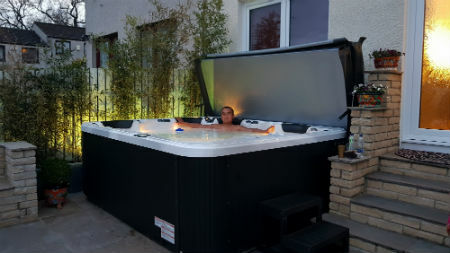 Hottubsuppliers organized all the deliveries and the crane required for our delivery so we can only say thanks allot for a excellent product and service. Louis ordered an Apollo Deluxe in mosaic blue with an oak cabinet. 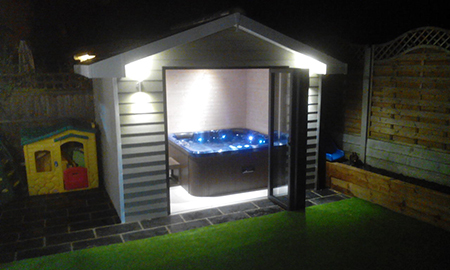 I have recently bought the Pontus hot tub and was very impressed with the customer service this company provides. 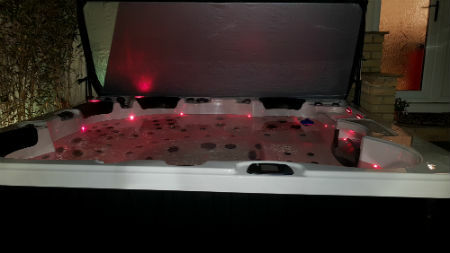 As this is the first spa I have owned, I did a lot of research to begin with and chose to buy from hot tub suppliers based on reviews about their service. From my first enquiry, Arun has been most friendly and helpful - nothing has been too much trouble for him. The challenge we faced was getting the tub into my garden due to my location and Arun sourced a crane company near by to assist with the delivery to hoist it over my wall. 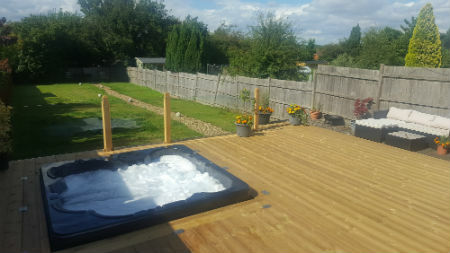 I then decided to build a new decking area for the tub to sit on as a feature of the garden to which Arun was most patient and kept in contact to make sure I was happy before the tub was delivered. I also work out of the country for a few months at a time and was relying greatly on Arun and my family with the final arrangements. From my initial inquiry to date the support and service provided from everybody has been second to none. Simon ordered a Pontus Deluxe in mosaic blue with an oak cabinet. 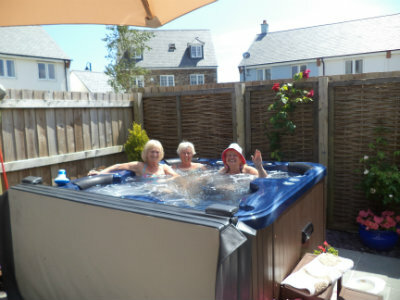 We bought our Countesa hot tub from hottubsuppliers in Leicester on the internet about 4 months ago. The price was the most competitive we could find, they was honest about the delivery time and appeared very genuine to speak to. 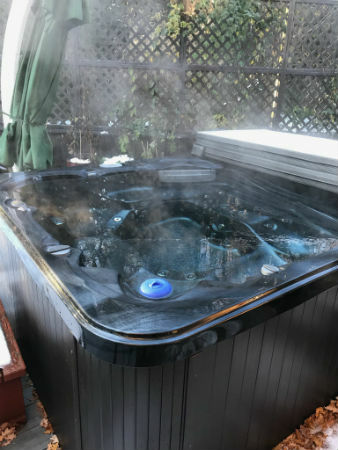 The hot tub had a slight hitch where the diverter was stuck, after informing Arun he got a specialist out immediately, obviously without charge, the problem was solved quickly. He has sent numerous videos that have helped me understand the working of the tub, the videos were clear and easy to follow. Would recommend the company to one of my friends if they wanted to purchase a tub. 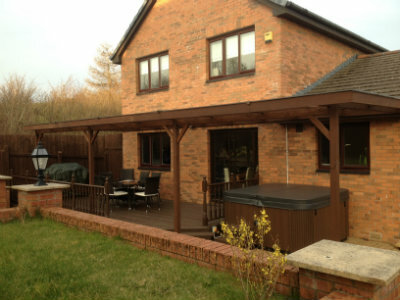 Before buying a hot tub we looked at a number of hot tub suppliers to finish our new house build. The cost always seemed to be very expencive so we were very supprised to find your organisation. From the first conversation with hot tub suppliers all our questions were very quickly answered. We decided to purchase the Countesa in pebble grey. The process was very easy from start to delivery. I would recommend this organisation. We have used the Countesa most days but the night time after work is even better with the lights on and the music just adds that an extra touch of relaxation. Thanks for help – love the tub btw ! Great for everyone with different seating positions to suit all. We had a music system added which adds to the experience together with changing lights. Quick and easy installation with continuing after service.